"Remember the former things long past"
"I will remember your wonders of old." 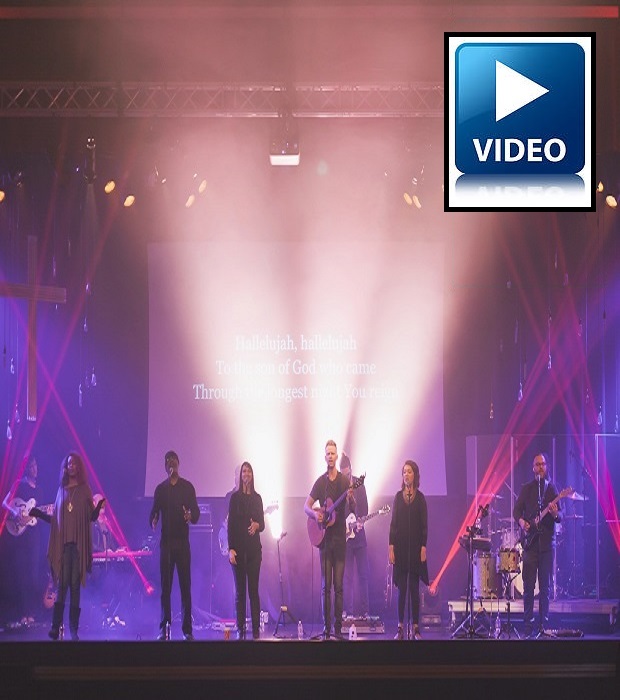 "Make them known to your children"
The Night Divine Newsvine connects you with decades worth of music history from Christian artists in SE Wisconsin. This history book is still being written! 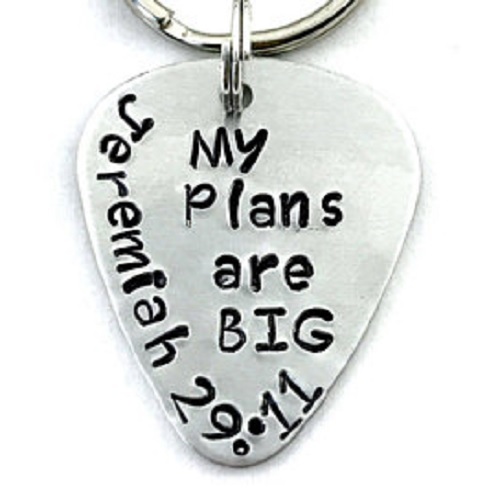 See our front page to see who is playing Christian music right now! Please contact us with anything we've missed. "I remember the days of old; I meditate on all that you have done; I ponder the work of your hands." "I will remember the deeds of the Lord; yes, I will remember your wonders of old." 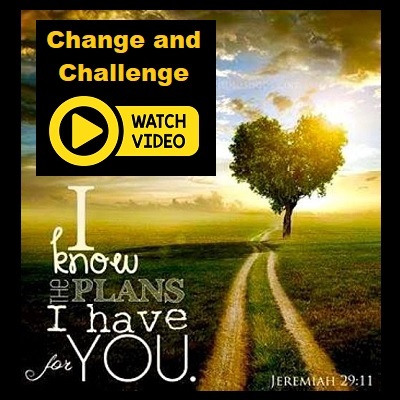 "Only take care, and keep your soul diligently, lest you forget the things that your eyes have seen, and lest they depart from your heart all the days of your life. Make them known to your children and your children's children"
"Remember the former things long past, For I am God, and there is no other; I am God, and there is no one like Me." 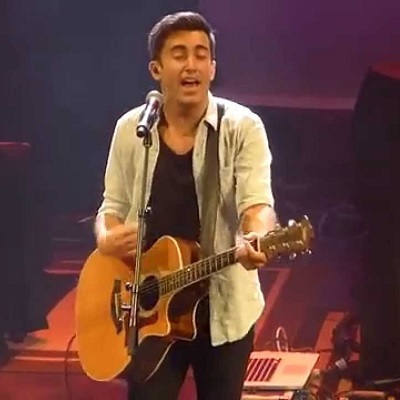 Enjoy an intimate evening with Phil Wickham and Friends at WeatherStone Church in New Berlin, Wisconsin. 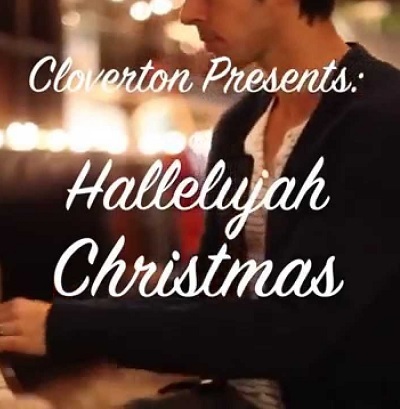 Cloverton gave Leonard Cohen's timeless classic "Hallelujah" a Christmas makeover last year and the result is a truly moving cover. The boys take Cohen's iconic melody and infuse it with lyrics chronicling the birth of Jesus Christ. 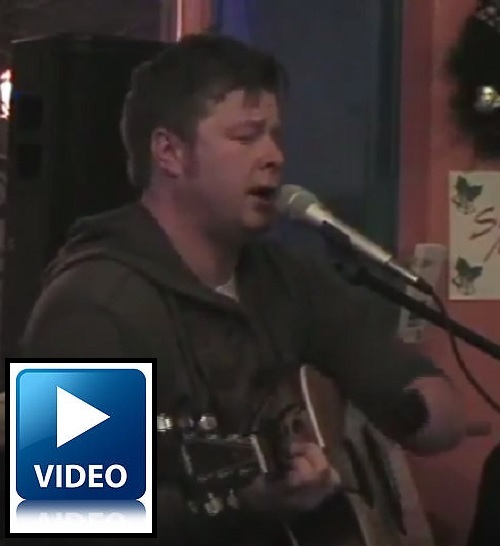 This song hits an emotional chord as vocalist Lance Stafford gives it his all. 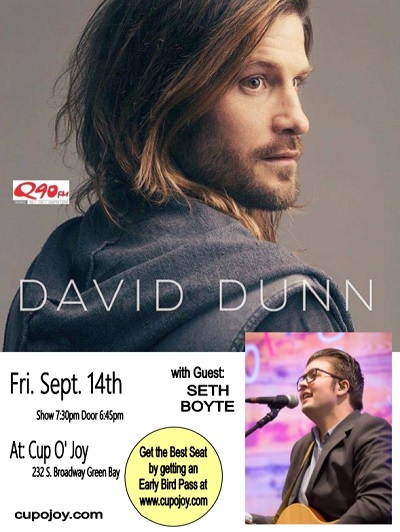 See them live at the Cup O Joy with with special guest Dan Bremnes, a Canadian Artist with a New CD entitled WhereverIGo. Hard Rockers Disciple bring their latest release, Long Live The Rebels, where the two-time Dove winners brought in Aaron Sprinkle to head production on a melodic metal set that sounds as tight as anything in the band's catalog. From the great melody and killer solo on "Forever Starts Today" to the '80s-meets-modern feel of the title track to the intensity of "Secret Weapon," Disciple have given fans plenty more of what they want and then some. 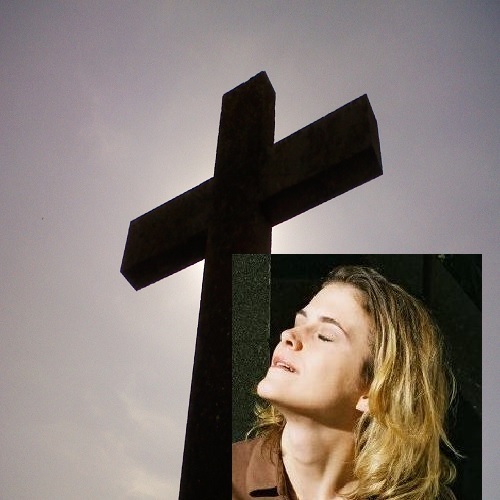 Internationally acclaimed singer/songwriter and classically trained violinist Jean Watson began her career as a Christian recording artist after having experienced the depths of brokenness and depression. It was her own brokenness that infused her music with such beauty and compassion. 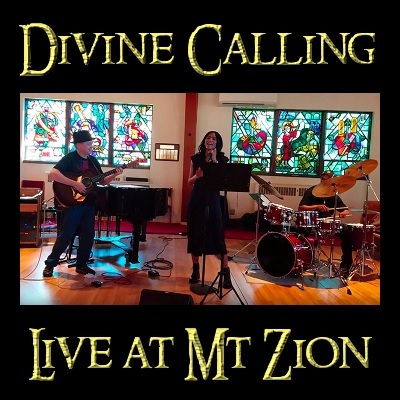 She has recorded seven albums to date including her latest CD "Steady My Gaze" featuring Grammy nominated producer Billy Smiley, guitar virtuoso Phil Keaggy, and John Ellis of Tree63. Jean's musical style is eclectic and features an abundance of celtic-infused violin and her signature haunting vocals. 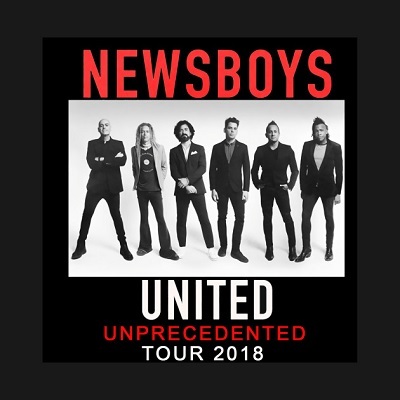 Playing to capacity audiences during a history-making string of spring and summer shows, the unprecedented Newsboys United Tour has been extended through the end of the year. 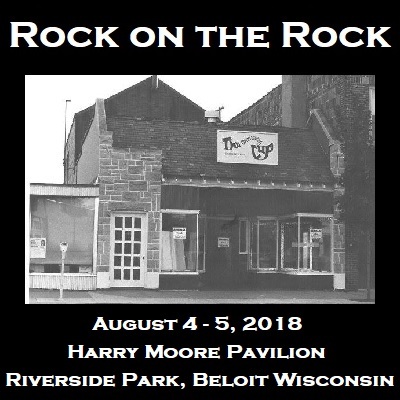 In November, they're visiting the Crystal Grand Theater in Wisconsin Dells. Tre Principesse's First Album "GETTING TO KNOW YOU" debuted at #2 on the Official U.S. 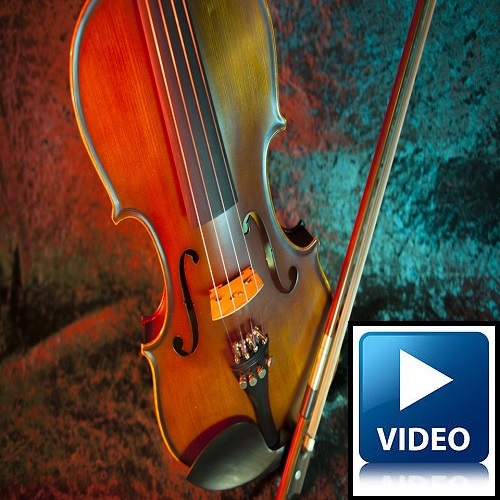 Billboard Classical and Classical Crossover Charts. 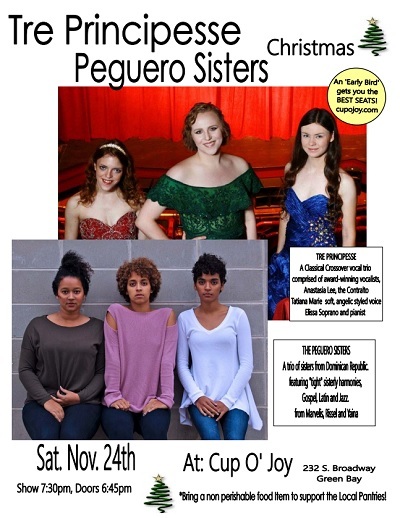 The Peguero Sisters Christmas - A trio of sisters from the Dominican Republic. This musical treat features tight sisterly harmonies in a style influenced by Southern Gospel, Latin and Jazz from Marvelis, Rissel and Yaina. 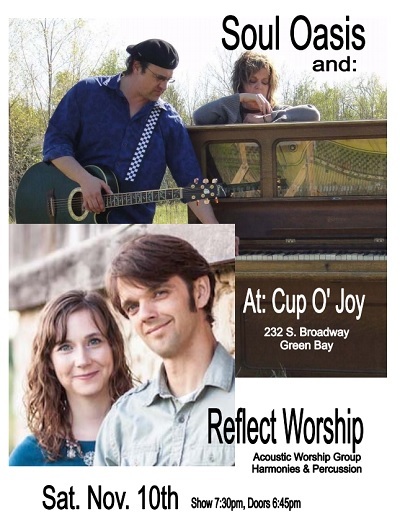 Night Divine is visiting the Cup O Joy in Green Bay, Wisconsin to praise Jesus along with musicians from all over the place at their spectacular Open Mic night. Allies. 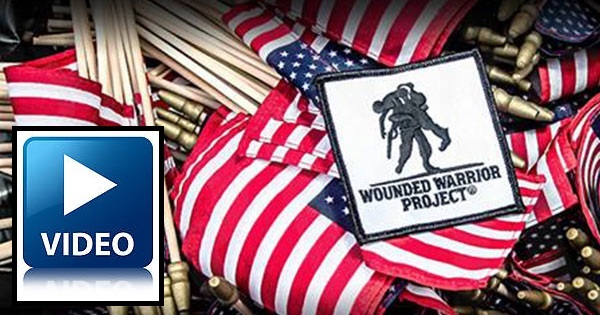 Our wounded vets NEED your help! The Oscar Mike Foundation helps our wounded veterans lead happy and productive lives. 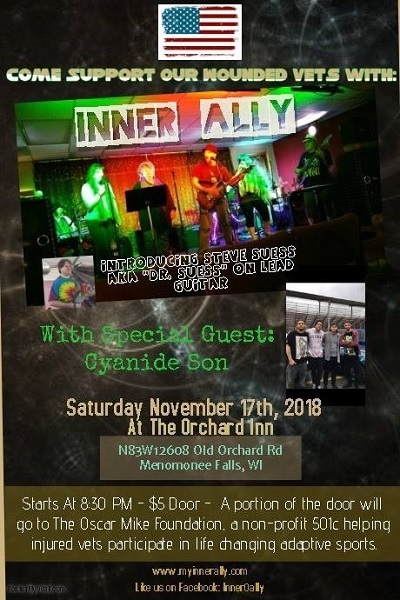 It would mean so much to them if you could join Inner Ally and Cyanide Son on November 17th at the Orchard Inn for a fun-filled concert. 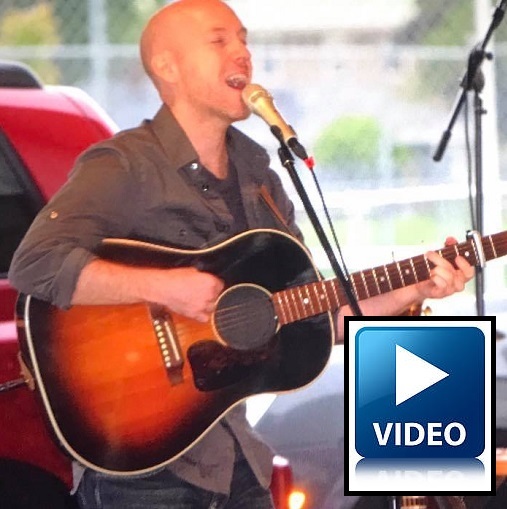 The musical duo of JJ and Dave Heller are a spiritually uplifting combination of dynamically expressive vocals, meaningful lyrics with memorable melodies in an acoustic folk sound. They're bringing a New Lullaby CD. 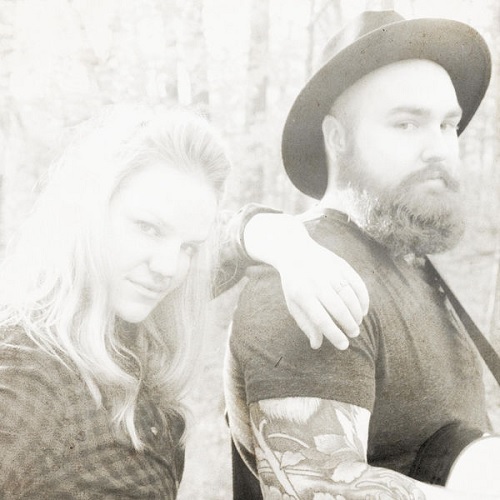 REFLECT - Singer/songwriter husband-and-wife duo Daniel and Catherine Lovett bring the band. Their lyrically driven music can be described as Christ-centered acoustic folk-pop - personal in tone, yet universal in reach, full of depth, character, and an underlying sense of peace. 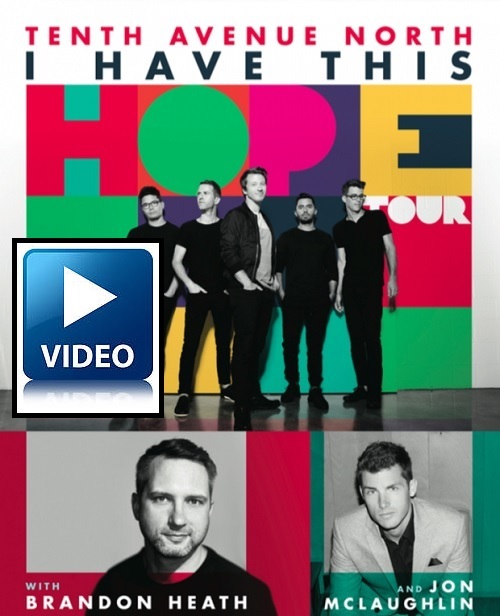 If you like Sara Groves, Jenny and Tyler, or JJ Heller you will enjoy their music as well. SOUL OASIS - Mike and Cindy Albin bring musical oasis for the soul, songs of worship and love to lighten your day and brighten your night. 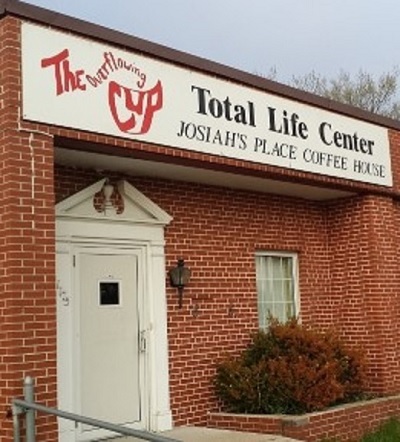 Inner Ally is playing at one of the oldest and longest running Christian coffeehouses in the nation and the world: Josiah's Place / Overflowing Cup T.L.C. in Beloit, Wisconsin. 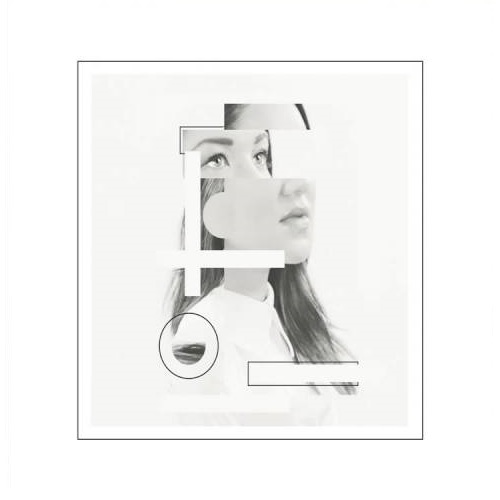 Introspective Poetic Folk from a Milwaukee-based singer/songwriter. The music is subtly written, hand crafted, Americana of the finest quality bursting with a radiant feel. 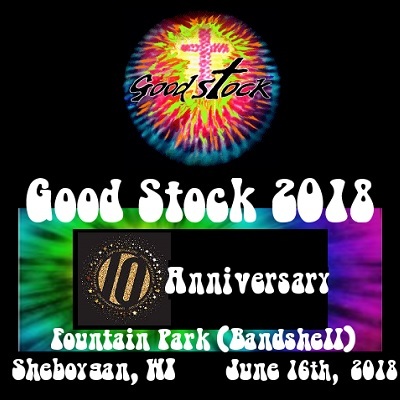 With special guests UNTAPPED POTENTIAL - Eric Grosek and Jesse Merline with an acoustic style that features elements of campfire sing-alongs full of toe-tappin' praise. 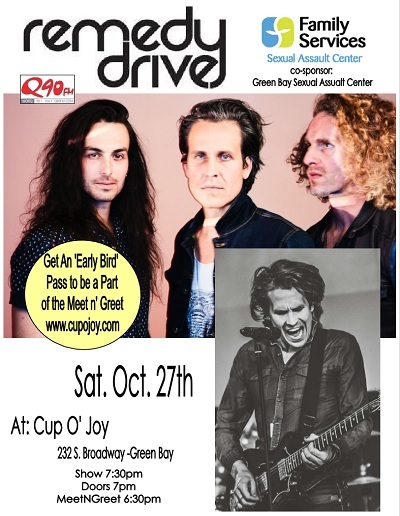 CCM Magazine‘s says that Remedy Drive's new CD, The North Star is one of 2018’s releases-to-remember. 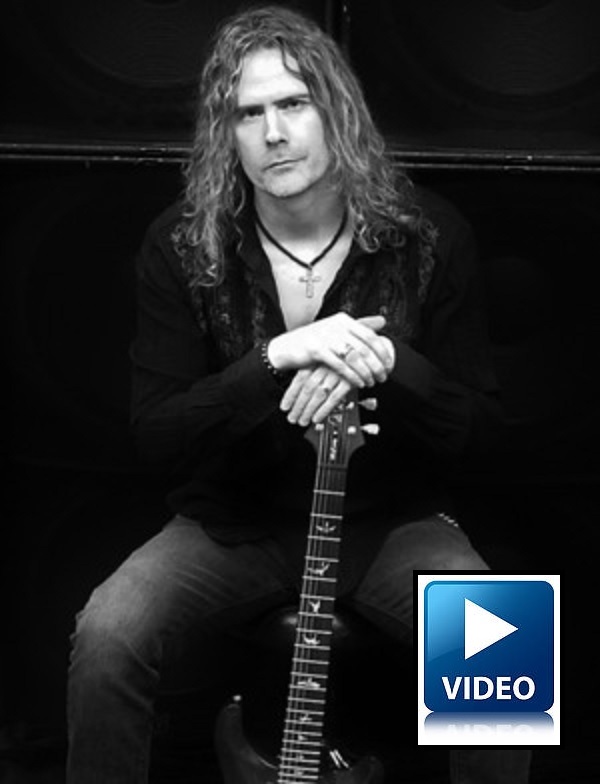 Front man David Zach continues to write and record inspired by and for the benefit of his efforts in abolishing human slavery. Musically speaking, The North Star incorporates a nice and unique blend of 80’s-tinged jangly guitars and squeaky-clean synth-pads, complete with notes of modern hip hop and dissonant tones that are just uncomfortable enough to move us from our chairs. 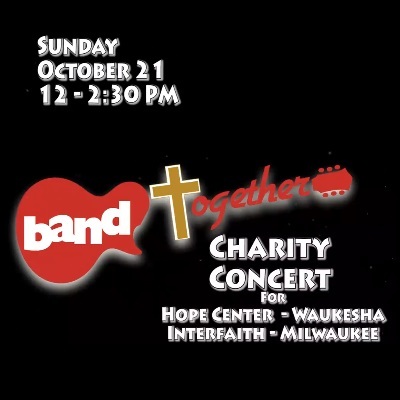 This faith music charity concert for Hope Center Waukesha and Interfaith Milwaukee included music from the Fox River Church Praise band, Community Baptist Choir and Tracy Hannemann. 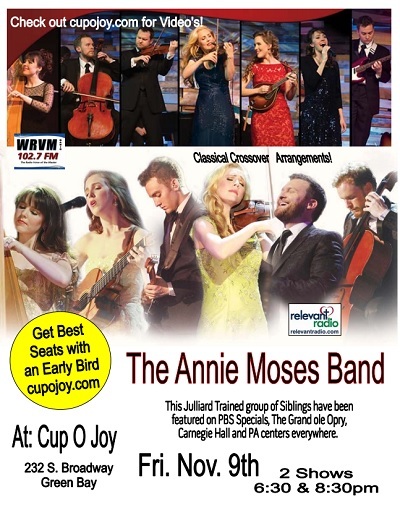 The 29th Cup O Joy Annual Benefit Concert took place at the Ashwaubenon PAC, 2391 South Ridge Road in Green Bay, Wisconsin. 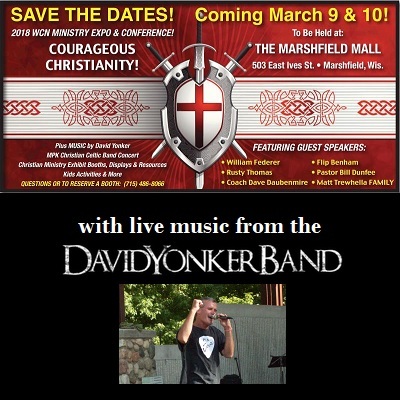 This event featured music from Layton Howerton, Rusty Thomas, Matt Trewhella and David Arthur, plus lots of other inspirational activities both Marshfield and Milwaukee. 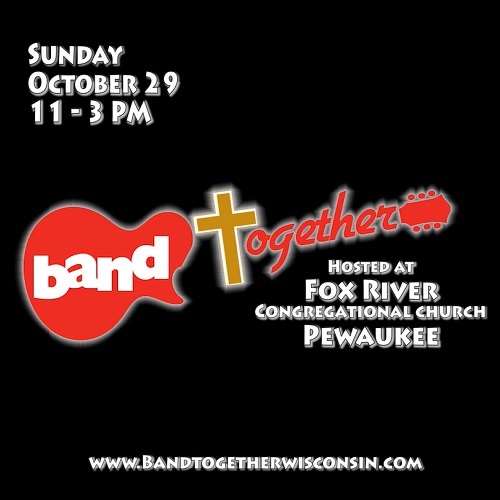 Please visit Wisconsin Christian News for full details. 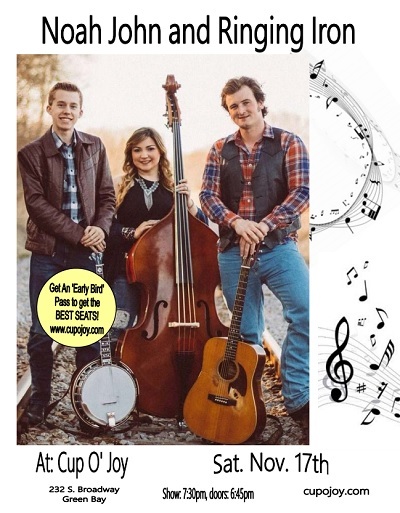 Filled with beautiful family harmonies, skilled musicianship and a love for bluegrass and acoustic gospel music, the Siegmann Family will leave you feeling charmed, moved and inspired all at the same time. 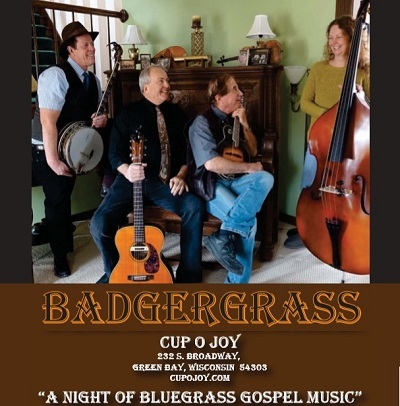 Their style is described as bluegrass, southern gospel, acapella and acoustic music and they had their new CD for the show at Green Bay's Cup O Joy. Shawn McDonald is one of music's most respected and soulful troubadours recently released the project, BRAVE. The single "We Are Brave" went #1 on CHR. Shawn entered the music scene in 2004 with Simply Nothing. He since released Risen (2006), Roots (2008), Closer (2011) and The Analog Sessions (2012). 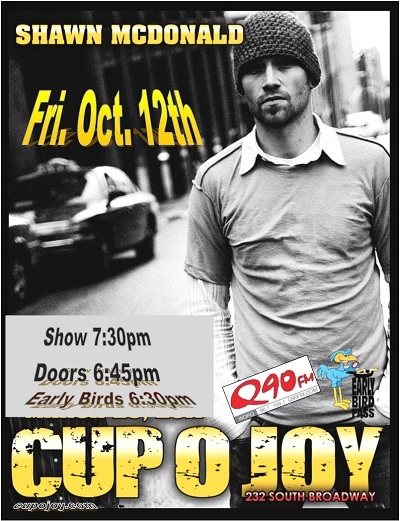 On Friday Night, October 12, Shawn brought new music and a cello accompaniment to Green Bay's Cup O Joy. 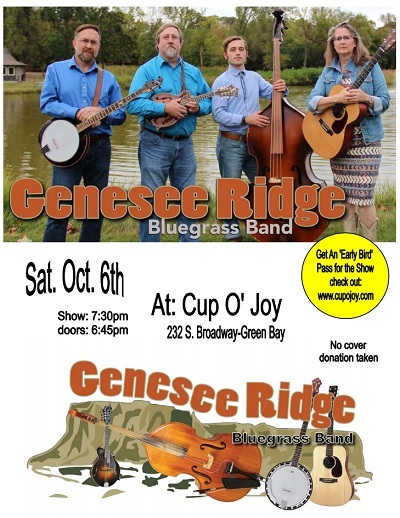 Genesee Ridge creates a hard-driving traditional bluegrass sound with sweet harmony vocals playing everything from traditional bluegrass standards to contemporary songs with some Gospel as well. They brought this all to the Cup O Joy in Green Bay. 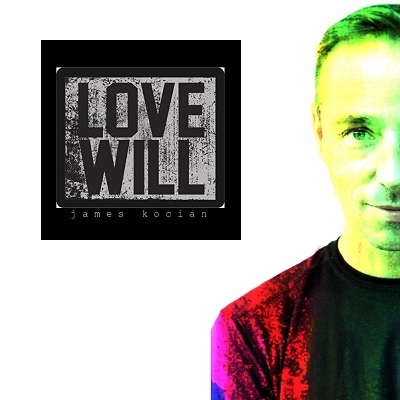 James Kocian returned to the Cup O Joy in Green Bay with a new record, "Love Will." He was fresh off performing for over 31,000 people in Houston, TX at the NRG stadium! His song, "This Changes Everything" was the theme for the 2018 Mass Gathering of the ELCA. He sang all the songs from his new record, as well as some of his songs that have appeared with artists from American Idol, CMT, and more. 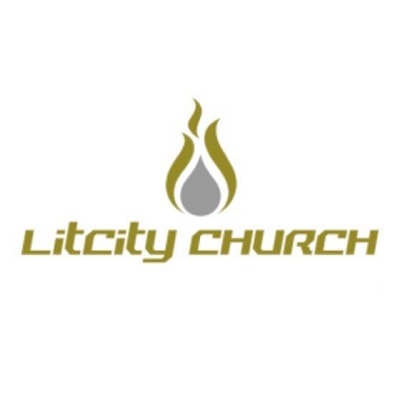 The official LitCity Church grand opening was Sunday, September 30 featuring music from Divine Calling. 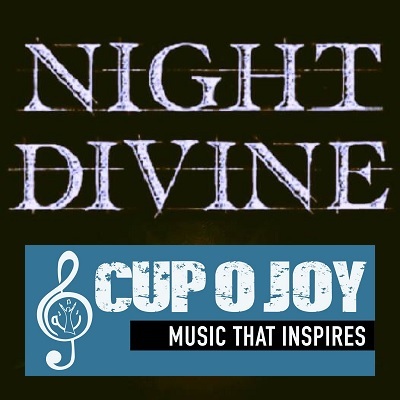 Night Divine visited the Cup O Joy in Green Bay, Wisconsin to praise Jesus along with musicians from all over the place at their spectacular Open Mic night. Singer-Songwriter. Alt pop. Deep-reaching, poetic lyricism. Harmonic. 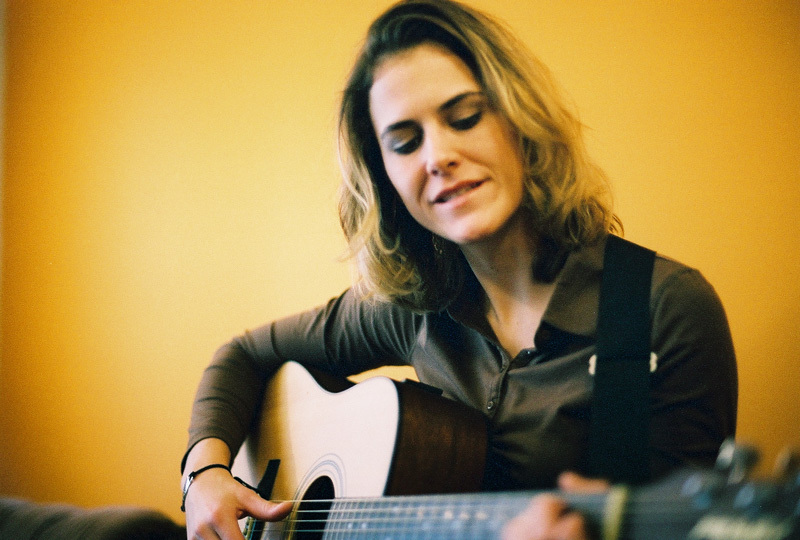 If you love artists like Sara Groves, JJ Heller and Jill Phillips, you'll love Christa Wells. 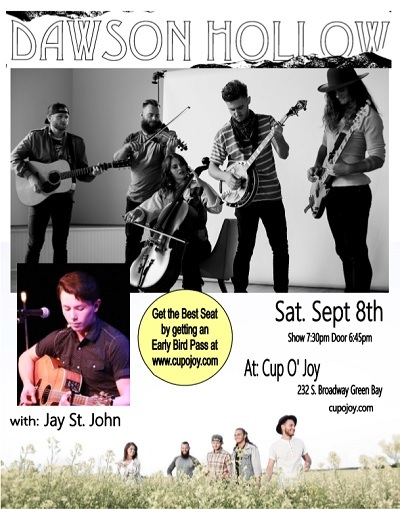 She'll was joined by the unique, soothing, and acoustic style of Kenzie Johnson (with her first single titled "Beautiful") at the Cup O Joy in Green Bay. 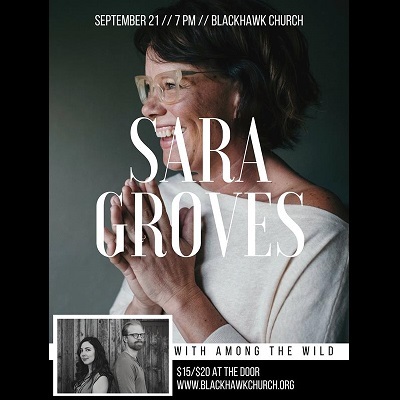 Sara Groves is a singer, songwriter and recording artist with a passion for justice and a heart of mercy. 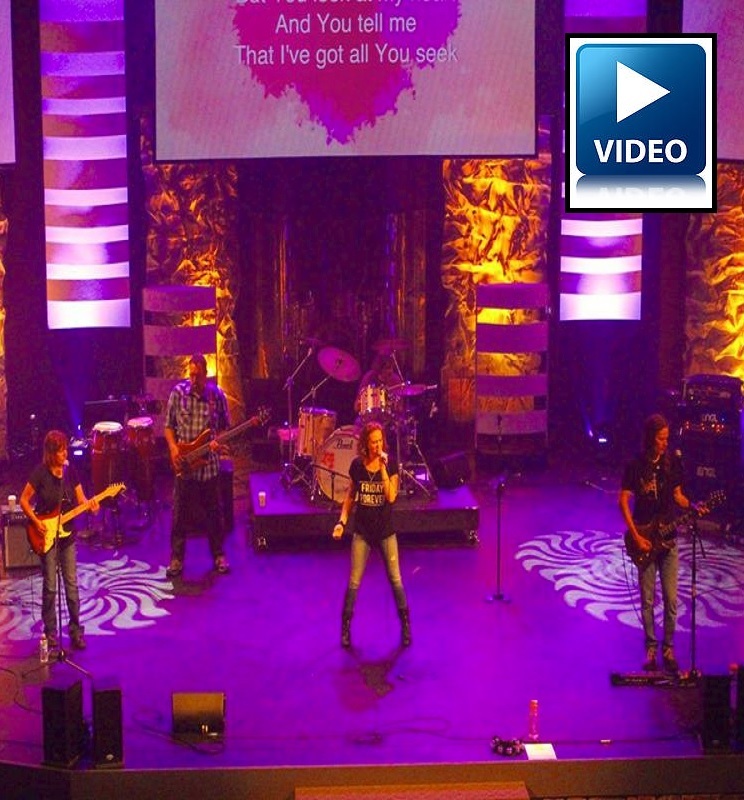 She performed live at Blackhawk Church in Middleton with special guests Among the Wild. 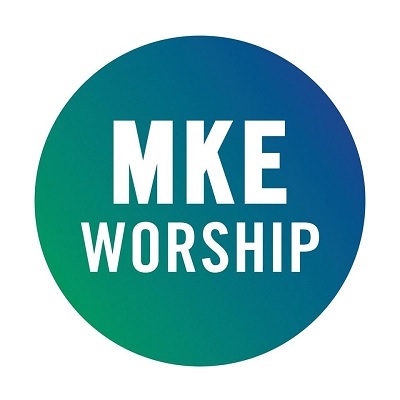 As partners with Eastbrook church, MKE Worship was excited to host another worship gathering. They're passionate about creating an environment where people from all walks of this journey can unite under the grace and kindness found in Christ. 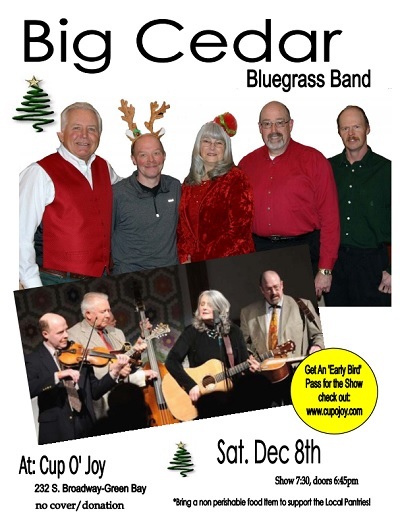 Badger Grass is a bluegrass/country song band with harmony, originals, old and new covers. Their sound is Americana, unique like old time radio. 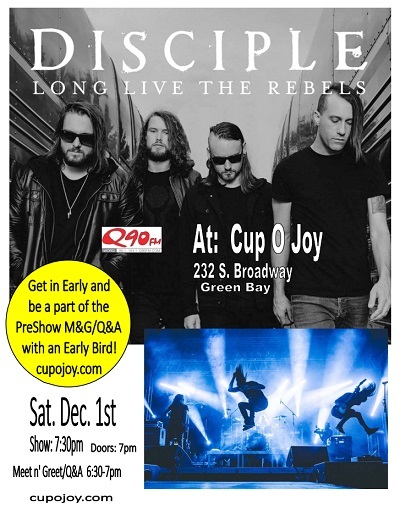 They were live at the Cup O Joy in Green Bay. Dunn's emotions and honesty brings music for the hurting. This means it's for all of us. The lyrics are pensive, honest and at times heartbreaking, and Dunn's vocal delivery is smooth as honey. Hits include "Masterpiece" and "I Wanna Go Back." 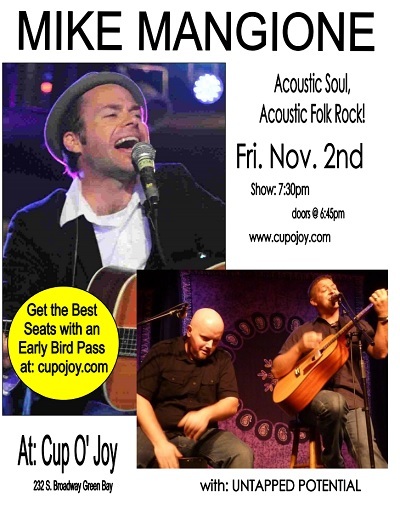 With special guest Seth Boyte at the Cup O Joy in Green Bay. Unknown Artist is the latest album from Milwaukee's Divine blu-tones. This Missouri family brought a kicky indie-folk vibe. Their music encompasses the nostalgia of folk while channeling the urgent and intoxicating energy of indie-rock. Their debut album "Boy Of My Youth" was released in January of 2018 and includes the singles "Lonesome Wolf" and "Take Me There" released in October and November of 2017. At the Cup O Joy in Green Bay. 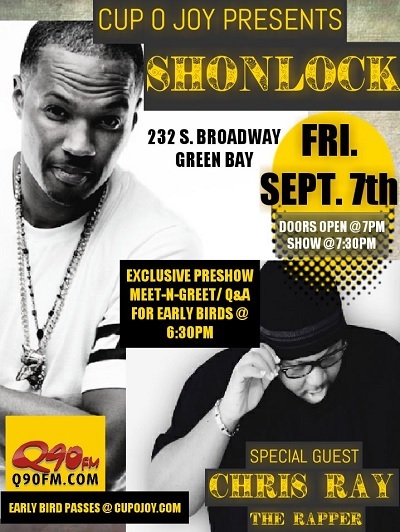 Shonlock is a singer, songwriter, rapper and choreographer who graduated from TobyMac's touring outfit – Diverse City - and launched a successful solo career. Grabbing the #1 spot on Billboard CHR chart’s with his song "Beyond this World." 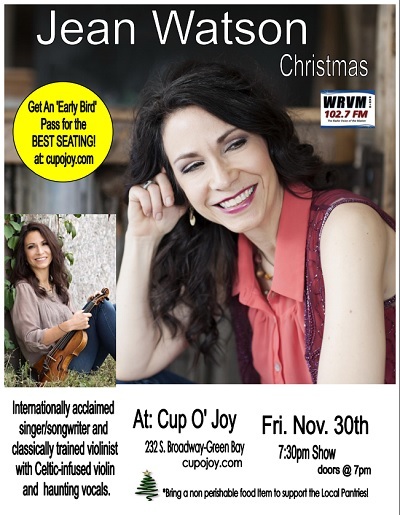 Joined by special guest Chris Ray at the Cup O Joy in Green Bay. 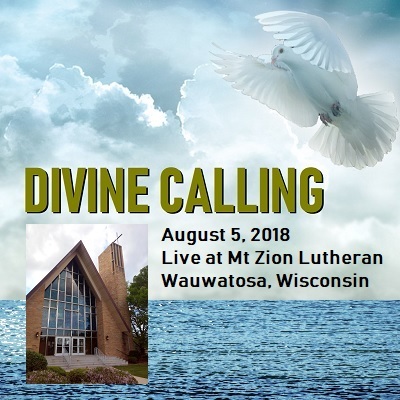 Divine Calling was excited to return to Mt Zion Lutheran Church in Wauwatosa. The first two times they were there, the congregation was so welcoming that they couldn't help being absolutely thrilled about praising Jesus with them again! 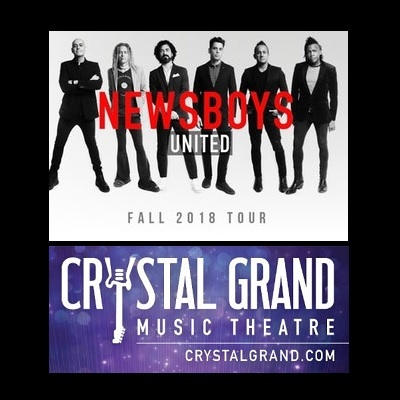 It's no secret that the Newsboys spend a lot of their days on the road. They’re constantly challenged and driven to make powerful, intriguing music that will continue to bring their message of faith to anyone who will listen. On September 2, they brought this power to the Walworth County Fair. 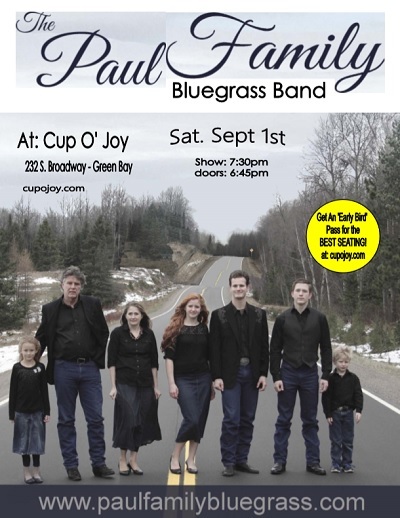 The Paul Family: Mom, Dad and 5 kids from MI traveled to the Cup O Joy in Green Bay with a variety of bluegrass Gospel styles full of instrumentation. 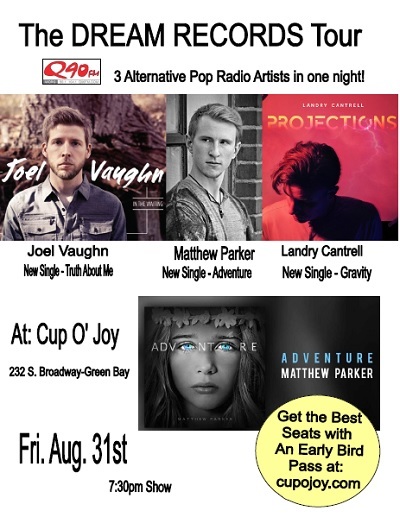 Mathew Parker brought his hits "Adventure" and "Never Giving Up on You" to the Cup O Joy in Green Bay. 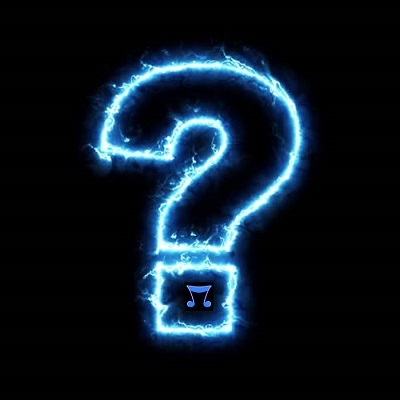 He was joined by Mass Anthem, a pop band originally from the Chicagoland area (now located in Nashville, TN) coming on strong to the scene with their new single "Through People Like Me" and Joel Vaughn who is known for the Top 20 CHR Hits "As You Are" and "Wide Awake." 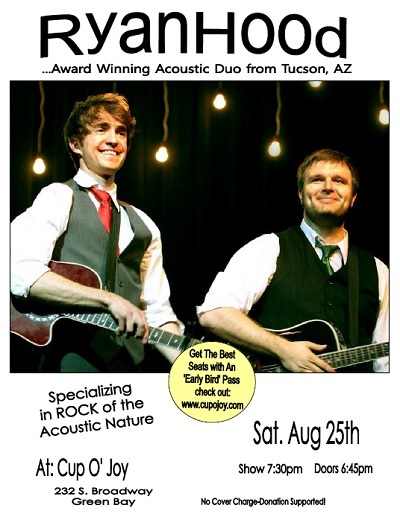 Named "Best Group/Duo" in the 2014 International Acoustic Music Awards, acoustic-duo Ryanhood have performed more than 800 shows in 42 U.S. states over the past decade. They've shared stages with Jason Mraz, Matt Nathanson, Train, and Lifehouse. 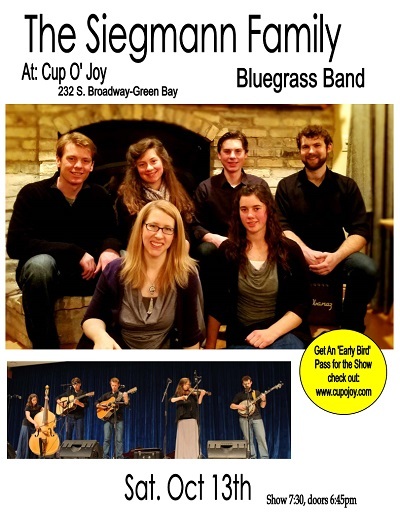 On August 25, they visited the Cup O Joy in Green Bay. 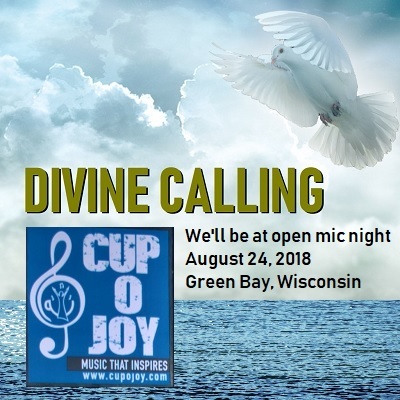 Jim from Divine Calling visited Green Bay, Wisconsin on August 24 to praise and party with Christian musicians from all over the area who played at the Cup O Joy's open mic night! 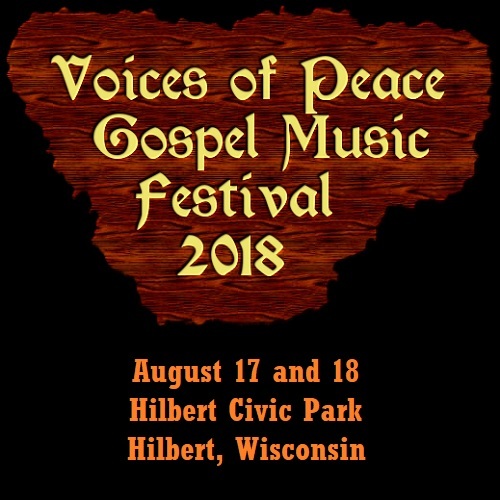 On Friday and Saturday, August 17 and 18, 2018, the "Voices of Peace" hosted their 14th Annual Gospel Fest at the Hilbert Civic Park located on Highway 57/32 in Hilbert, Wisconsin. 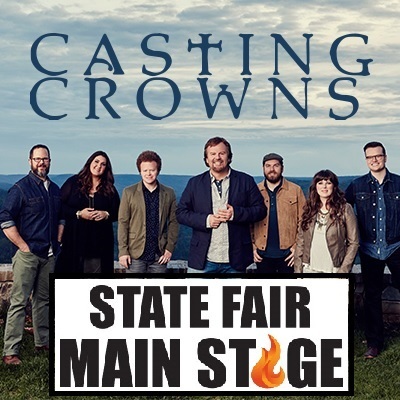 Returning to State Fair after their inspiring 2015 show, Christian rock band Casting Crowns took the Main Stage with special guest Matthew West. 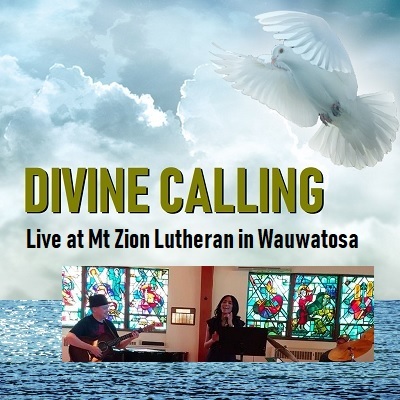 Divine Calling was excited to return to Mt Zion Lutheran Church in Wauwatosa. The first time they were there, the congregation was so welcoming that they can't help being absolutely thrilled about praising Jesus with them again! The Contemporary Worship service starts at 10 am on Sunday, August 5. JOSIAH'S PLACE Coffeehouse in Beloit, Wisconsin once again hosted a whole weekend full of family activities, music, food, testimonies and more with their annual Rock on the Rock celebration. Everyone is welcome and admission is FREE! 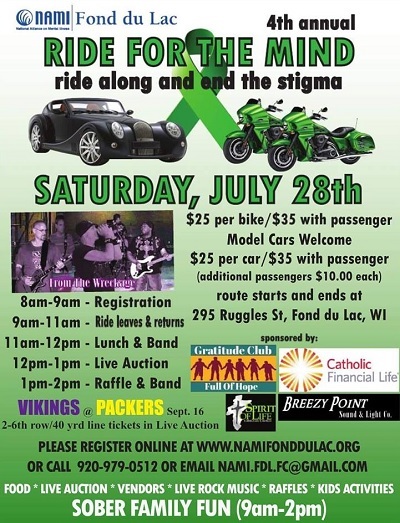 From the Wreckage played at the 2018 Ride for the Mind in Fond du Lac, Wisconsin. 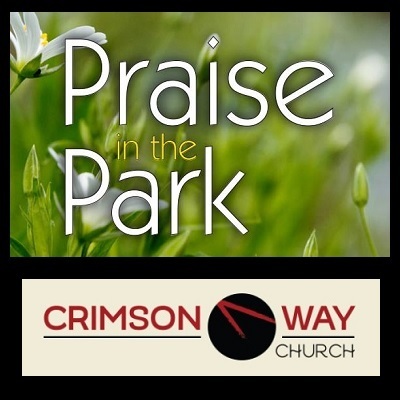 Crimson Way's 2nd annual outdoor service at the Elm Grove Park Pavilion. 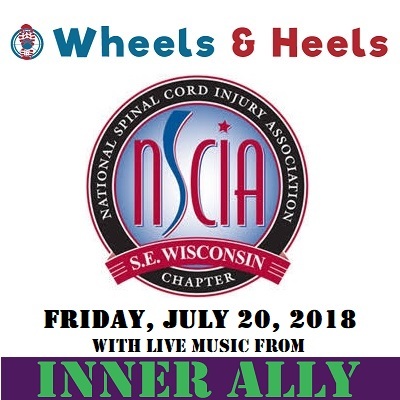 Inner Ally provided inspirational music during the 2018 Wheels & Heels 5k Run or Roll / 1k Fun Walk to help individuals with spinal cord injuries and disabilities to thrive and to support paralysis research. 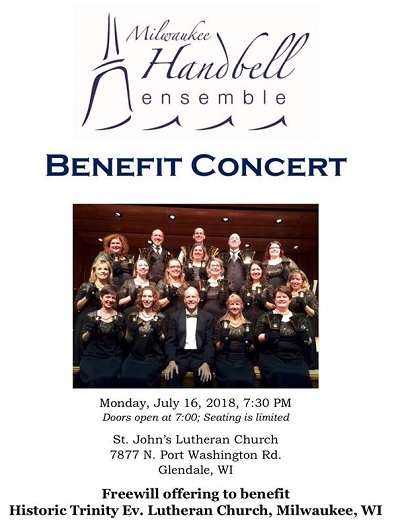 On Monday, July 16, 7:30 pm at St. John's Lutheran in Glendale, the Milwaukee Handbell Ensemble held a Benefit Concert to help congregation of Trinity rebuild from their devastating fire on May 15. 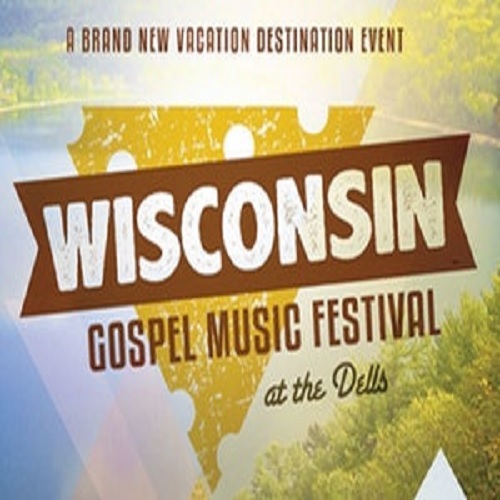 One of the nation's largest Christian music festivals takes place every summer in Oshkosh, Wisconsin. 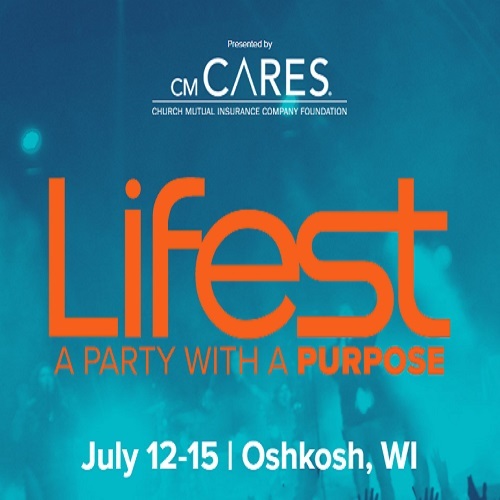 Get all of the info at lifest.com! 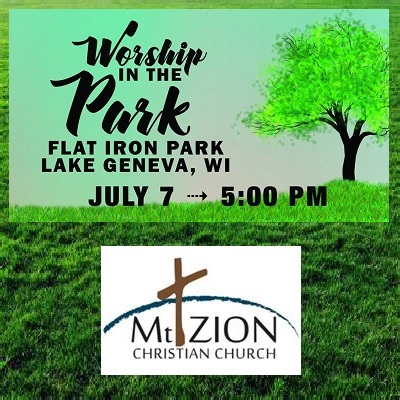 Mt Zion Christian Church in Lake Geneva, Wisconsin enjoyed the summer weather and had a great time singing to the Lord at Flatiron park on Saturday, July 7th. 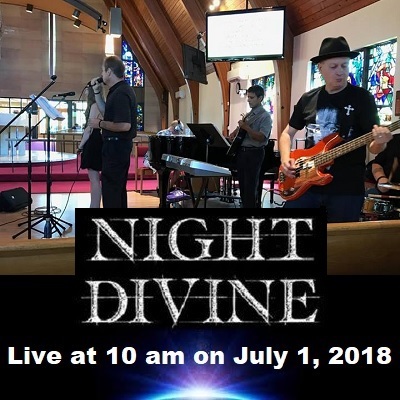 Night Divine played at the 10 am Contemporary Worship service on July 1 at Mt Zion Lutheran in Wauwatosa. Divine Calling set the stage for a message from Pastor Shane at Crimson Way Church & Hope MKE West Allis, Wisconsin. 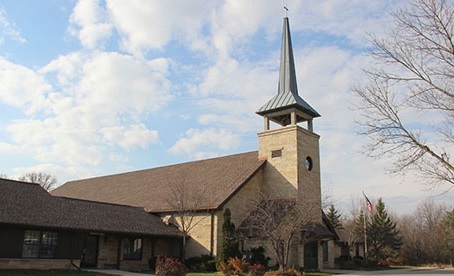 Divine Calling was honored to worship at the 10 am Contemporary Worship service on June 24 with the very kind and welcoming congregation of Mt Zion Lutheran in Wauwatosa. Divine Calling set the stage for a message from Pastor Shane on Father's Day at Crimson Way Church & Hope MKE West Allis, Wisconsin. 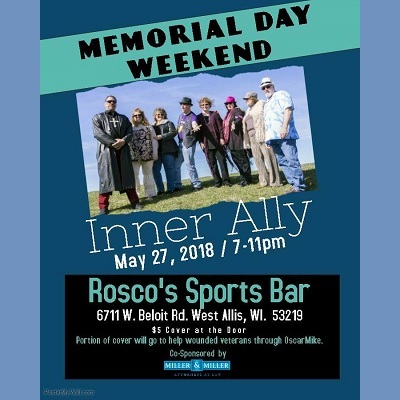 Inner Ally brought their brand of eclectic rock and roll to Rosco's in West Allis, Wisconsin on Memorial Day weekend. 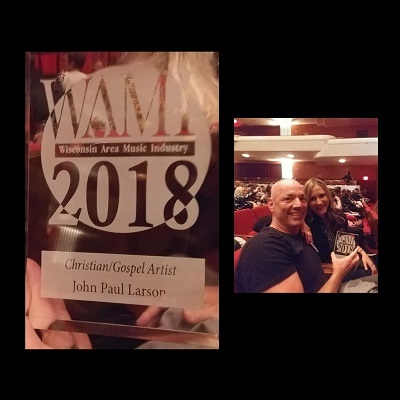 Congratulations to 2018 Wisconsin Area Music Industry (WAMI) 2018 Christian/Gospel Artist of the Year John Paul Larson! Other nominees included Koiné, Night Divine, MPS Community Gospel Choir, Katie DeNure, Isaiah 42:10 and WithoutExcuse. Read more about the nominees. Divine Calling set the stage for an amazing message at Crimson Way Church & Hope MKE West Allis, Wisconsin. Divine Calling gave thanks to God for Mothers everywhere at Crimson Way Church & Hope MKE West Allis, Wisconsin. 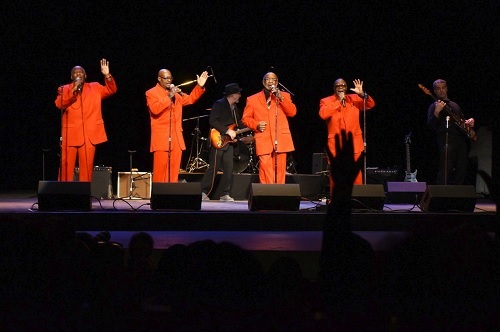 The Crystal Grand Music Theater in Wisconsin Dells showcased a two-day festival full of music from Legacy Five, Booth Brothers, Cana's Voice, Ball Brothers, The Erwins, Comedian Dennis Swanburg, The Hoppers and Greater Vision. 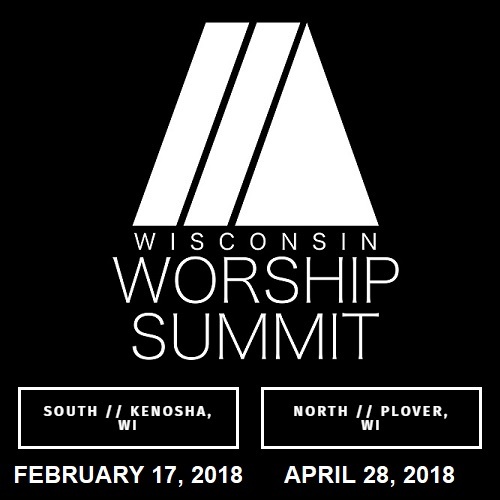 The Wisconsin Worship Summit was a one day event to equip, train, resource, grow and network those who lead worship ministries and those who serve in them. 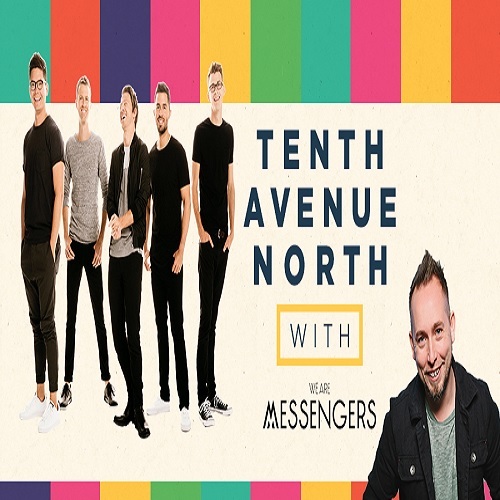 Leave it to Tenth Avenue North to challenge conventional perception by reminding us that we are the cathedrals and wherever we are is holy ground when they visited the Crystal Grand Music Theater in Wisconsin Dells in April 2018 with special guest We Are Messengers. 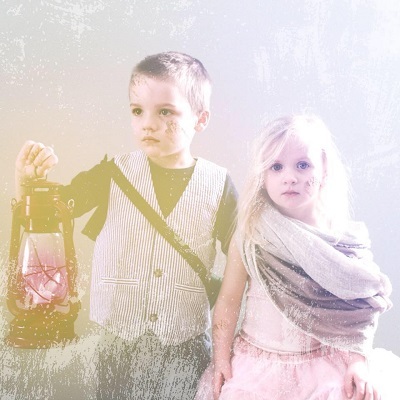 Dear Brother Dear Sister, the new album from OnceWasLost, was released on April 13th! 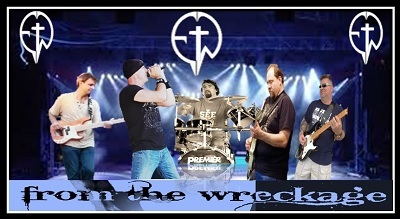 They hosted an album release show at Oak Creek Assembly of God on April 27th at 7:00pm. 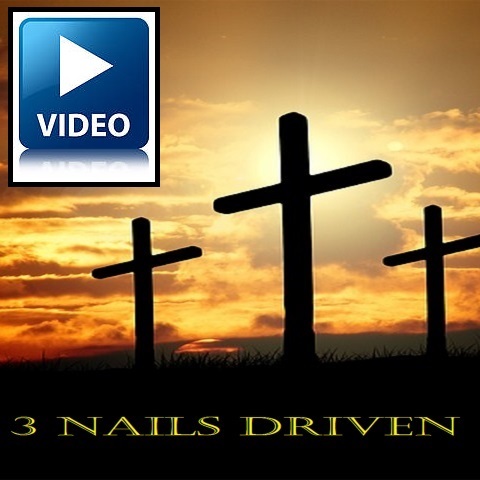 Hear the new single from DBDS, The Name Of Jesus. 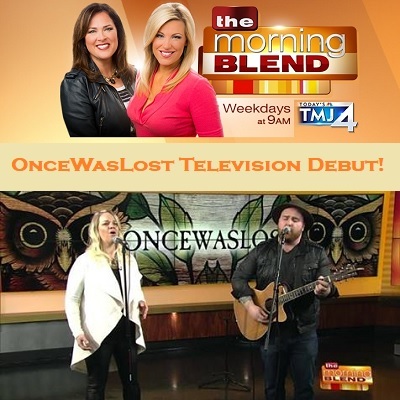 Molly Fay and Tiffany Ogle from Milwaukee's WTMJ-TV Channel 4 were excited to welcome Tom Tobolski and Arika Kohls from OnceWasLost to The Morning Blend for a couple of beautiful performances. 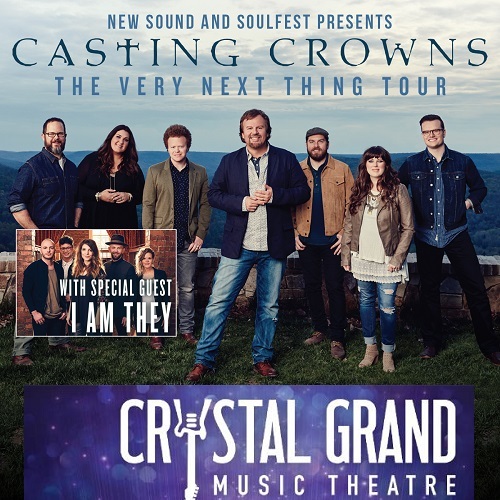 Having served as a full-time youth pastor for over 25 years, Casting Crowns' front man, Mark Hall, continues to draw inspiration from the well of real life. He brought this inspiration to the Crystal Grand Music Theater in Wisconsin Dells with special guest I Am They. The 27 year old self taught Milwaukee native known as C.M.P. beat the odds by the grace of God. Coming from a split family where C.M.P. 's father was a drug dealer and his mother is an evangelist, he lived in two worlds at once. 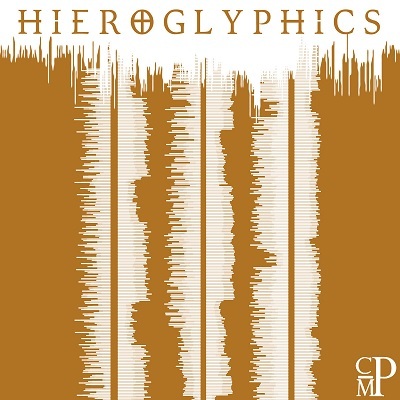 His latest release is called Hieroglyphics. 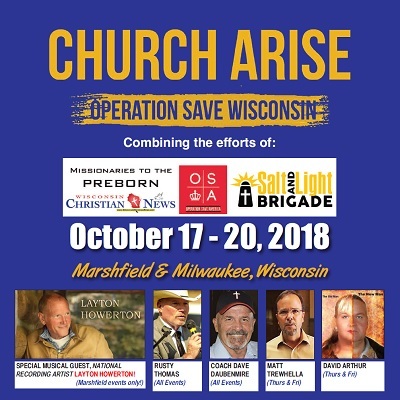 The Wisconsin Christian News Ministry Expo and Conference 2018 "Courageous Christianity!" 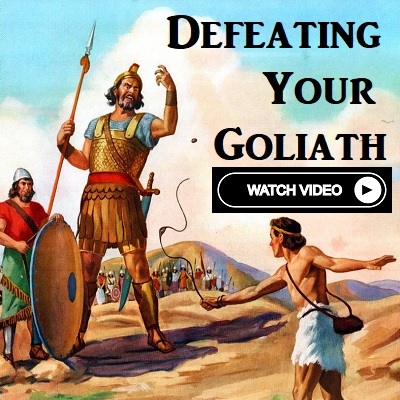 in Marshfield, Wisconsin featured William Federer, Flip Benham, Pastor Bill Dunfee, Coach Dave Daubenmire, The Matt Trewhella FAMILY and Rusty Thomas. With music from David Yonker. MKE Worship is as passionate as ever about creating an environment where people from all walks of this journey can unite under the grace and kindness found in Christ. They've pressed into what it means to sing truth over our own hearts and the hearts of others, and they were excited to do that at their March 9th event at Brew City Church in Milwaukee. 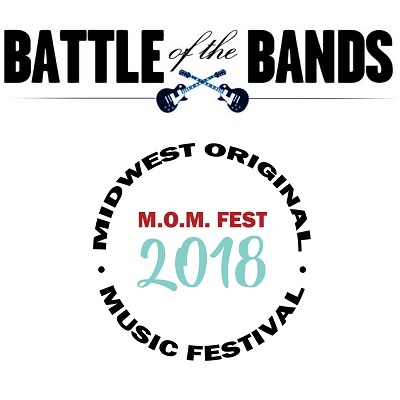 M.O.M Fest hosted a warm-up for the original music festival in August with a battle of the bands at Lucky Chance in West Allis on both March 3 and March 10. 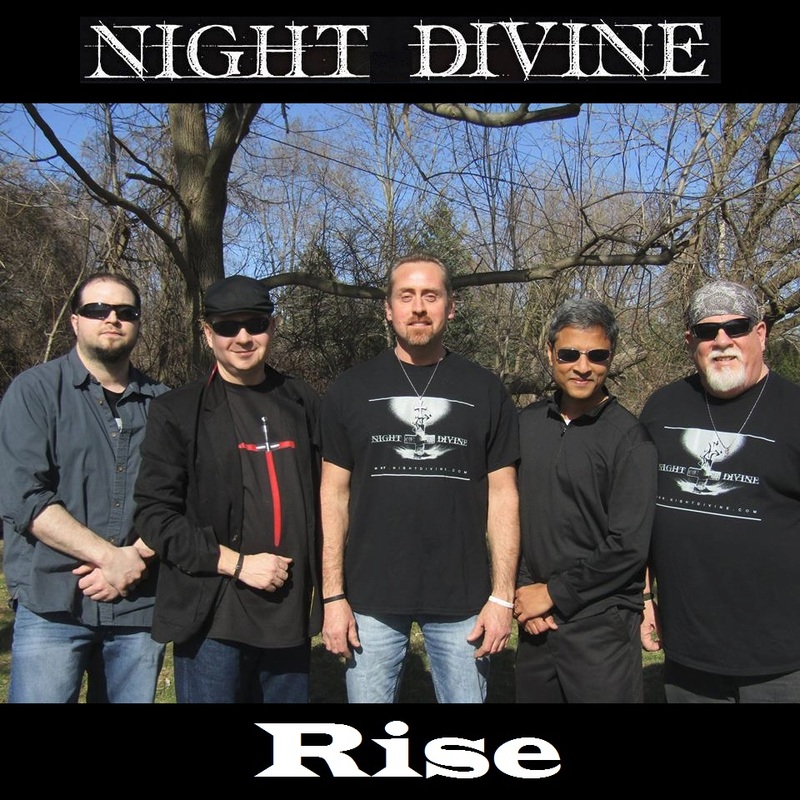 Christian rockers Night Divine were deployed for combat at the March 3 event. 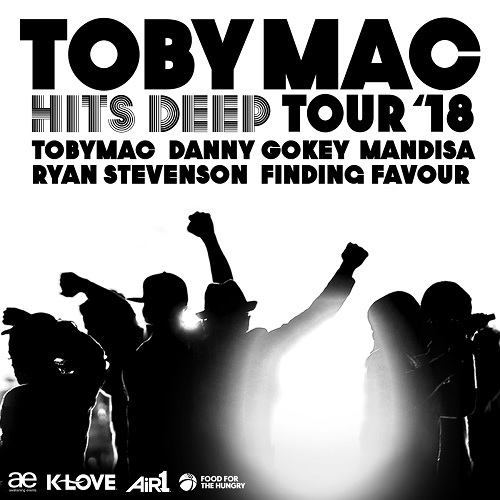 Toby Mac's Hits Deep Tour hit the UWM Panther Arena in Milwaukee, with special guests Mandisa, Danny Gokey, Ryan Stevenson and Finding Favour. 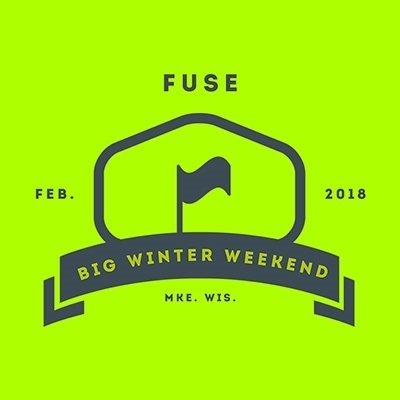 Big Winter Weekend (BWW) is a two-day event hosted by FUSE, the middle and high school ministry of the Epikos Church West Allis location every winter. 2018 BWW was full of great speakers, serving with friends, awesome community, and an amazing concert featuring Trip Lee and Milwaukee's own Cory Cifax. Get all of the info at epikosfuse.com! 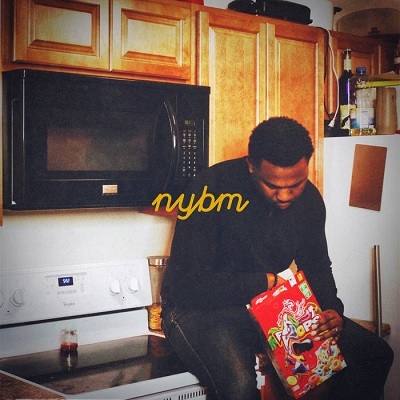 Milwaukee's Cory Cifax began 2018 with a new song (produced by RedEye) named NYBM. 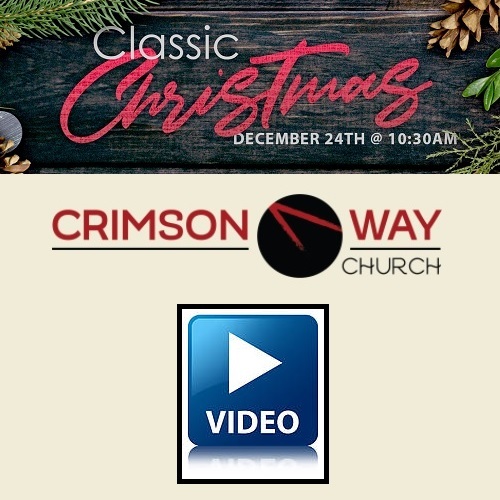 As part of the 2017 Classic Christmas celebration at Crimson Way in Elm Grove, Wisconsin, Troy Stetina brought his finest gift for Jesus. Crimson Way in Elm Grove, Wisconsin presented a Classic Christmas arranged and performed by Troy Stetina and the Crimson Way worship team. 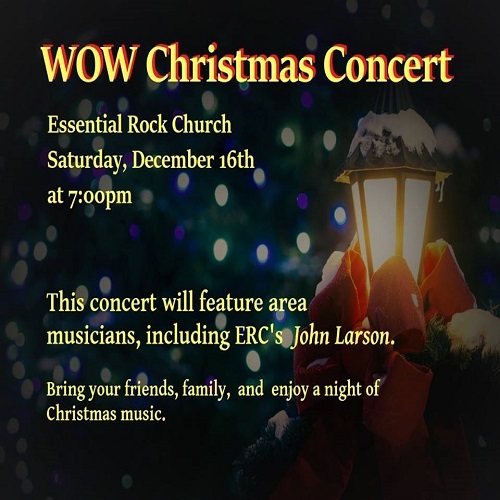 Essential Rock Church in Fond du Lac, had a live Christian concert that featured area musicians, including their very own John Larson. 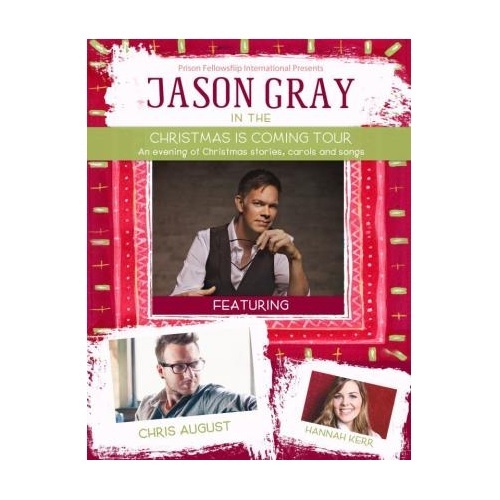 K-LOVE welcomed Jason Gray with Chris August and Hannah Kerr on Friday Night, December 15th at RiverGlen Christian Church in Waukesha for the Christmas is Coming Tour. 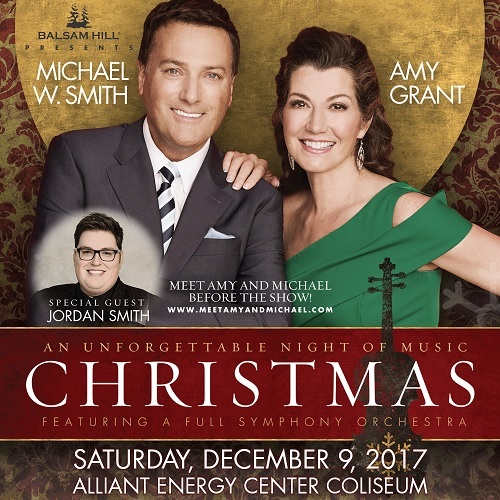 Christmas music from Michael W. Smith and Amy Grant was accompanied by the Madison Symphony Orchestra. 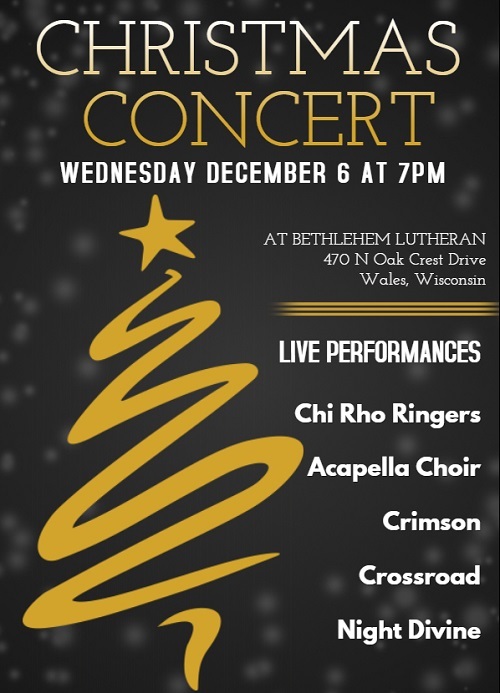 Bethlehem Lutheran in Wales, Wisconsin hosted a special Christmas Concert featuring five groups: The Chi Rho Ringers, Acapella Choir, Crimson, Crossroad and Night Divine. 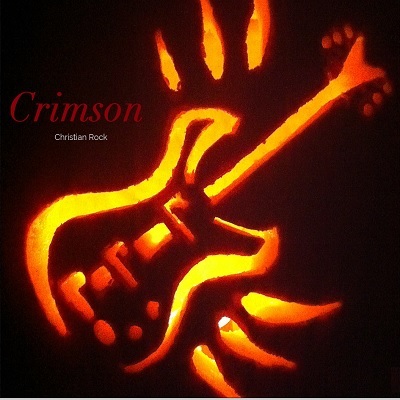 Christian rockers Crimson out of Wales, Wisconsin made their debut performance at the 2017 Bethlehem Christmas Concert. 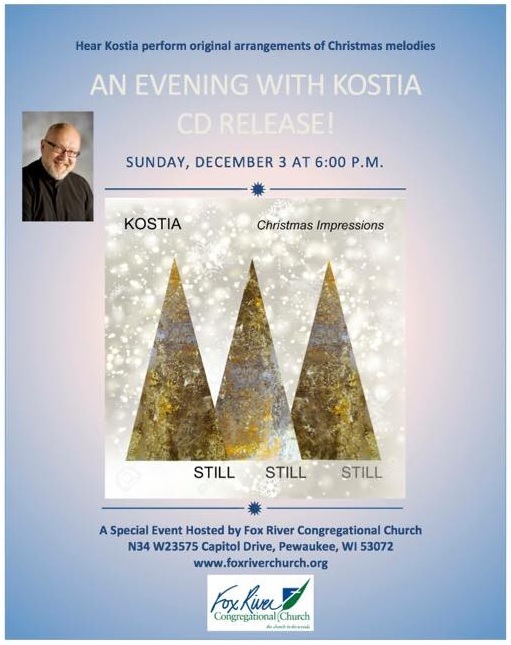 Kostia is celebrating the Christmas season with the release of his new Still Still Still CD at Pewaukee's Fox River Congregational Church. 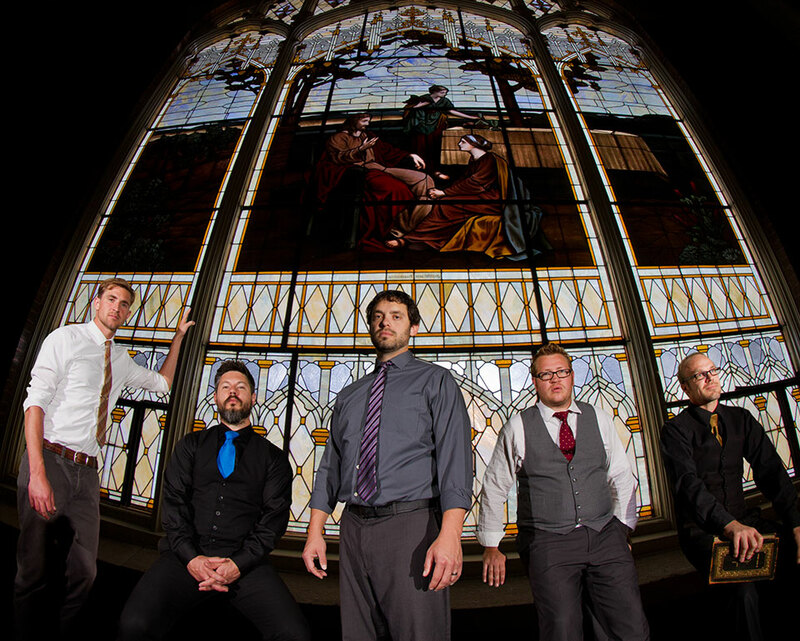 Wausau, Wisconsin's Living River Christian Quartet offers joy with a blended combination of spiritual songs, feel-good music and traditional Christmas music. 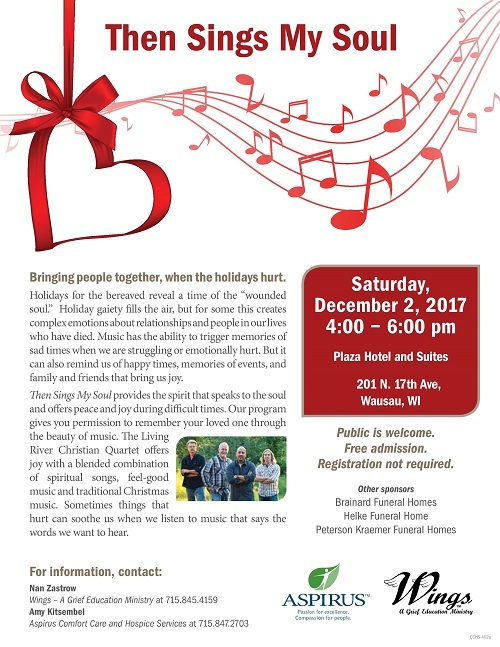 Hosted by Wings, A Grief Education Ministry Holidays for the bereaved, their family and friends reveal a time of the "wounded soul." 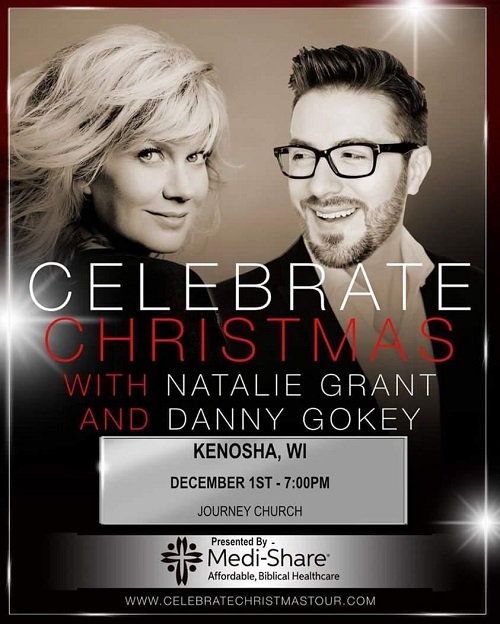 Natalie Grant and Danny Gokey celebrated the birth of Jesus with the 2017 Celebrate Christmas Tour! They were in Kenosha on December 1 and Green Bay on December 2. You can see more tour info at CelebrateChristmasTour.com. 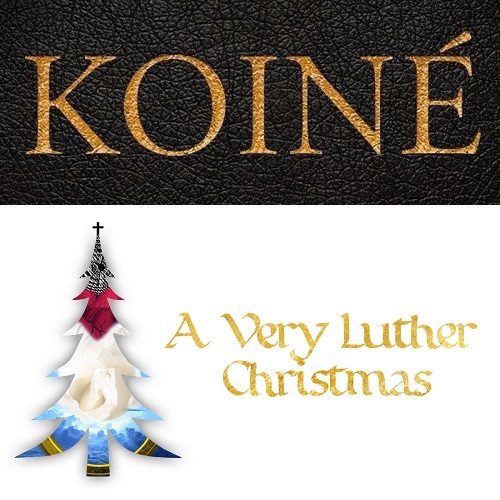 In honor of the 500th anniversary of the Reformation, Koiné celebrated the Christmas music of Martin Luther. Featuring all new acoustic arrangements of some of your favorite Christmas hymns! 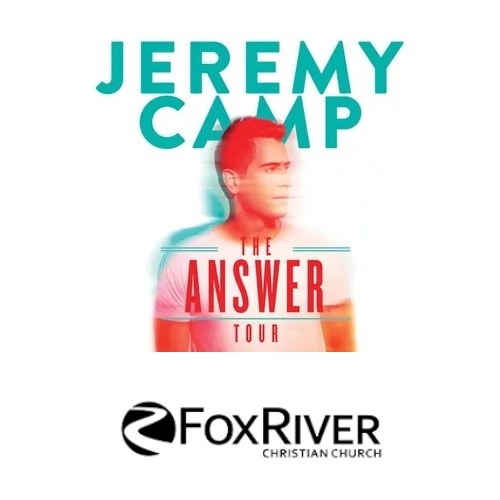 National recording artists Jeremy Camp and special guest Royce Lovett visited Fox River Christian Church in Waukesha as part of The Answer Tour. 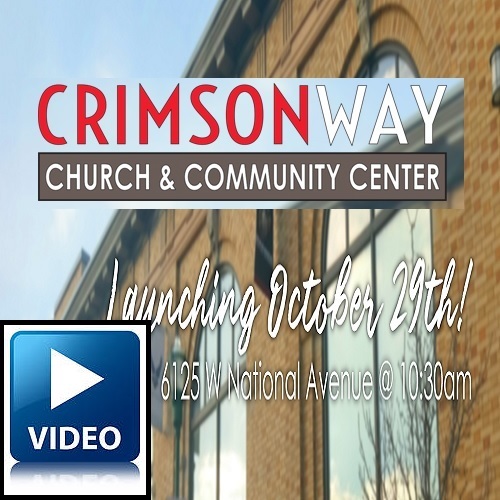 The new Crimson Way Church and Community Center is now open in West Allis near the busy corner of National, Greenfield and 60th. This amazing new place features things like free lessons from professional musicians and all kinds of other events designed to reach real people in the community. See the facebook video of the grand opening if you missed it. 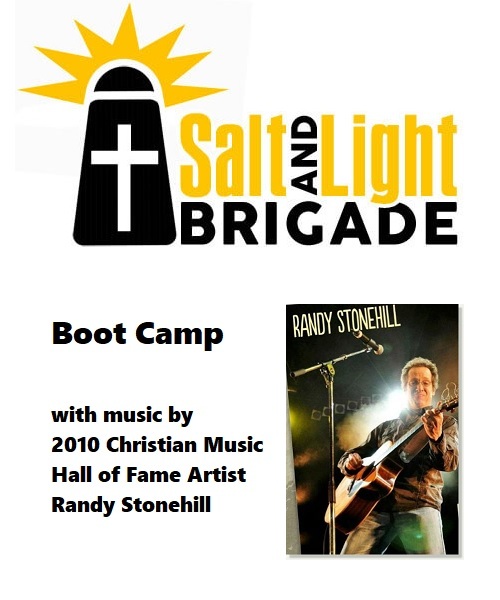 Randy Stonehill has collaborated with many of the most important voices in the Christian music scene including Phil Keaggy, Keith Green, Larry Norman, Amy Grant and many more. In November 2010 he was inducted into the Christian Music Hall of Fame. 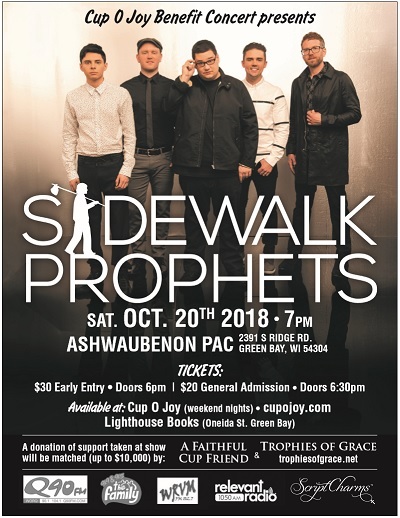 In October 2017, he joined Coach Dave and Greg Evensen for a Salt and Light Brigade kickoff event in Marshfield, Wisconsin to prepare God's troops for a spirit filled boot camp experience in Milwaukee. K-LOVE welcomed Tenth Avenue North with Brandon Heath and Jon McLaughlin to Wisconsin Lutheran College in Milwaukee during their I Have This Hope Tour. 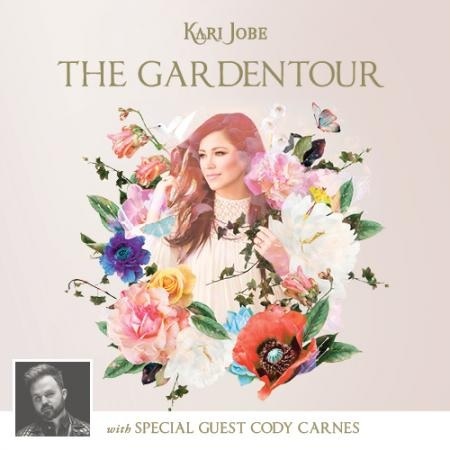 National recording artist Kari Jobe praised Jesus at The Riverside Theater in Milwaukee during her Garden Tour. 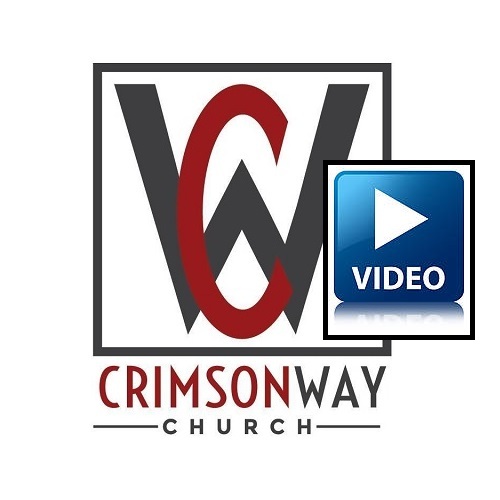 The praise team at Crimson Way Church shared a live broadcast with us on Sunday morning. 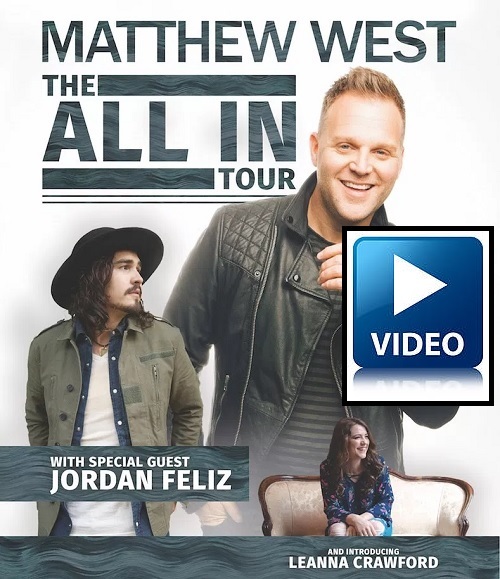 National recording artist and four-time GRAMMY award nominee Matthew West visited River Glen Christian Church in Waukesha during his All In Tour. 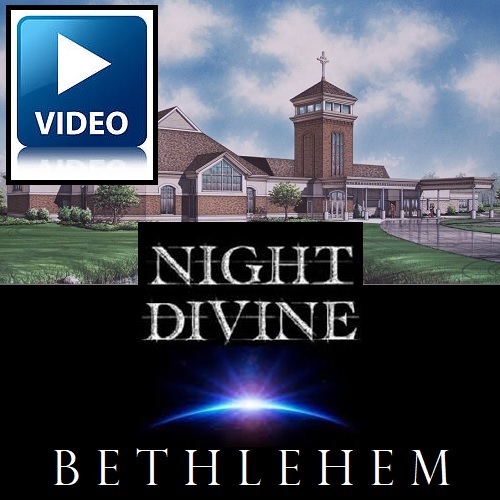 Night Divine Bethlehem shared the original song Rise with their family at Bethlehem Lutheran Church in Wales. 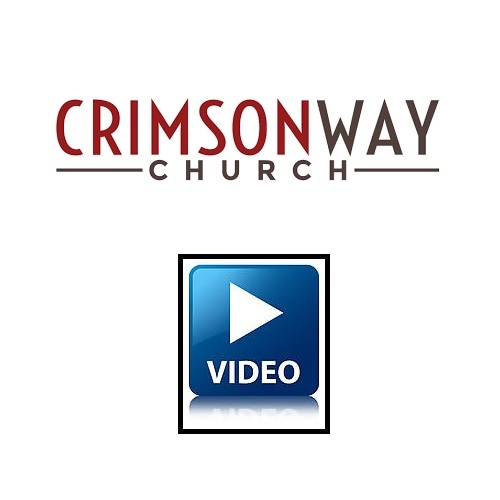 The praise team at Crimson Way Church shared a live broadcast with us on Sunday morning. They were also worshipping God there on Saturday Night. 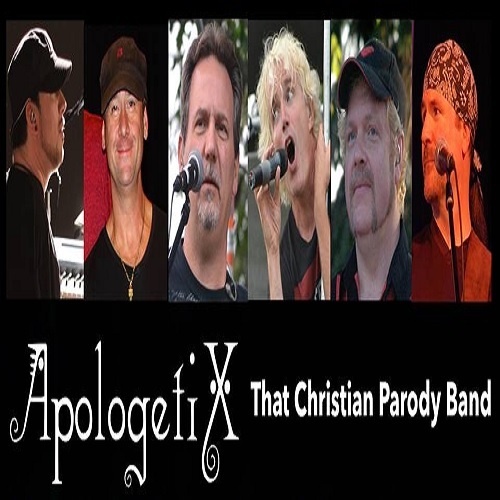 The Cup O Joy in Green Bay, Wisconsin featured Apologetix (THAT Christian PARODY BAND) a 4 piece band that specializes in Biblical parodies of pop, rock and alternative songs. 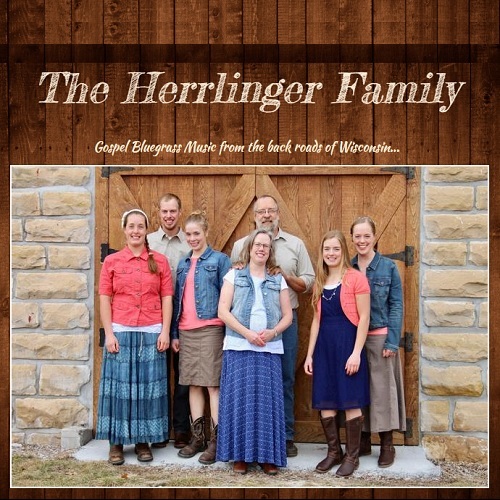 Hailing from the winding backroads of Boyceville, Wisconsin, this homeschooled family of nine with kids ranging in ages from 9-24 praise God with mandolin, a hammered dulcimer, an accordion and a resonator guitar. 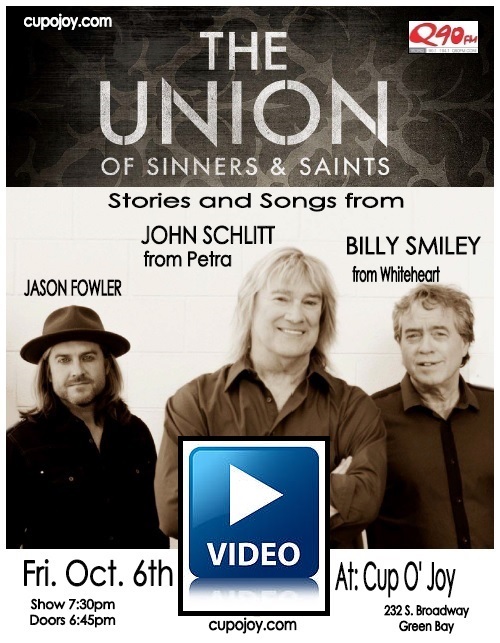 A Singer/Songwriters night at the Cup O Joy in Green Bay, Wisconsin with John Schlitt from Petra, Billy Smiley from Whiteheart, and new artist Jason Fowler presenting Petra, Whiteheart and Union songs while telling stories of the road! 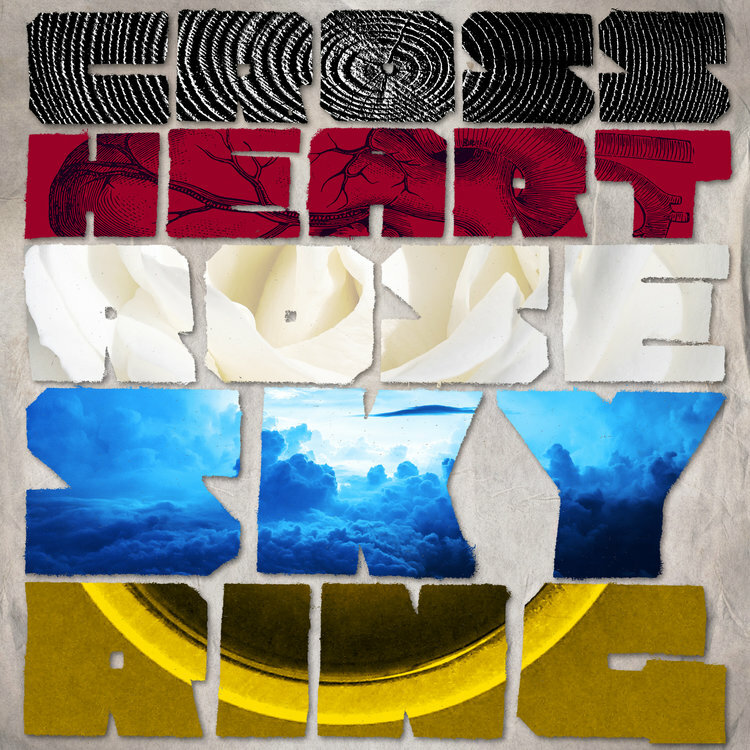 Cross Heart Rose Sky Ring - Koiné's 8th Studio Album was released September 30th with a special concert at Waukesha County Expo Center that celebrated the music and art of Martin Luther. Ability Fest in Lomira, Wisconsin is a day to celebrate the "Abilities" of all people. 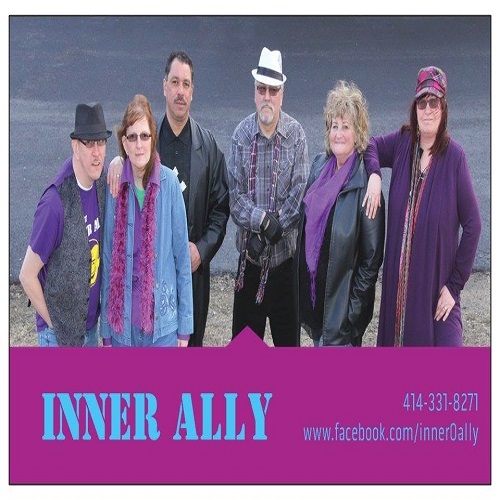 Milwaukee's Inner Ally provided the music. 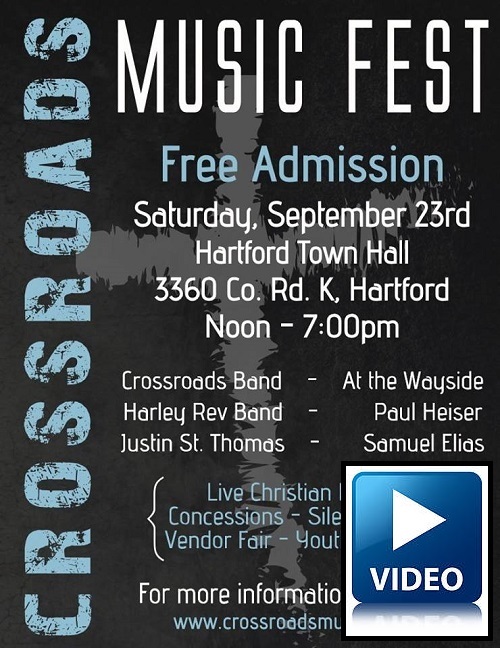 Hartford Town Hall was filled with live Christian music, great food, a silent auction and an awesome kid zone! 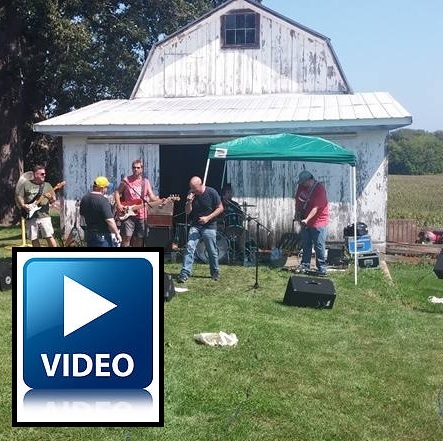 The all day schedule included performances by the St. Luke Crossroads Band, Paul Heiser, At the Wayside, Justin St. Thomas, Eric Bath, Samuel Elias and the Harley Rev Band. 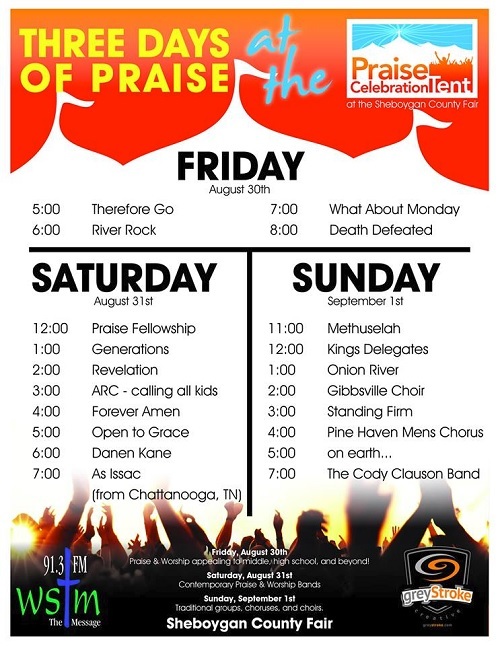 More info at crossroadsmusicfest.net. 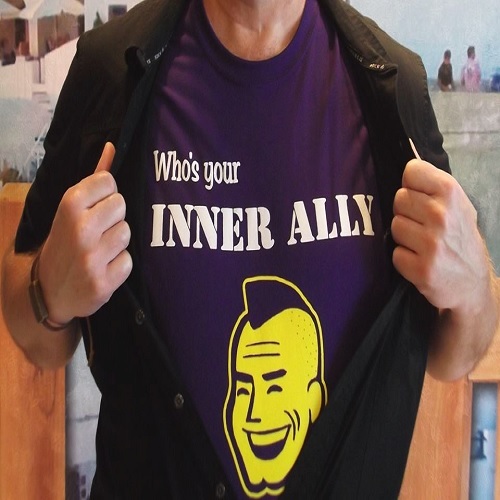 Milwaukee's Inner Ally climbed back into the upper room in Sheboygan, Wisconsin to visit Mary and all their friends! 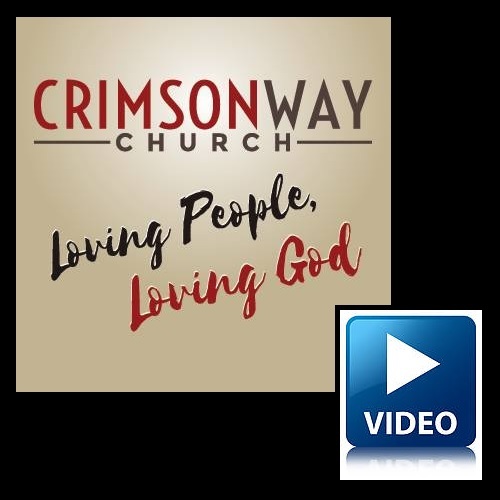 The praise team at Crimson Way Church shared a live broadcast with us on Sunday morning. They were also praising the Creator there on Saturday Night. Ava joined Night Divine on violin as they led worship at Bethlehem in Wales. 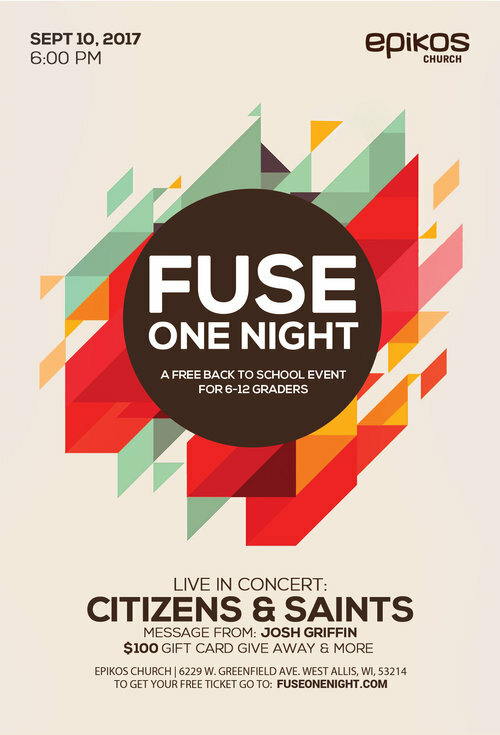 FUSE One Night is the back to school kickoff event for FUSE Student Ministry. This special night included a concert by Citizens & Saints and an engaging message from Veteran Youth Pastor Josh Griffin. 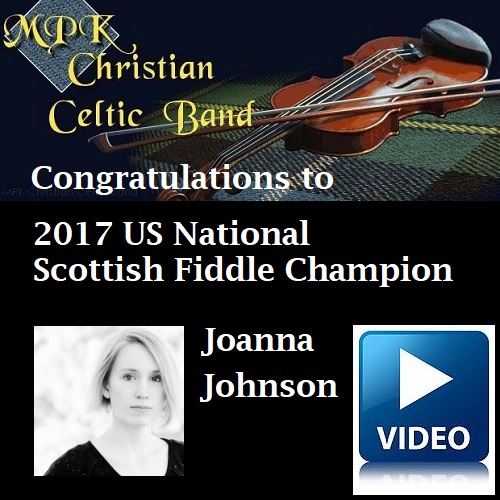 Congratulations to the 2017 US National Scottish Fiddle Champion Joanna Johnson! 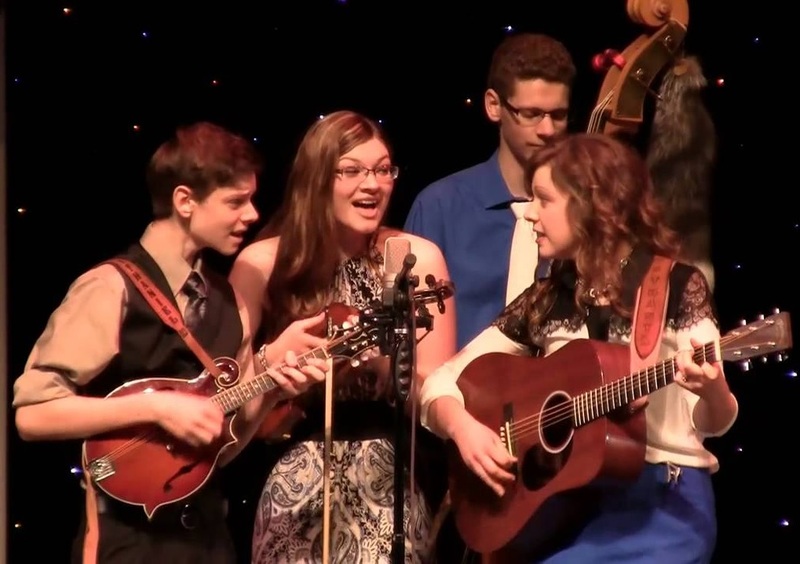 She plays with Wisconsin's MPK Christian Celtic Band and won first place at the Scottish F.I.R.E. sanctioned National Scottish Fiddle Competition Open Division at Edinboro University. Deb Johnson from MPK was also honored and won first place in the Edinboro Regional Scottish Fiddle Competition. From the Wreckage brought the light of God to the 3rd Annual Fowler Farm Pig Roast. Danen Kane played a free full band concert at Denmark Memorial Park in Denmark, Wisconsin. 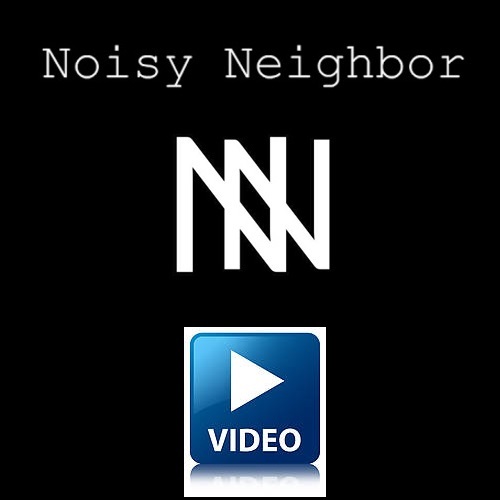 Noisy Neighbor had their first event! They were able to showcase Arnold Cifax Jr. for the first show on his upcoming tour and hang out in Coffeeworks around music and art lovers. 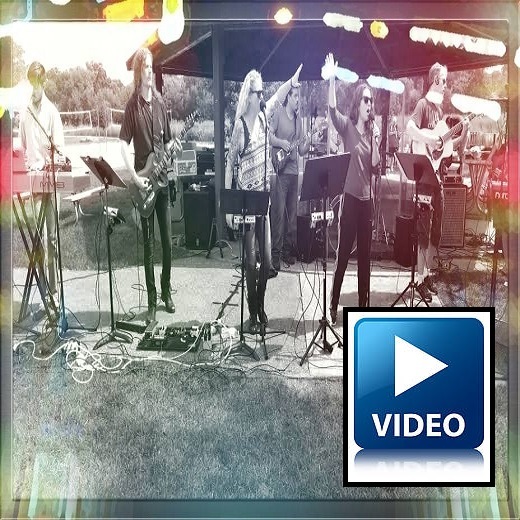 The extremely talented praise and worship team at Crimson Way Church brought their music to Elm Grove Village Park to Connect with People and Encounter God’s Presence. Two Christian artists made history by playing the inaugural 2017 Midwest Original Music Festival. We have video to prove that Rick Stephenson was one them. 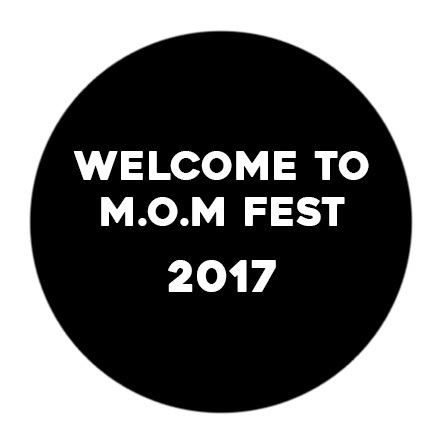 M.O.M Fest is here to give another bump to the original music community in the live performance sector by providing an all original performing arts showcase to the general public. See who's playing this year at momfestmilwaukee.com. 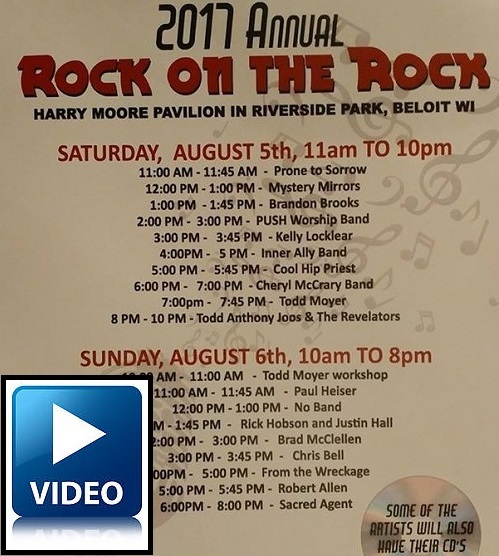 The 2017 Rock on the Rock Music Festival, thanks to the support of the Overflowing Cup in Beloit, Wisconsin, features two days of Christian music including Prone to Sorrow, Mystery Mirrors, Brendan Brooks, PUSH Worship Band, Kelly Locklear, Inner Ally Band, Cool Hip Priest, Cheryl McCrary Band, Todd Anthony Joos and the Revelators, Todd Moyer, Paul Heiser, Drew Guikema, Rick Hobson and Jhustin Hall, Brad McClellen, Chris Bell, From the Wreckage, Robert Allen and Sacred Agent. 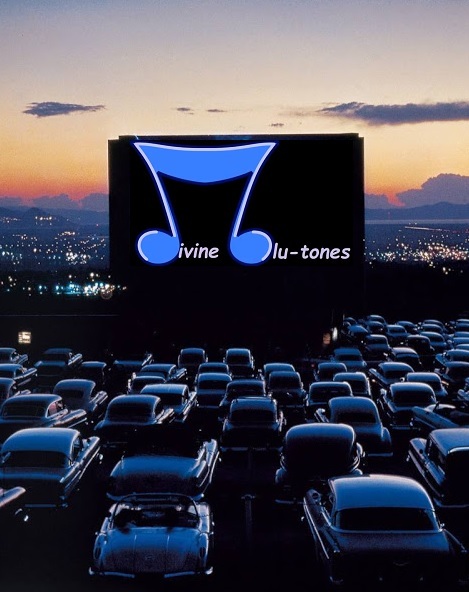 The Divine blu-tones out of Milwaukee, Wisconsin have created a new youtube channel to showcase their original music. Milwaukee's Inner Ally provided musical encouragement for everyone who participated in the 2017 Wheels and Heels 5k Run. 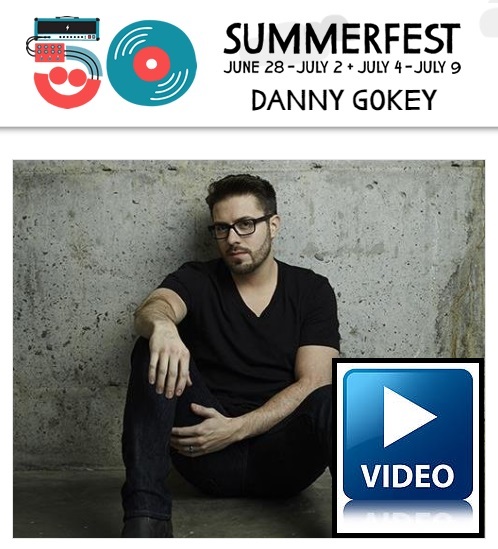 Milwaukee's Danny Gokey visited his hometown during Summerfest 2017 as part of his nationwide tour. Brendan Brooks of Wonewoc, Wisconsin did a show in Greeley, Colorado. 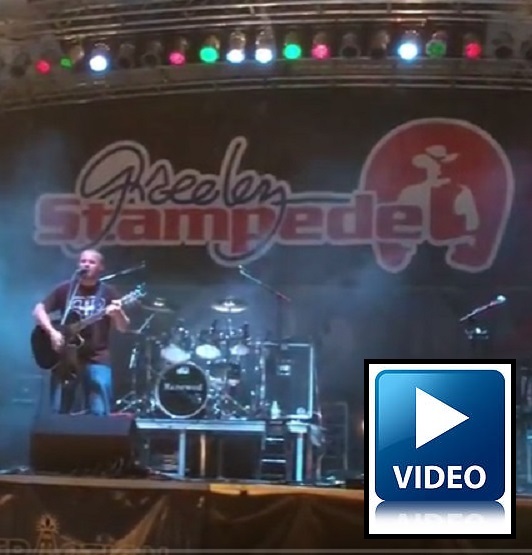 That's quite a road trip, so we're glad he came home with some video from the show at the Greeley Stampede of his song Just To Be Where You Are for those of us who couldn't make it. 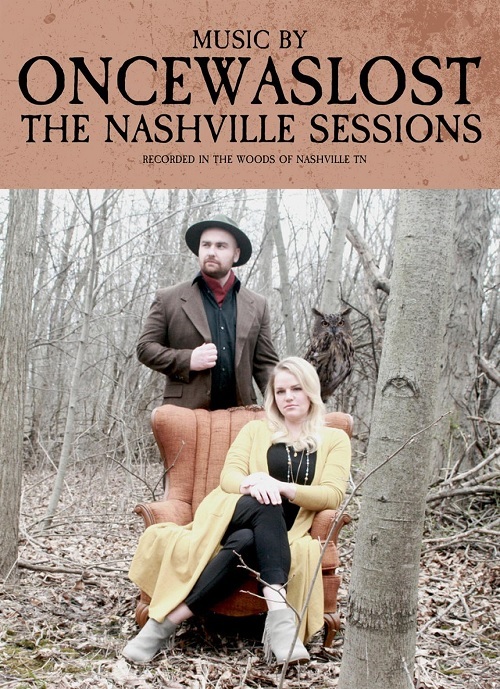 OnceWasLost from Milwaukee released their Nashville Sessions album in 2017. E.P. 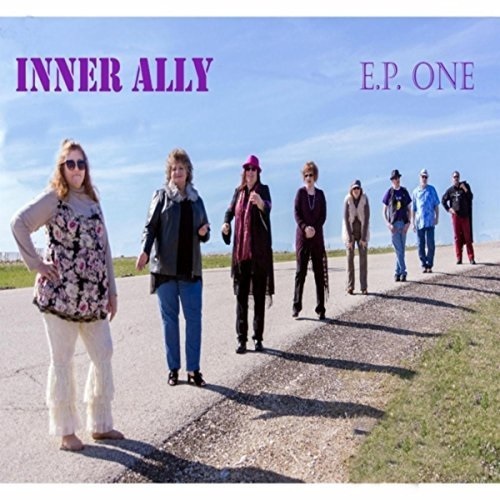 One is the first release from Milwaukee's Inner Ally. 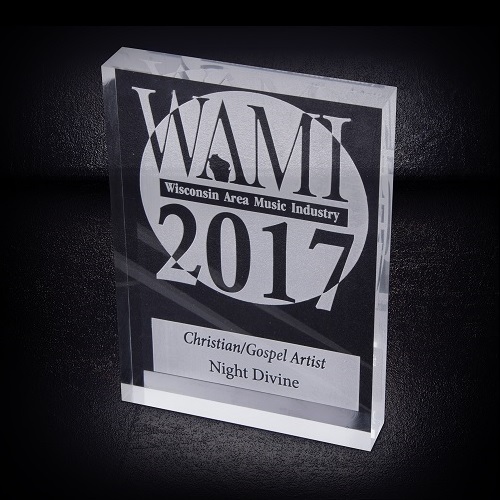 Congratulations to the 2017 Wisconsin Area Music Industry (WAMI) Awards Christian/Gospel Artist Winner Night Divine! Other nominees included Koiné, Masonic Wonders, Cory Cifax, Tae Spears and Paul F. Trebian. 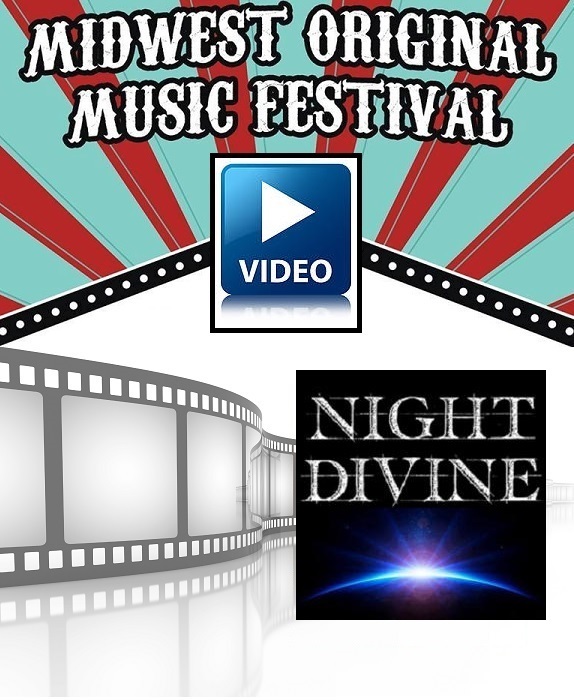 At the 2017 Awards Ceremony held at Turner Hall in Milwaukee, WAMI interviewed Kevin and Prakash from Night Divine. On April 1, Night Divine took an adventure into Troy Stetina's Artist Underground Studio in New Berlin, Wisconsin to record their first studio single named Rise. 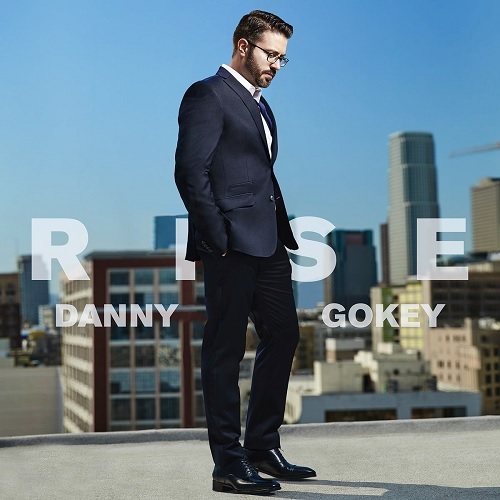 The fifth studio album from Danny Gokey, an American Idol contestant and Jesus lovin' Milwaukee native, is entitled Rise. 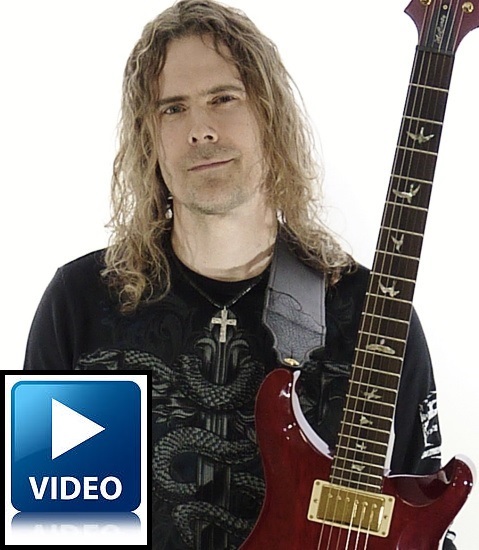 During the 2016 Christmas Day service at Crimson Way church in Elm Grove, Wisconsin, guitar virtuoso Troy Stetina reflected on the birth of Jesus Christ in the way we all hoped he would, with a mind blowing Christmas Medley guitar solo. 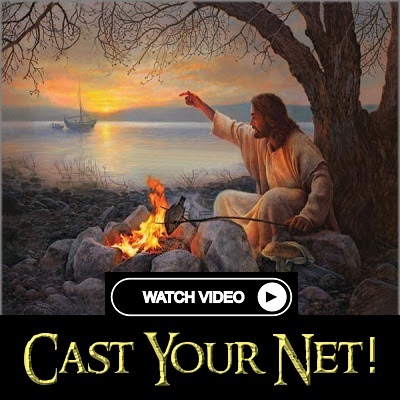 3 Nails Driven out of Milwaukee, Wisconsin shared video of Lead Me to the Cross as seen the Overflowing Cup in Beloit. 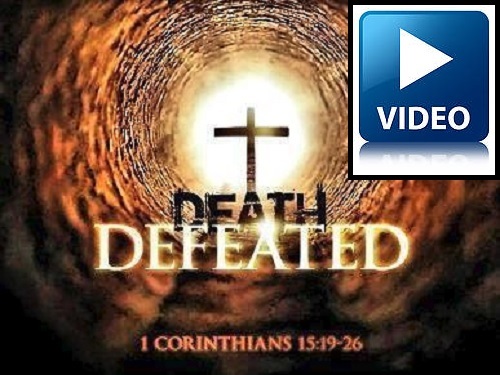 They also gave us video from the songs Flood, Hallelujah, Spirit of God, At the Cross and Set Me Free. 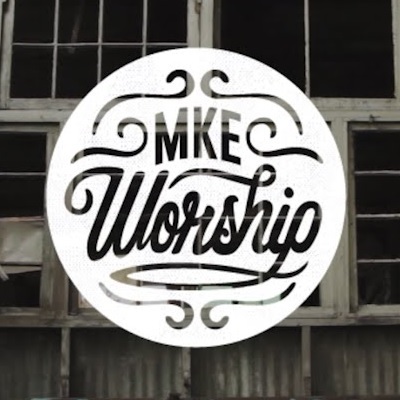 MKE Worship shared some of their original songs during a special Worship Record Release Show at epikos church. 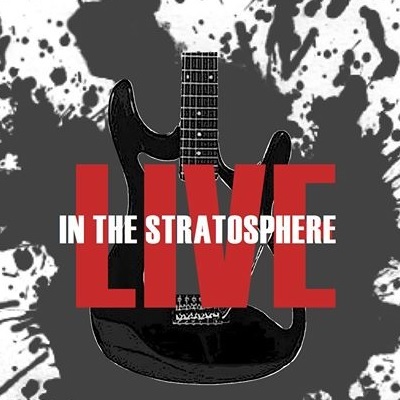 Along with Never Stop, they also recorded live videos for Have Your Way and Sovereign Strong. 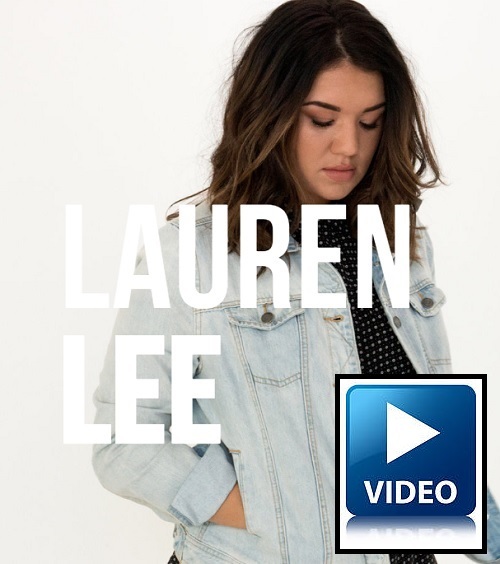 The See EP is a complete reflection of Lauren Lee's heart not only for God, but also for the church; an album navigating through the real questions, doubts, disappointments, and the hope we can find if we only look. 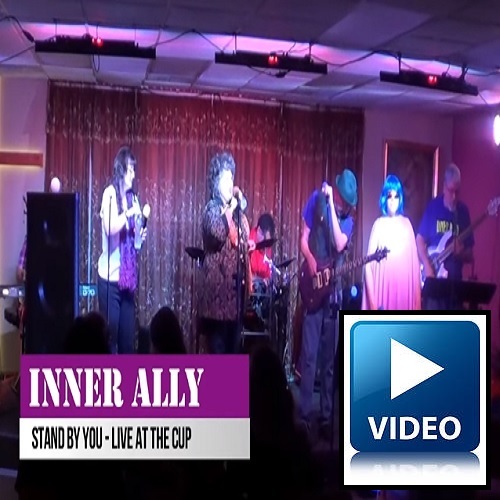 Milwaukee's Inner Ally gave us a live recording of their original song Stand By You at the Overflowing Cup in Beloit, Wisconsin. 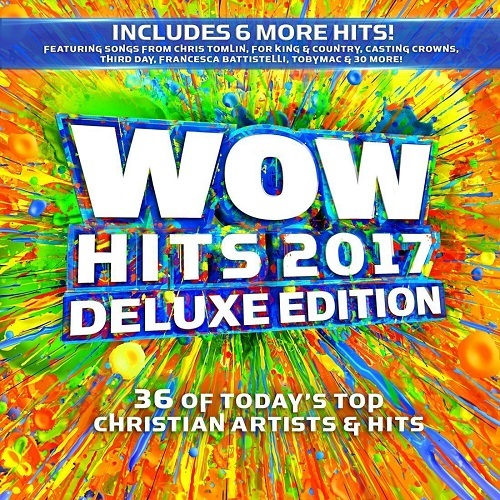 Milwaukee's Danny Gokey was featured on the compilation CD WOW Hits 2017 - 36 of Today's Top Christian Artists and Hits. 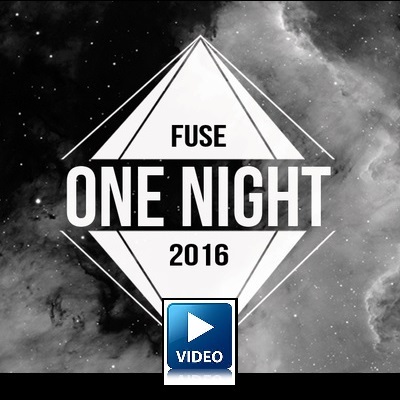 Milwaukee's Cory Cifax and Red Eye rocked the house for Jesus as they praised the Almighty at the 2016 Epikos FUSE One night in West Allis, Wisconsin. Gawvi and Derek Minor also gave God all the glory that night. OnceWasLost from Milwaukee released their Wanderer album in 2016. 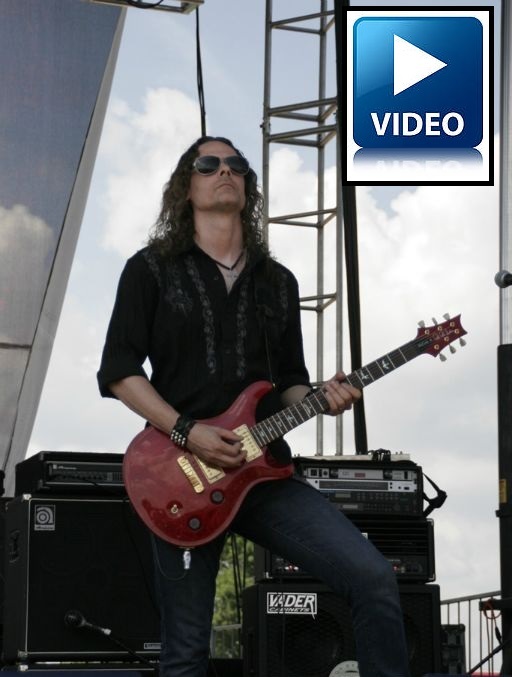 Armed with a custom Signature Series Dimas, a Boss RC300 Loopstation and a lifetime of experience mastering and then teaching advanced guitar techniques, Troy Stetina was ready to transform any tune in the world into a six string masterpiece during his Masterclass at the 2016 Wilson Center Guitar Competition and Festival in Brookfield, Wisconsin. 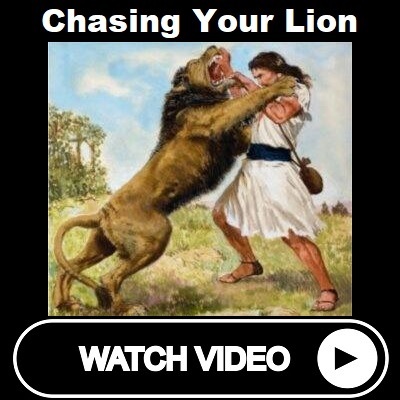 Troy chose the world's most recognizable melody about salvation: Amazing Grace. 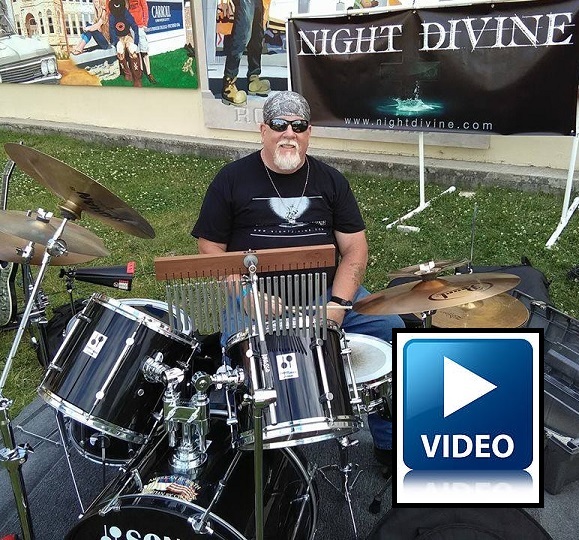 Rich Marks, drummer for Night Divine, told the story about how God delivered him from a life that landed him in jail. Thanks to the faithglasses youtube channel for posting the full video of Rich's testimony. 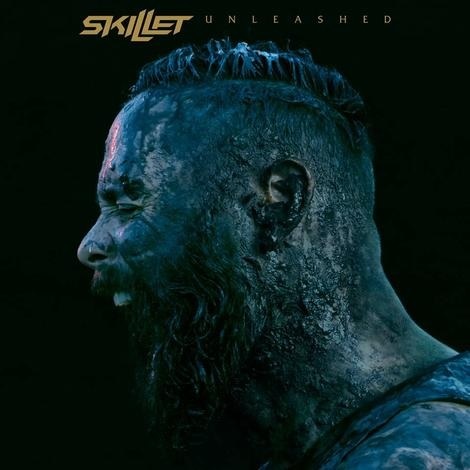 Kenosha, Wisconsin based national recording artist Skillet released their tenth album Unleashed in 2016. The trumpeters and musicians joined in unison to give praise and thanks to the LORD. Accompanied by trumpets, cymbals and other instruments, the singers raised their voices in praise to the LORD and sang: "He is good; his love endures forever." Then the temple of the LORD was filled with the cloud. 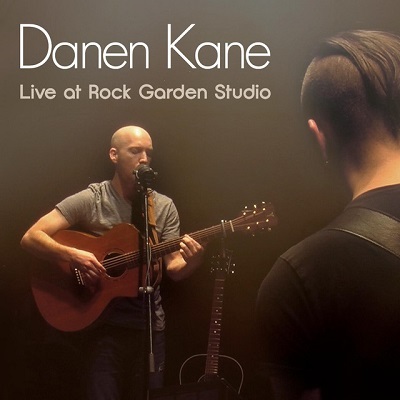 Danen Kane out of Appleton, Wisconsin released Live At Rock Garden Studio in 2016. 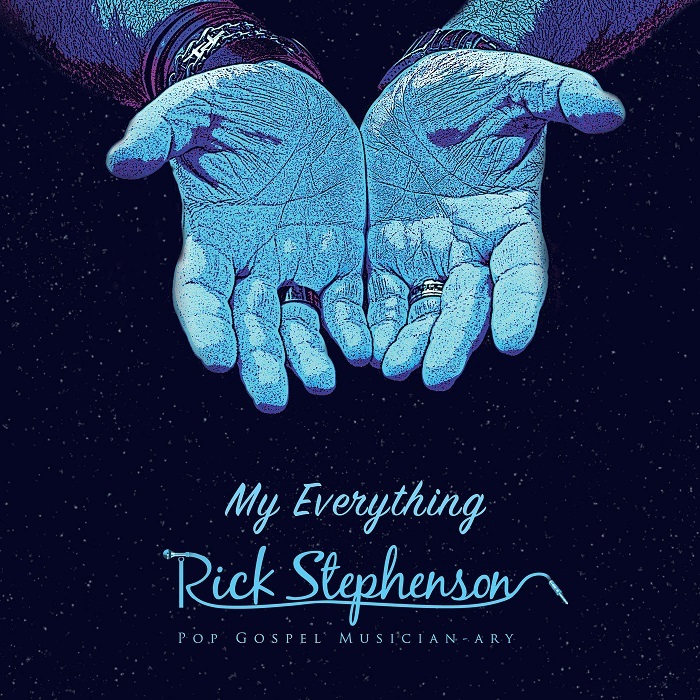 Christian singer-songwriter Rick Stephenson of Johnson Creek, Wisconsin is no stranger to the recording studio. My Everything represents his latest album in at least four full-length CDs in his career. See the full CD review in the Journal of Gospel Music. The fourth studio album from Danny Gokey, an American Idol contestant and Jesus lovin' Milwaukee native, is entitled La Esperanza Frente a Mi. 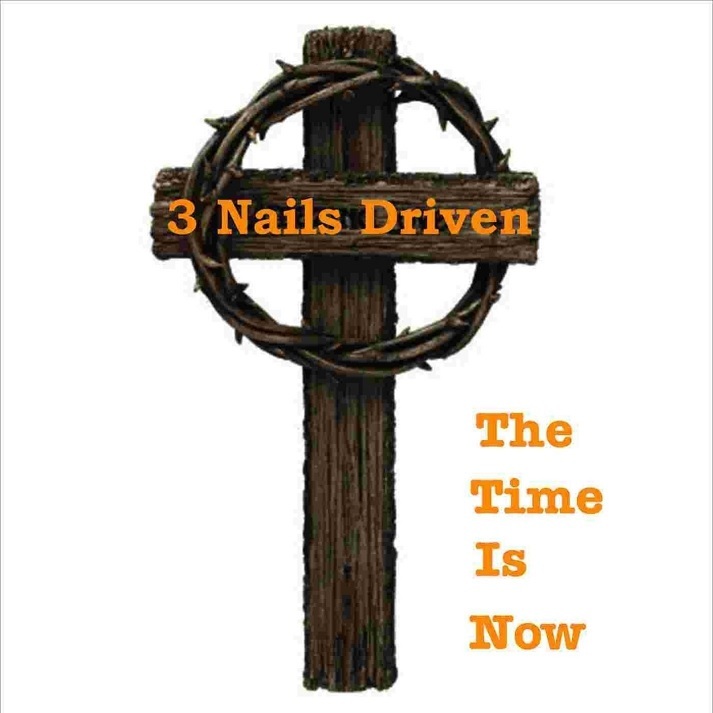 The debut CD from Milwaukee's 3 Nails Driven is entitled The Time is Now. Rumor has it that they're already working on a second one. When it comes out, we'll let you know! 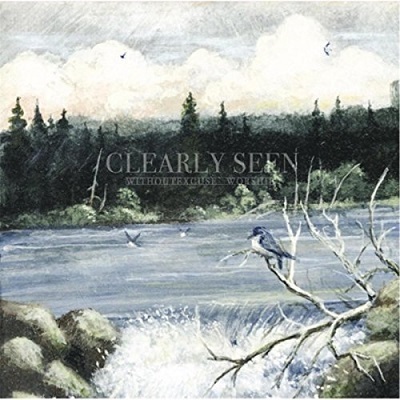 The fourth release from WithoutExcuse out of Wausau, Wisconsin was entitled Clearly Seen. 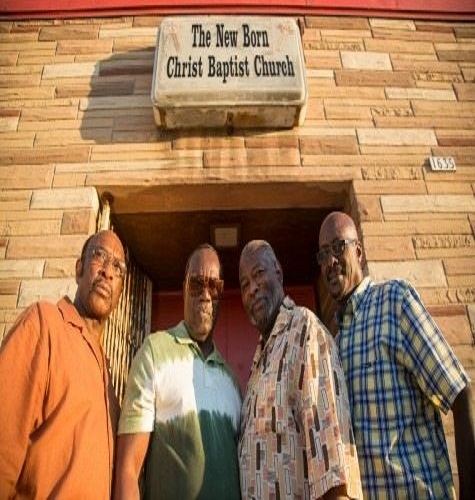 A group of anointed musicians known as The Called out of New Berlin, Wisconsin had an amazing time bringing faith, hope and love to the legendary stage of Milwaukee's Shank Hall. In accordance with the Psalm 33:3 directive, they played skillfully with a LOUD noise. 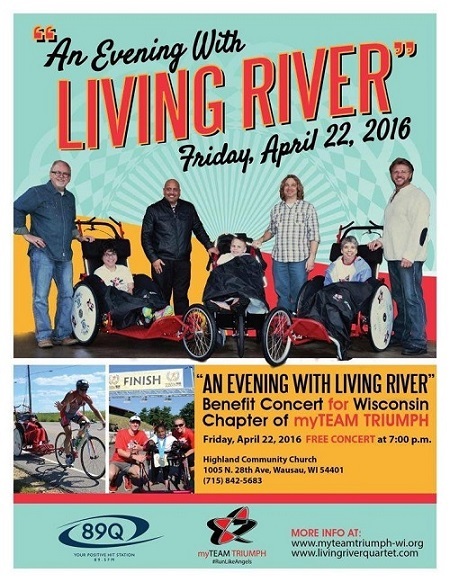 An evening with Living River was a benefit concert held in Wausau for the Wisconsin chapter of myTEAM TRIUMPH. Congratulations to the 2016 Wisconsin Area Music Industry (WAMI) Awards Christian/Gospel Artist Winner Koiné! At the time the award was given, they were actually on tour in Isreal, now that's pretty cool. Other nominees included Masonic Wonders, Night Divine and David Nunley. 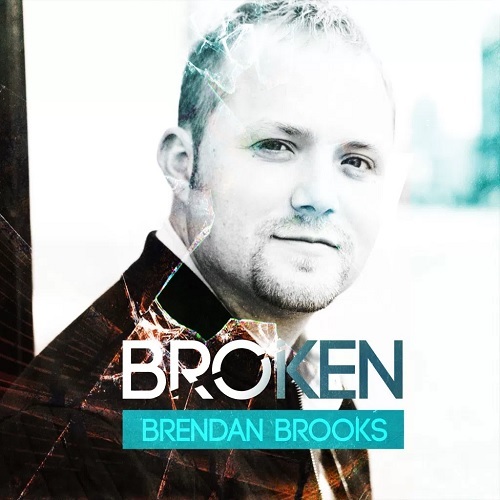 Brendan Brooks out of Wonewoc, Wisconsin released Broken in 2016. 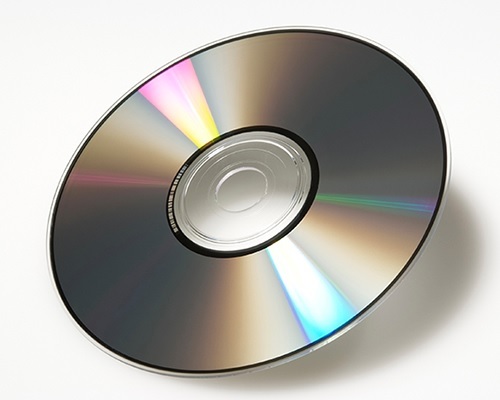 See what Solid Ground Reviews had to say about the CD. 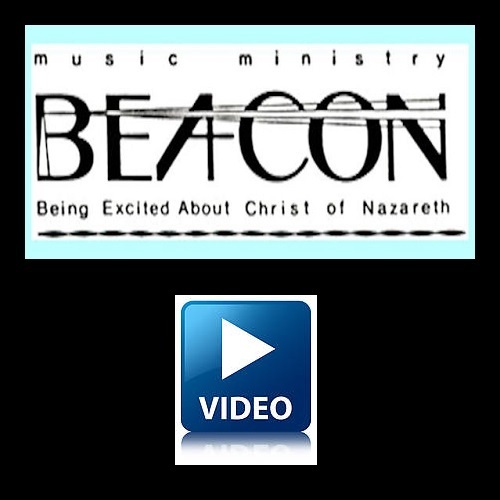 Milwaukee's Cory Cifax performed his song "Winners" (featuring Red Eye of The Bridge Collective) as part of FUSE ministry's 2016 Big Winter Weekend at Epikos Church in West Allis, Wisconsin. 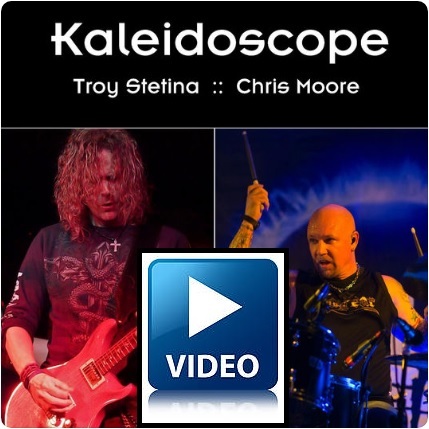 The devil's army of guitar players trembled in fear when they heard Troy Stetina, the Minister of Music at Crimson Way Church in Elm Grove, Wisconsin, completely shred along with Chris Moore on the track Kaleidescope. Obviously, none of them ever want to have to face him in a guitar duel. 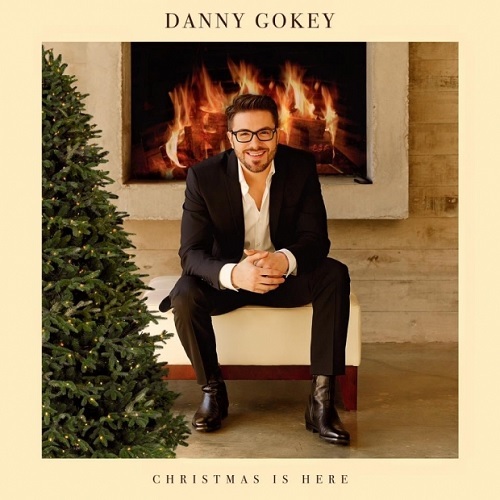 The third studio album from Danny Gokey, an American Idol contestant and Jesus lovin' Milwaukee native, is entitled Christmas Is Here. 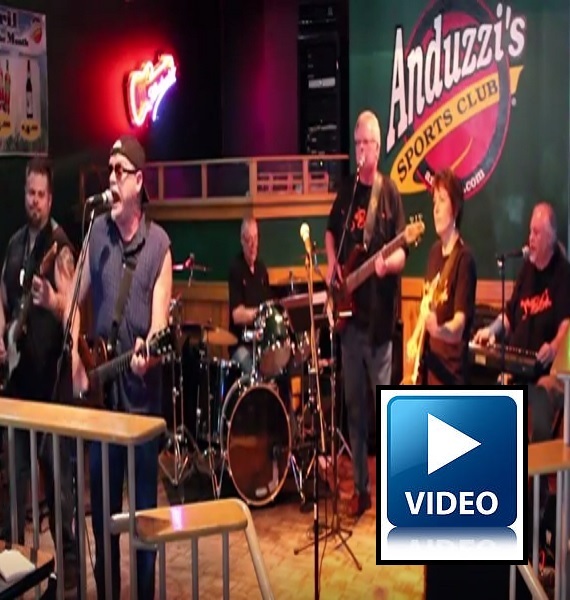 Christian rock band Night Divine of Wales, Wisconsin took part in a benefit for the Wounded Warriors at Kelly's Bleachers in Big Bend. One week earlier, they had written a new song called War Room (inspired by the movie of the same name) that they played for the first time at this benefit concert. 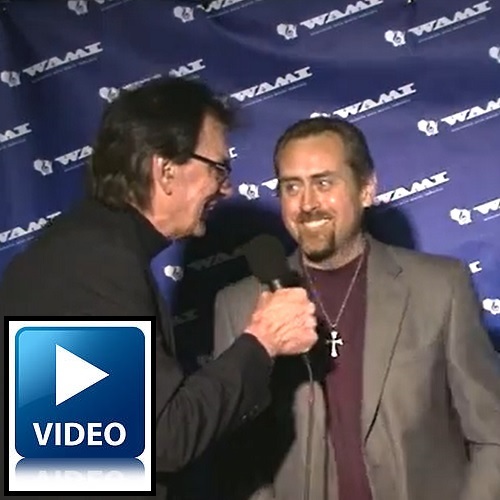 Congratulations to the 2015 Wisconsin Area Music Industry (WAMI) Awards Christian/Gospel Artist Winner Masonic Wonders! 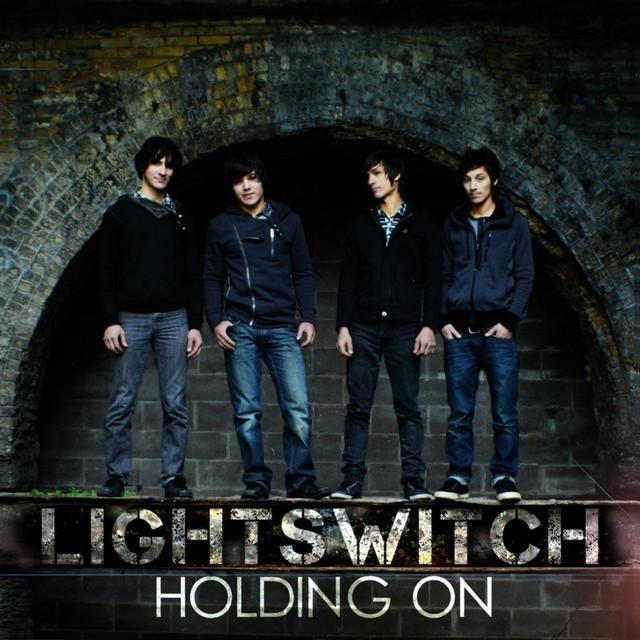 Other nominees included Koiné , Saved by Grace, Lightswitch, Dave Gerhartz and Paul F. Trebian. 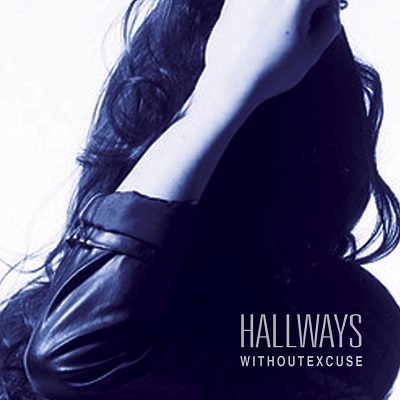 The third release from WithoutExcuse out of Wausau, Wisconsin was entitled Hallways. 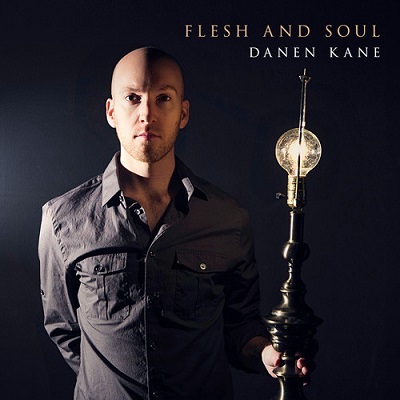 Danen Kane out of Appleton, Wisconsin released his fifth full length studio album in 2015 entitled Flesh and Soul. 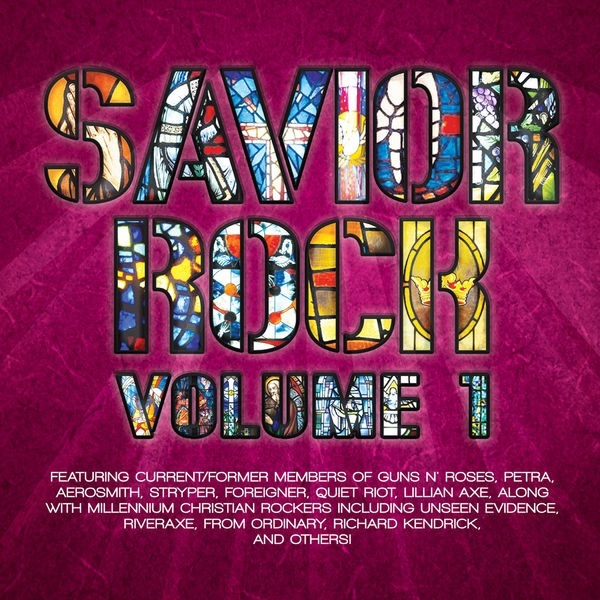 Fond du Lac, Wisconsin band From the Wreckage was included on the Savior Rock Volume 1 CD featuring current/former members of Guns n' Roses, Petra, Aerosmith, Stryper, Foreigner, Quiet Riot and Lillian Axe. They shared two outstanding songs on the CD: Forgiven and God's Army. 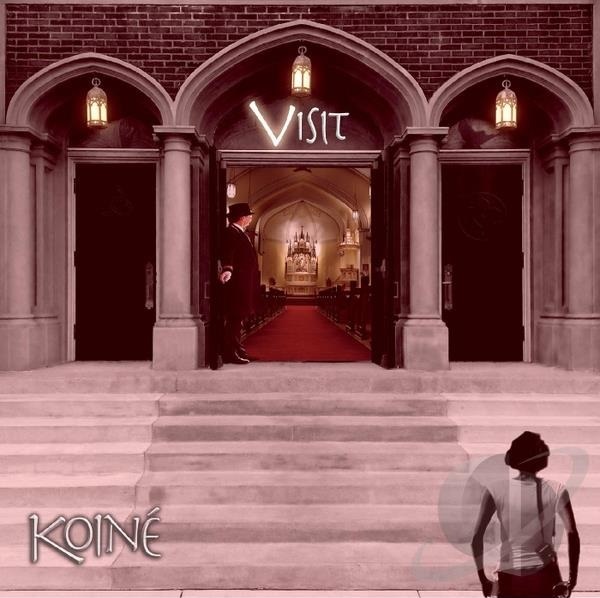 Milwaukee's Koiné released their Visit (Vol V) CD in 2014. 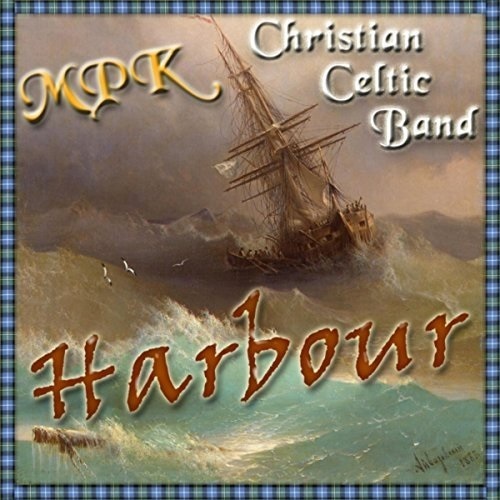 Wisconsin's MPK Christian Celtic Band released their Harbour CD in 2014. 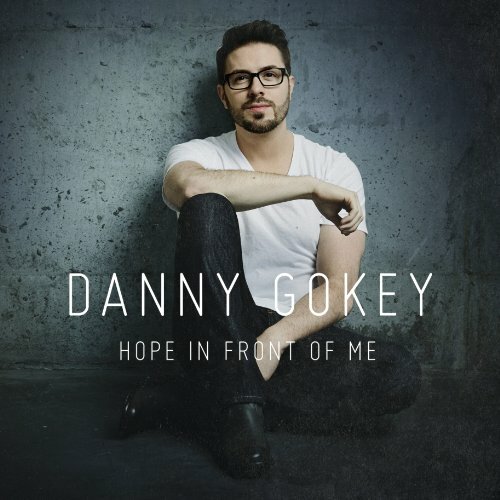 The second studio album from Danny Gokey, an American Idol contestant and Jesus lovin' Milwaukee native, is entitled Hope in Front of Me. Congratulations to the 2014 Wisconsin Area Music Industry (WAMI) Awards Christian/Gospel Artist Winner Lightswitch! Other nominees included Cory Cifax, Koiné, Masonic Wonders, Saved by Grace and Tae Spears. 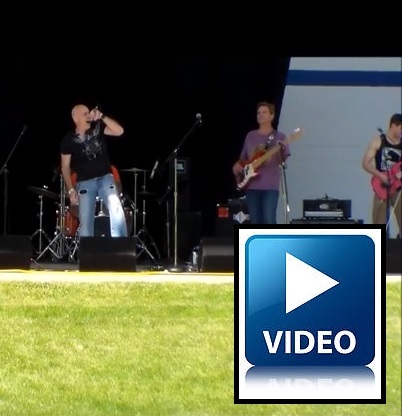 From the Wreckage was caught on video praising the name of Jesus at Buttermilk Park in Fond du Lac as part of the 2014 God of This City celebration. 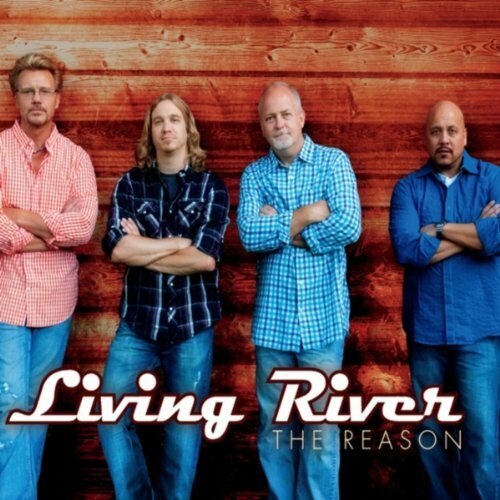 The second studio album from Wausau's Living River Gospel Quartet is entitled The Reason. A&D stands for Armed and Dangerous, but the weapons of their warfare are not carnal, they are the living Words of Jesus Christ. 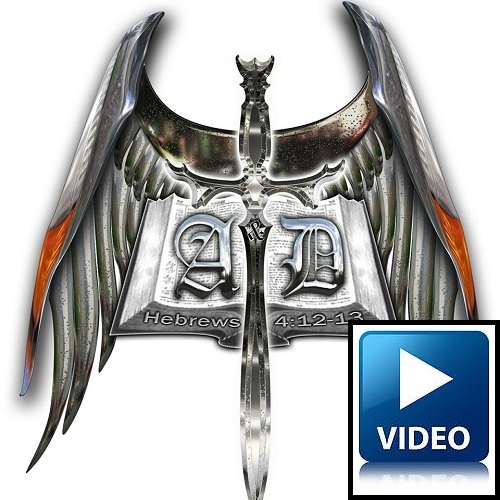 Here's some video from the band at A&D Biker Ministries in Racine, Wisconsin. The Sheboygan County Fair Praise Celebration Tent featured three days of Christian music including Therefore Go, River Rock, What About Monday, Death Defeated, Praise Fellowship, Generations, Revelation, ARC, Forever Amen, Open to Grace, Danen Kane, As Issac, Methuselah, Kings Delegates, Onion River, Gibbsville Choir, Standing Firm, Pine Haven Mens Chorus, on earth and The Cody Clauson Band. 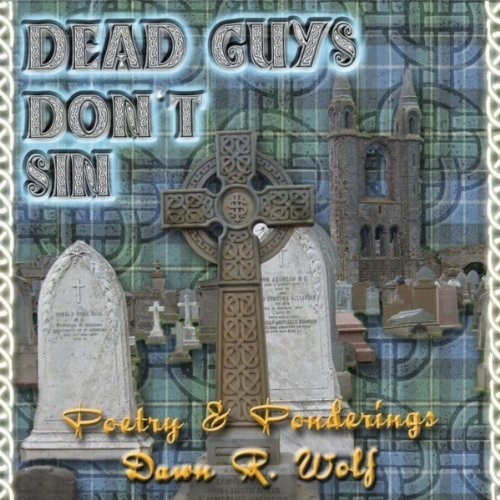 Dawn R. Wolf of Wisconsin's MPK Christian Celtic Band released the Dead Guys Don't Sin CD in 2013. 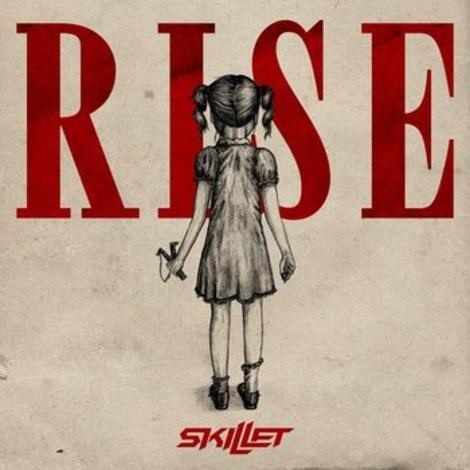 Kenosha, Wisconsin based national recording artist Skillet released their ninth album Rise in 2013. 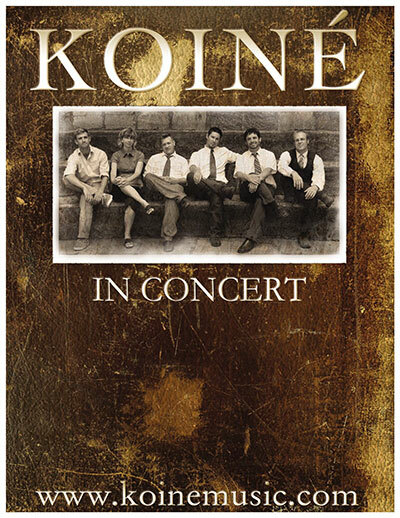 Congratulations to the 2013 Wisconsin Area Music Industry (WAMI) Awards Christian/Gospel Artist Winner Koiné! Other nominees included Danen Kane, Lightswitch, Michelle Posey and Standing Firm, Saved By Grace and The Burie Family. 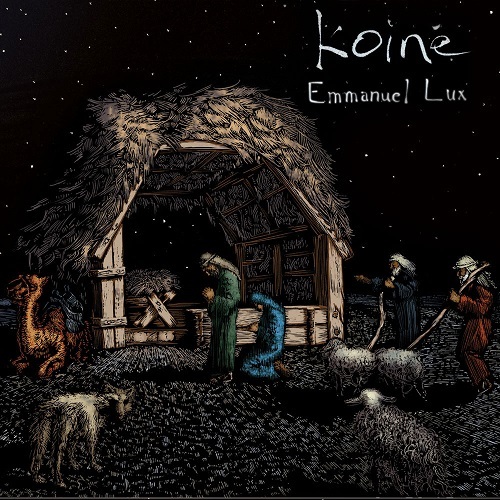 Milwaukee's Koiné released their Emmanuel Lux CD just in time for Christmas 2012. 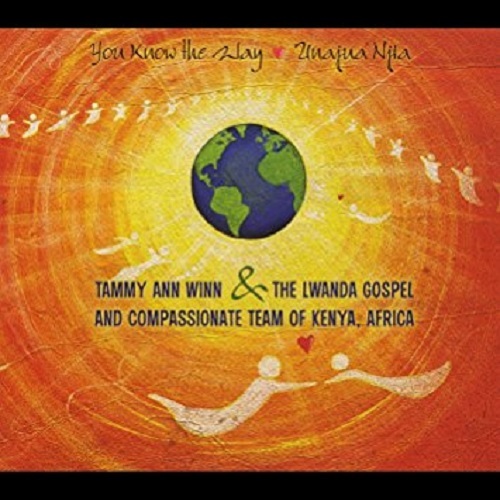 The You Know the Way - Unajua Njia EP features original, soulful pop songs - two from singer-songwriter Tammy Ann Winn, and three by The Lwanda Gospel and Compassionate Team of Kenya, Africa. 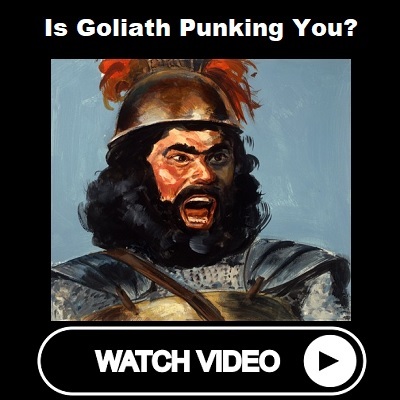 Together, their message is thought-provoking, uplifting and real. 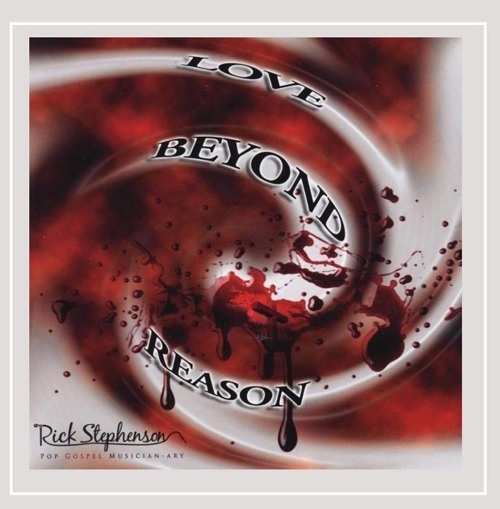 Rick Stephenson out of Johnson Creek, Wisconsin released his Love Beyond Reason CD in 2012. Check out the review in the Nashville Music News. 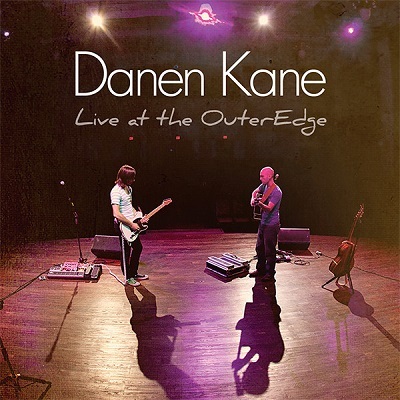 Danen Kane out of Appleton, Wisconsin released Live at the Outer Edge in 2012. Milwaukee's Death Defeated was victorious in the praise tent at the 2012 Sheboygan County Fair. Chad James and Reach Out, Oak Creek's own praise band, played at Circuit 35 Fest in Oak Creek, Wisconsin. 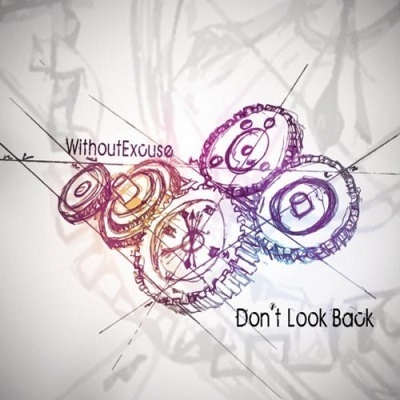 In 2012, WithoutExcuse out of Wausau, Wisconsin released Don't Look Back. 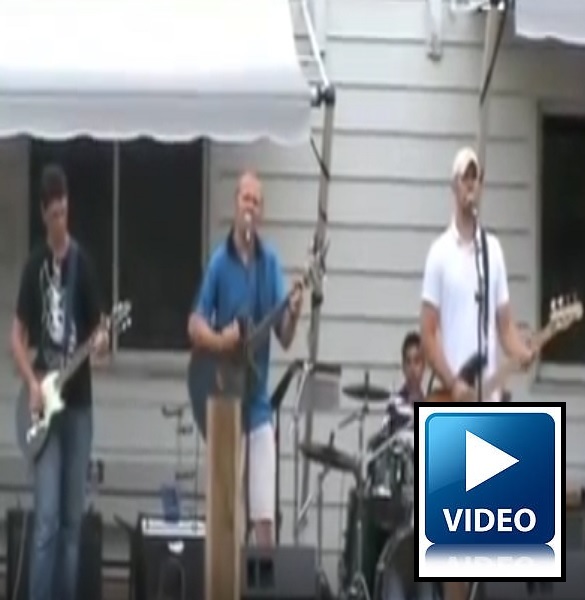 When Christian band Saved by Grace played the Summerfest Rock Stage in 2012, one of the highlights included Gina Rome sharing the song Keeping My Eyes On You. 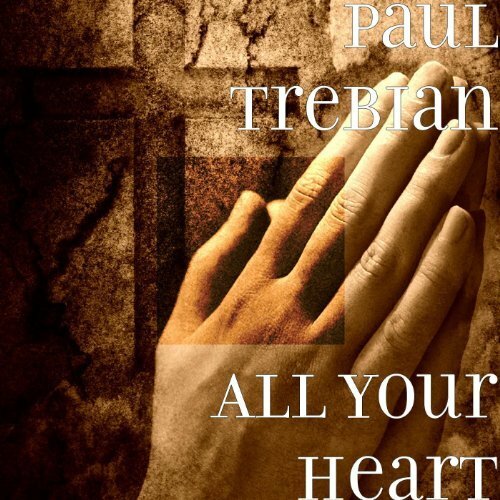 Paul F. Trebian released All Your Heart in 2012. Congratulations to the 2012 Wisconsin Area Music Industry (WAMI) Awards Christian/Gospel Artist Winner The Burie Family! 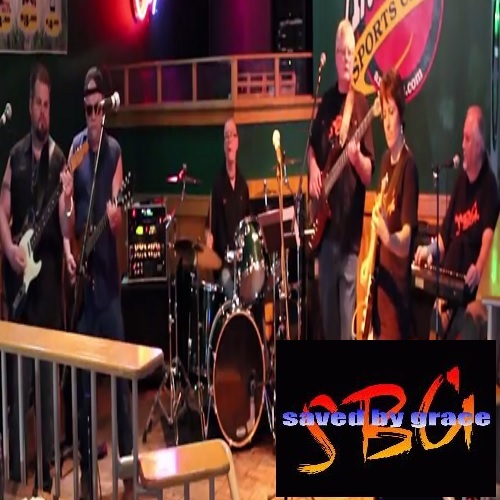 Saved by Grace at Downtown Alive! Christian rockers Saved By Grace out of Milwaukee performed "David's Boogie" at Anduzzi's in Appleton, Wisconsin as part of the 2012 Downtown Alive! WAMI Music Series. 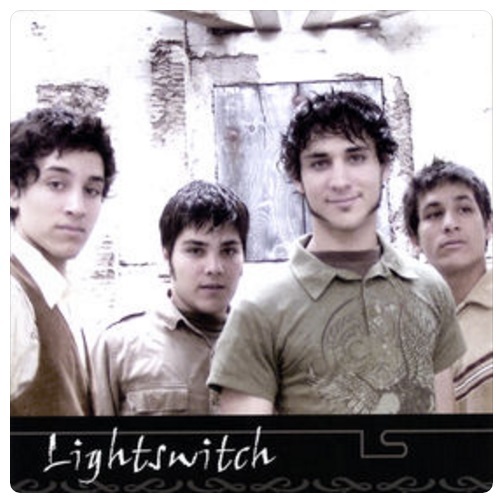 Multi-lingual Spring Valley, Wisconsin band Lightswitch released the CD Holding On in both English and Spanish versions. 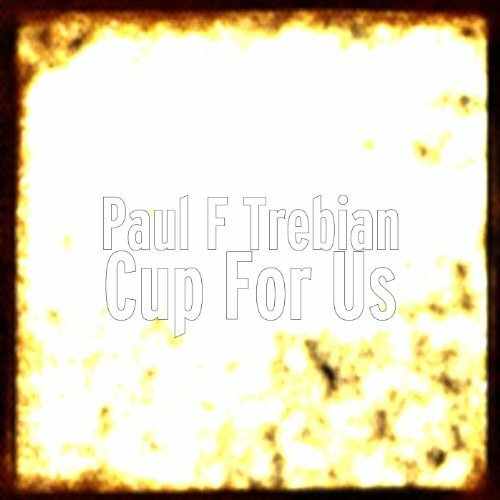 Paul F. Trebian released Cup For Us in 2011. 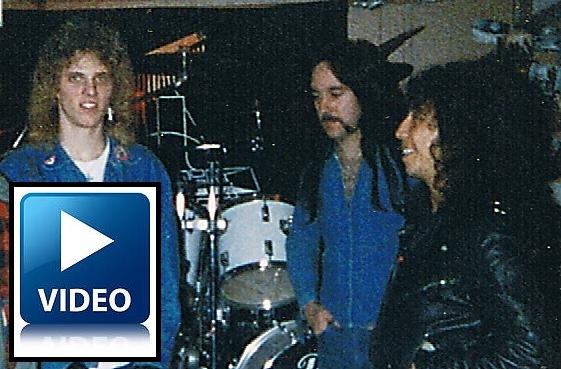 Vin Vanderweele, Kyle Abts and Dan Johnston of the classic 80's Christian Metal Band Scarlet Rayne got together again to play their title track Scarlet Rayne at Rooters in Waukesha, Wisconsin. 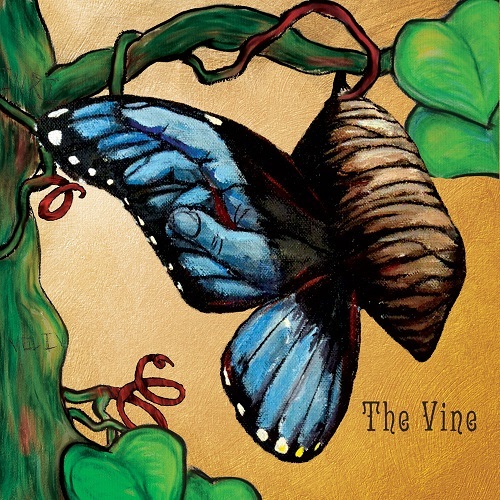 Milwaukee's Koiné released The Vine (Vol IV) CD in 2011. 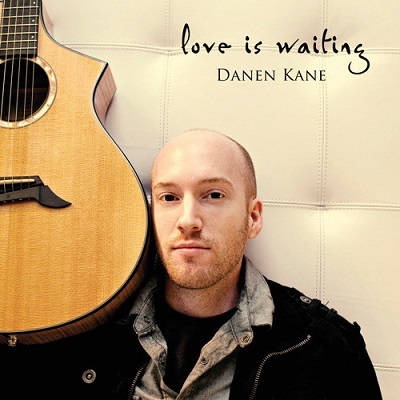 Danen Kane out of Appleton, Wisconsin released his fourth full length studio album in 2011 entitled Love Is Waiting. Congratulations to the 2011 Wisconsin Area Music Industry (WAMI) Awards Christian/Gospel Artist Winner Saved by Grace! Other nominees included A City Alive, Chad James and Skillet. In addition, Christian singer Danny Gokey was nominated in the Artist of the Year category. 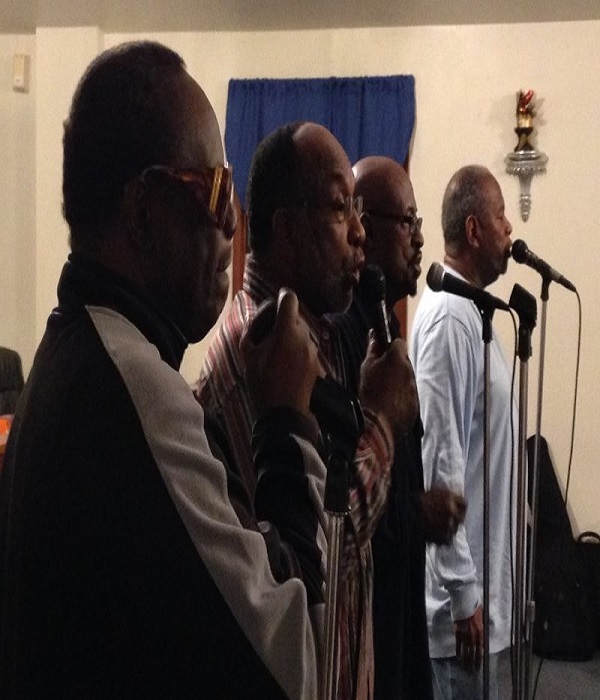 Milwaukee's Beacon Music Ministry was live at the Holy Grounds Cafe in Glendale, Wisconsin. 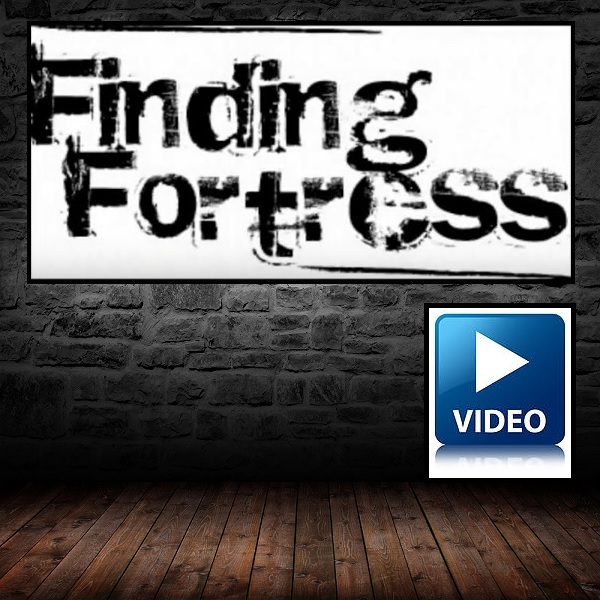 Finding Fortress brought in the new year with their song Waiting live in Watertown, Wisconsin. 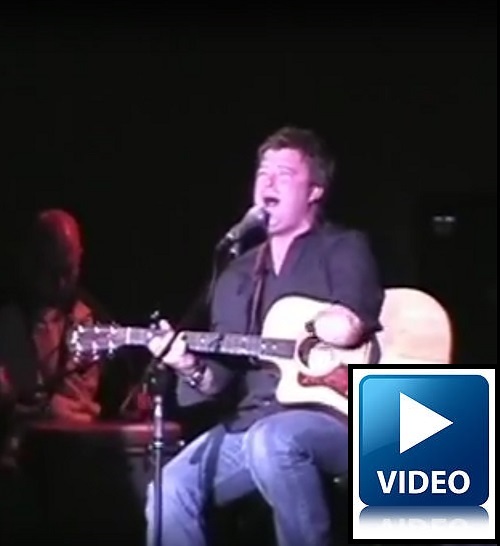 If you like that one, there's more video from that show of the songs Here With Me and For You. 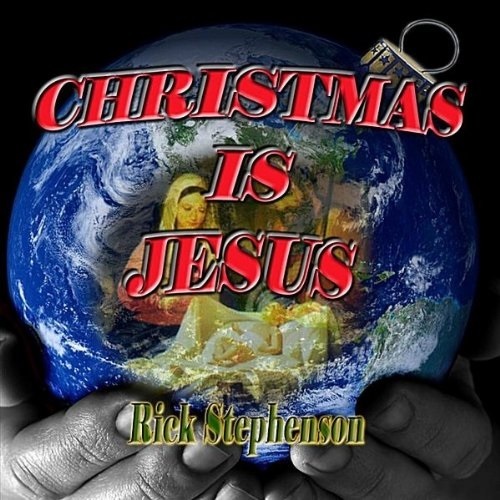 Rick Stephenson out of Johnson Creek, Wisconsin released his Christmas is Jesus CD in 2010. Calling Deep reveals the charm of Tammy Ann Winn's modern folk-pop style, through poignant lyrics and organic compositions. Wisconsin's MPK Christian Celtic Band released their Almost Home CD in 2010. 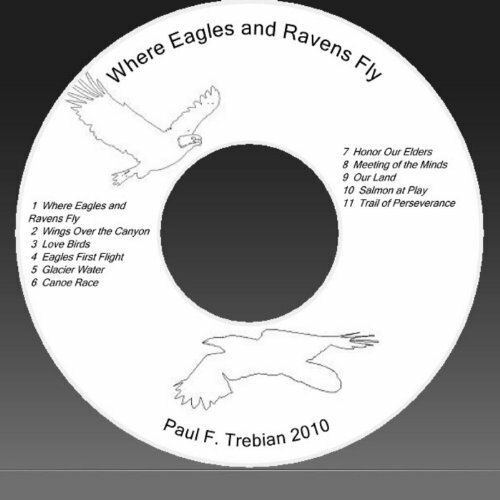 Paul F. Trebian released Where Eagles and Ravens Fly in 2010. 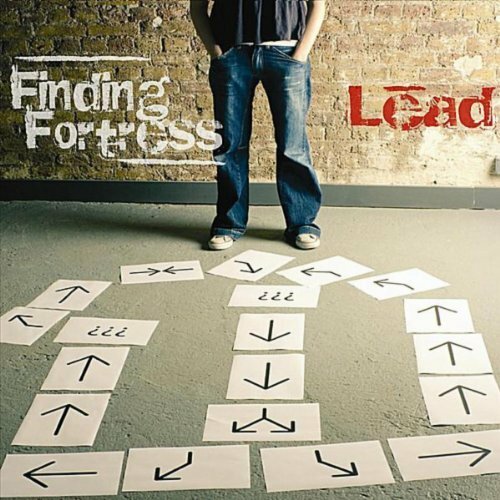 Finding Fortress out of Sparta, Wisconsin released their debut album entitled Lead. Fun fact: Brendan Brooks was in this band. 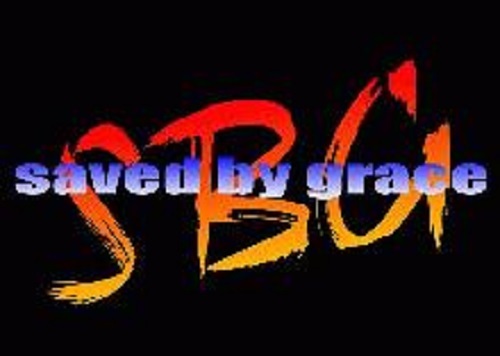 Congratulations to the 2010 Wisconsin Area Music Industry (WAMI) Awards Christian/Gospel Artist Winner Saved by Grace! Christian singer Danny Gokey won in the Male Vocalist of the Year category. 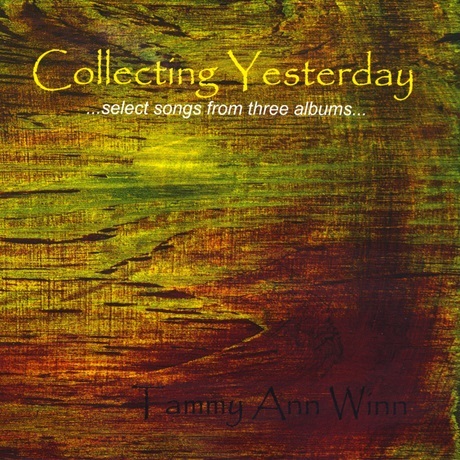 Tammy Ann Winn's Collecting Yesterday compilation features select songs from three albums, demonstrating poignant lyrical poetry and soulful delivery. 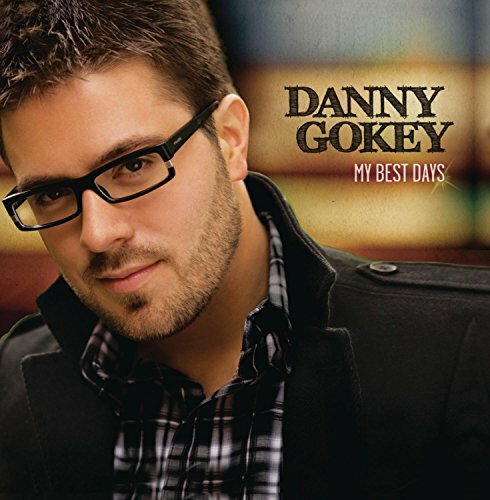 The first studio album from Danny Gokey, an American Idol contestant and Jesus lovin' Milwaukee native, is entitled My Best Days. 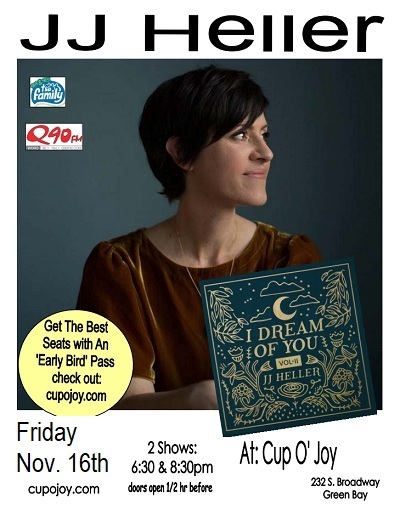 Lauren Lee shared a beautiful live version of Maybe at the Cup O Joy in Green Bay. 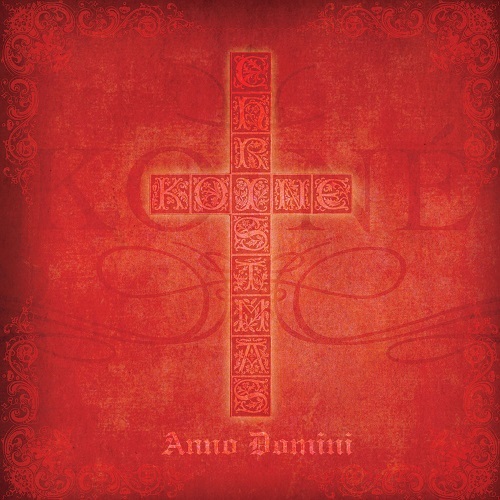 Milwaukee's Koiné released their Anno Domini CD in 2009. Finding Fortress (aka Crossover) played the title track off their upcoming album Lead in Ontario, Wisconsin. For more songs from this show, see the whole playlist here. 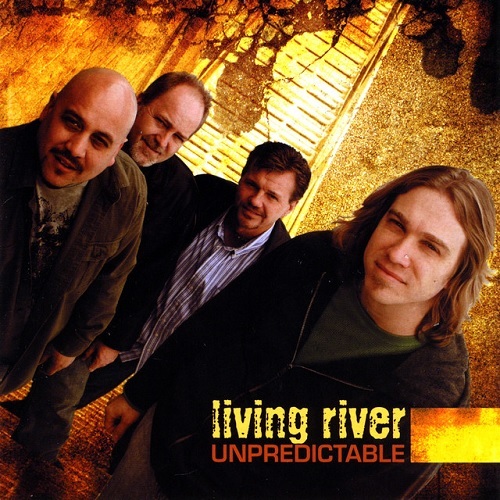 The first studio album from Wausau's Living River Gospel Quartet is entitled Unpredictable. 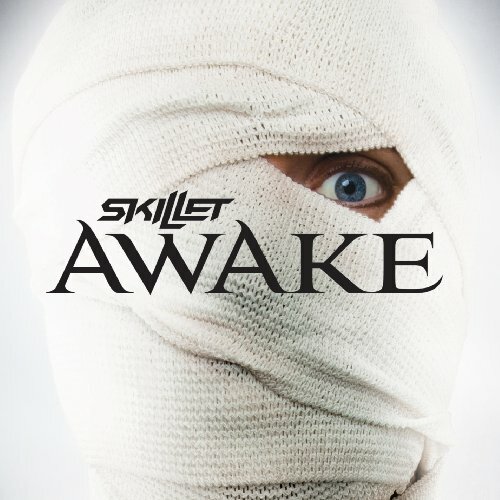 Kenosha, Wisconsin based national recording artist Skillet released their eighth album Awake in 2009. 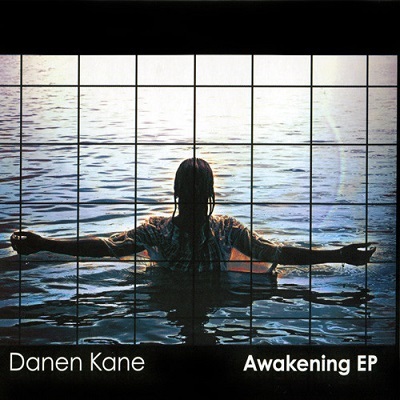 Danen Kane out of Appleton, Wisconsin released his Awakening EP in 2009. 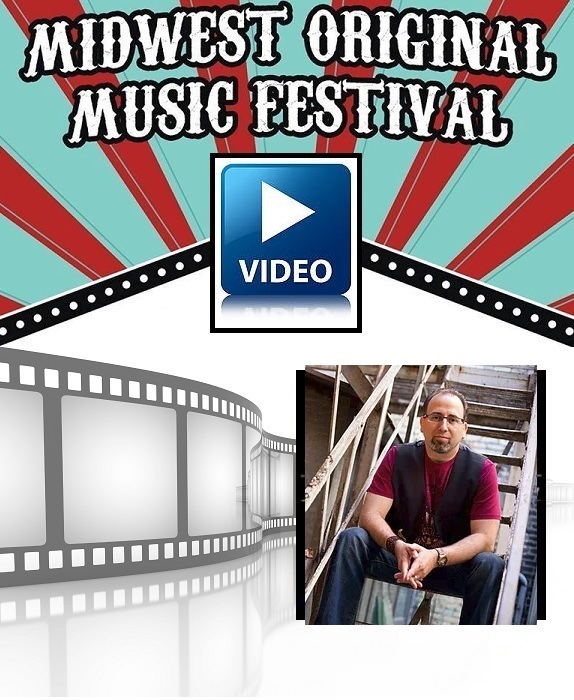 Congratulations to the 2009 Wisconsin Area Music Industry (WAMI) Awards Christian/Gospel Artist Winner Chad James! 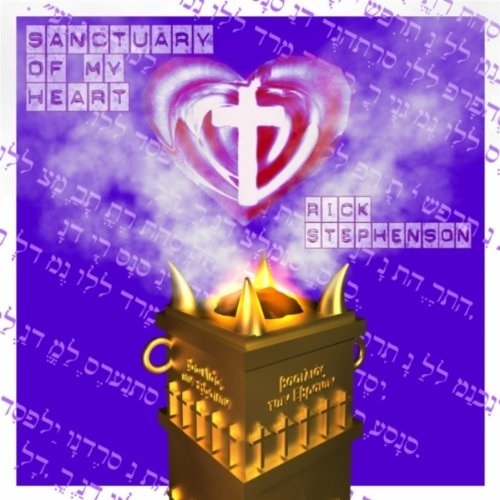 Rick Stephenson out of Johnson Creek, Wisconsin released the Sanctuary of My Heart CD in 2009. 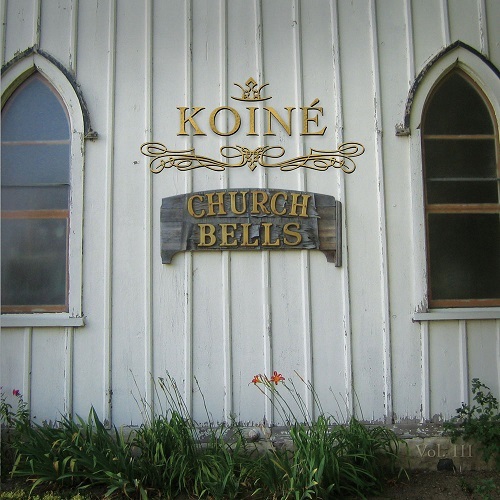 Milwaukee's Koiné released their Church Bells (Vol III) CD in 2009. Wisconsin's MPK Christian Celtic Band released their Forever Fiddling CD in 2008. 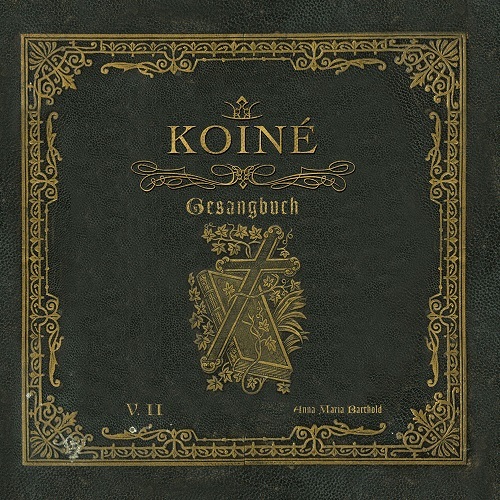 Milwaukee's Koiné released their Gesangbuch (Vol II) CD in 2008. 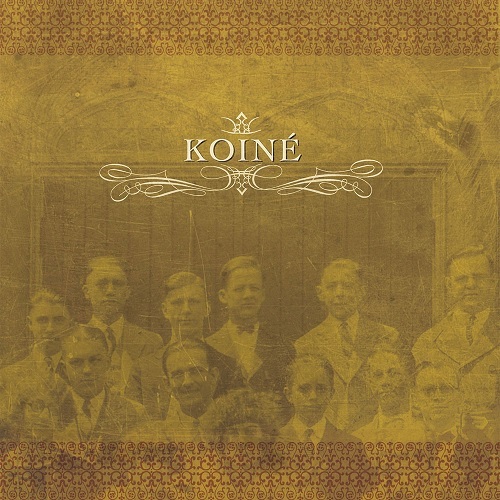 Milwaukee's legendary Koiné released their debut (Vol I) CD in 2008. 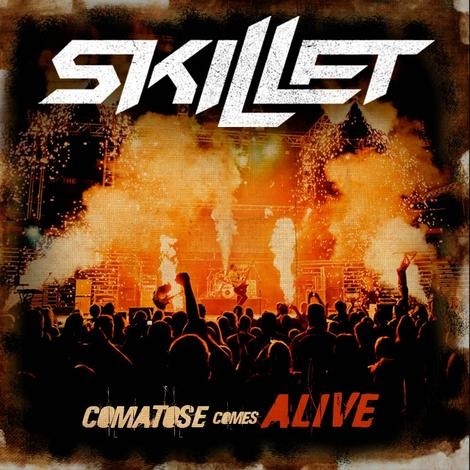 Kenosha, Wisconsin based national recording artist Skillet released their live album Comatose Comes Alive in 2008. 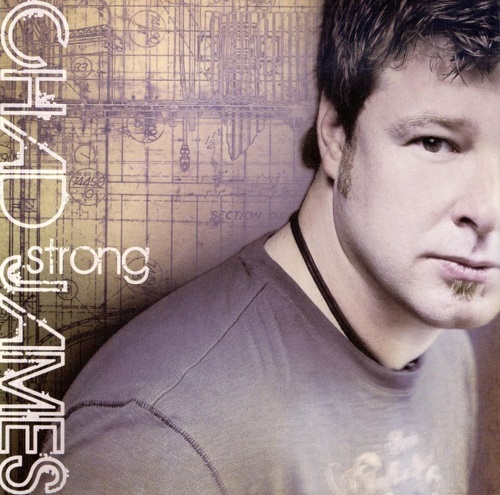 Congratulations to the 2008 Wisconsin Area Music Industry (WAMI) Awards Christian/Gospel Artist Winner Chad James! Other nominees included Gary Clausing, Skillet, United Voices of Praise and Tammy Ann Winn. 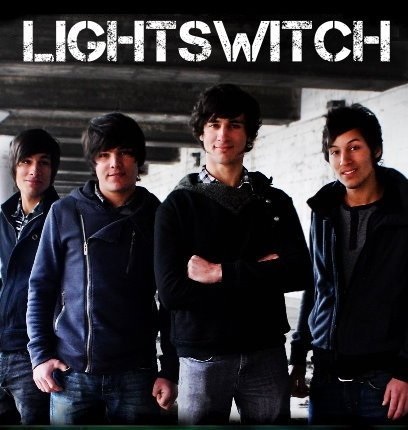 Spring Valley, Wisconsin band Lightswitch released their debut CD in 2007. 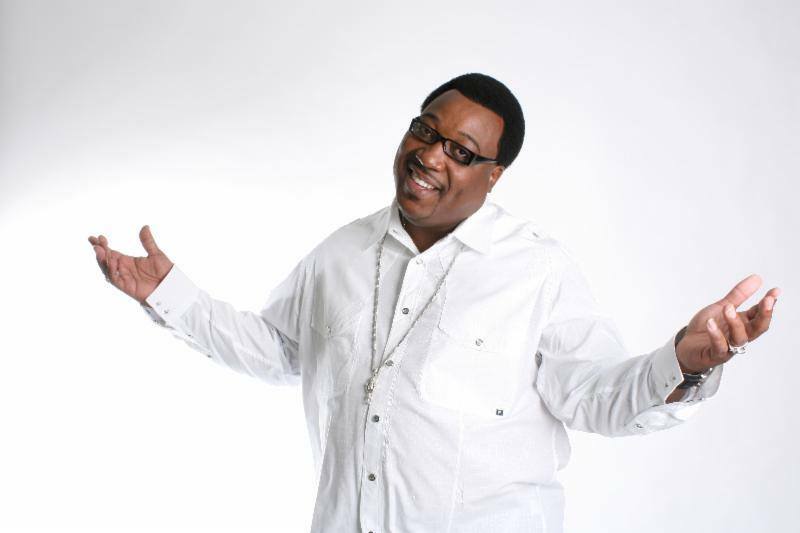 Congratulations to the 2007 Wisconsin Area Music Industry (WAMI) Awards Christian/Gospel Artist Winner Rodney Cunningham! Other nominees included All Saints Gospel Choir, J4 and 2 High. 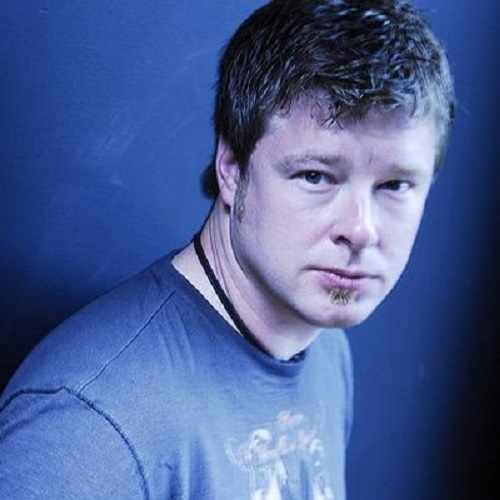 East Troy, Wisconsin's Chad James released his Strong CD on Creative Soul Records. Danen Kane out of Appleton, Wisconsin released his third full length studio album in 2006 entitled She. 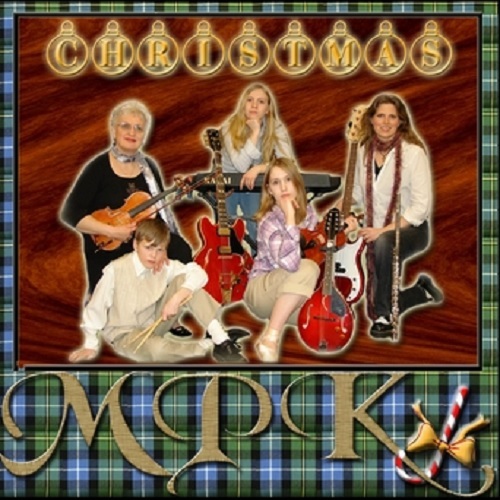 Wisconsin's MPK Christian Celtic Band released their Christmas CD in 2006. 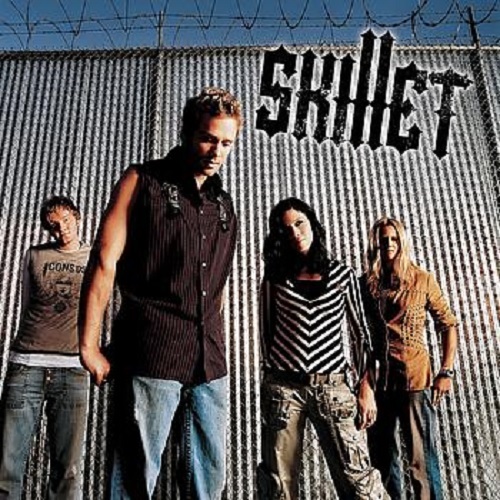 Kenosha, Wisconsin based national recording artist Skillet released their seventh album Comatose in 2006. 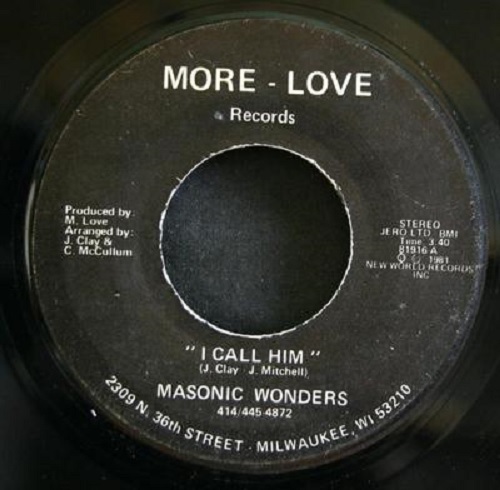 Milwaukee's Masonic Wonders had their single "I Call Him" included on the compilation CD Good God! A Gospel Funk Hymnal. Congratulations to the 2006 Wisconsin Area Music Industry (WAMI) Awards Christian/Gospel Artist Winner Tammy Ann Winn! 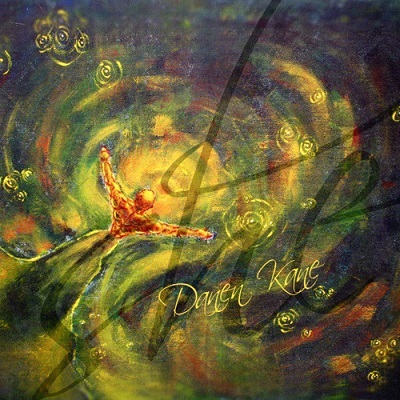 Other nominees included Koiné, Skillet and Winds of Fate. 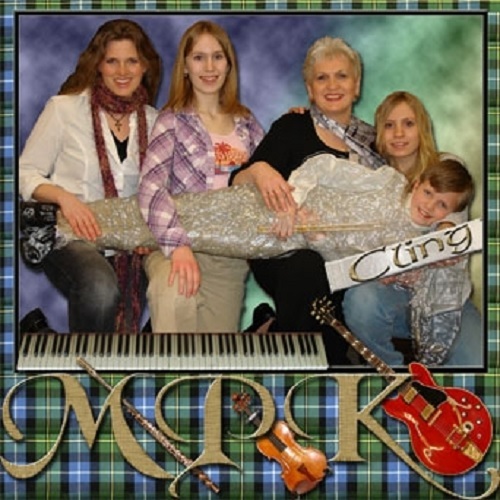 Wisconsin's MPK Christian Celtic Band released their debut album named Cling CD in 2006. 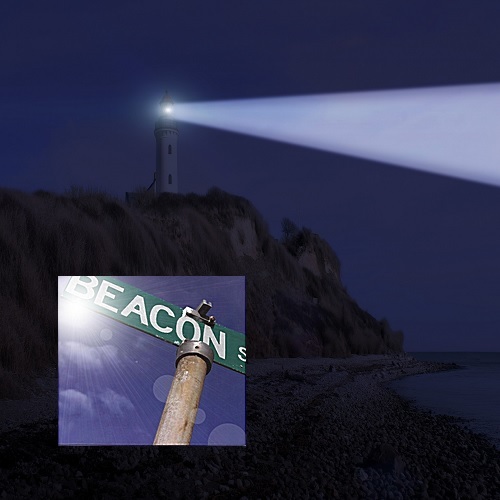 The first release from Milwaukee's Beacon Music Ministry is entitled Beacon. 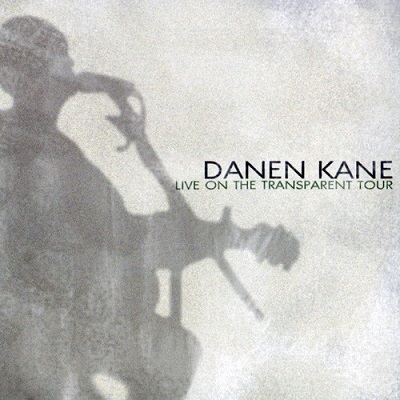 Danen Kane out of Appleton, Wisconsin released Live on the Transparent Tour in 2005. 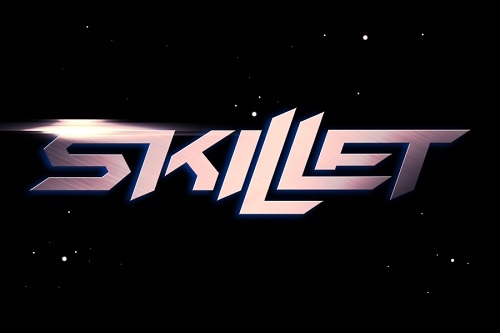 Congratulations to the 2005 Wisconsin Area Music Industry (WAMI) Awards Christian/Gospel Artist Winner Skillet! 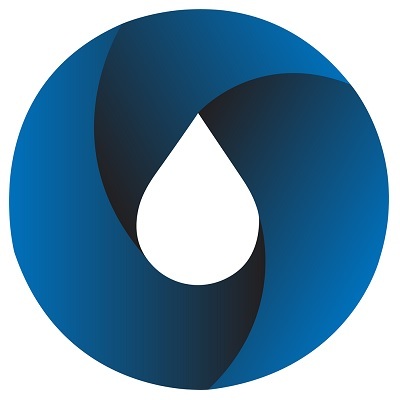 Other nominees included Emerge, Spirit Creek, Winds of Fate and Tammy Ann Winn. Danen Kane out of Appleton, Wisconsin released his second full length studio album in 2004 entitled Transparent. 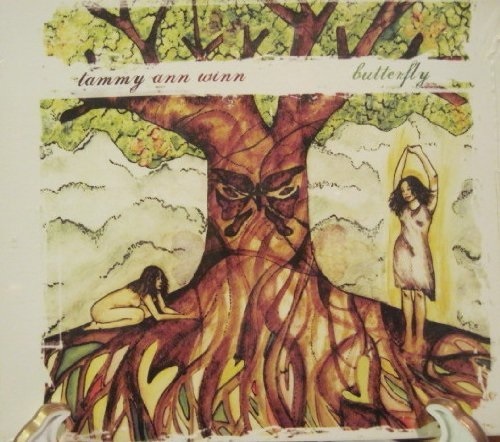 Butterfly celebrates Tammy Ann Winn's eclectic style with original pop-rock compositions. Congratulations to the 2004 Wisconsin Area Music Industry (WAMI) Awards Christian/Gospel Artist Winner Tammy Ann Winn! 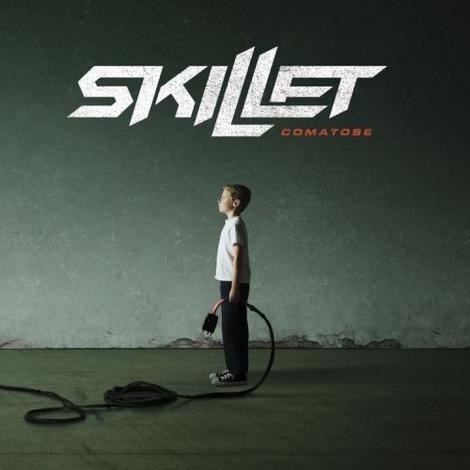 Other nominees included Skillet, Spirit Creek and Winds of Fate. 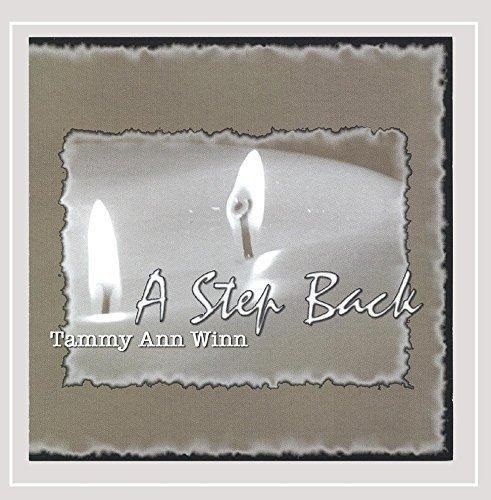 A Step Back is a stripped down, intimate, acoustic collection of original music that Tammy released in December of 2003. 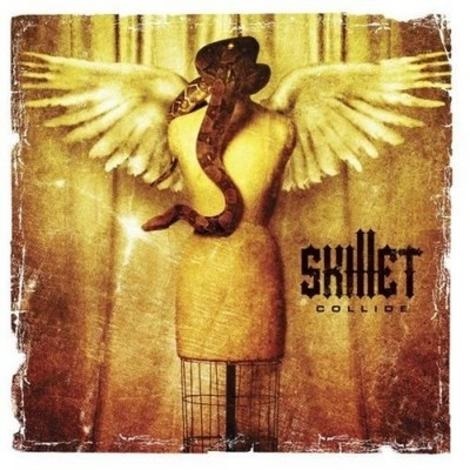 Kenosha, Wisconsin based national recording artist Skillet released their sixth album Collide in 2003. Danen Kane out of Appleton, Wisconsin released his first full length studio album in 2003 entitled Take Glory from Our Praise. Congratulations to the 2003 Wisconsin Area Music Industry (WAMI) Awards Christian/Gospel Artist Winner Skillet! Other nominees included Called By Him, Evidence, Hangnail and Tammy Winn and Westwind. 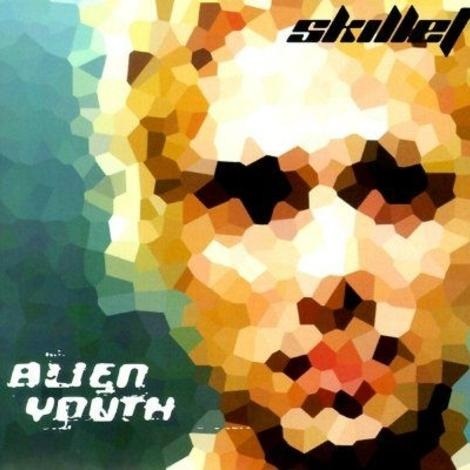 Kenosha, Wisconsin based national recording artist Skillet released their fifth album Alien Youth in 2001. 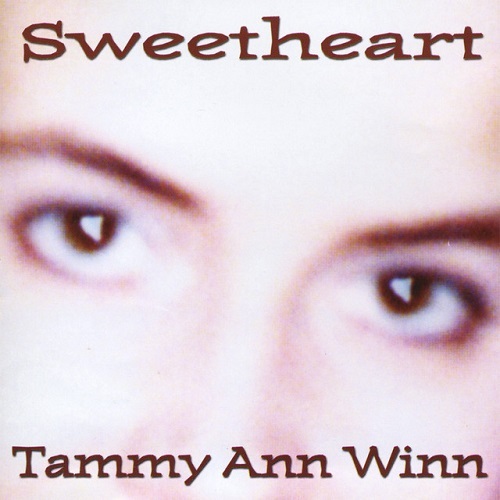 Sweetheart consists of 9 original tunes and a sentimental performance of the classic cover song "Let Me Call You Sweetheart" that Tammy Ann Winn sings with her beloved dad Jim Winn. 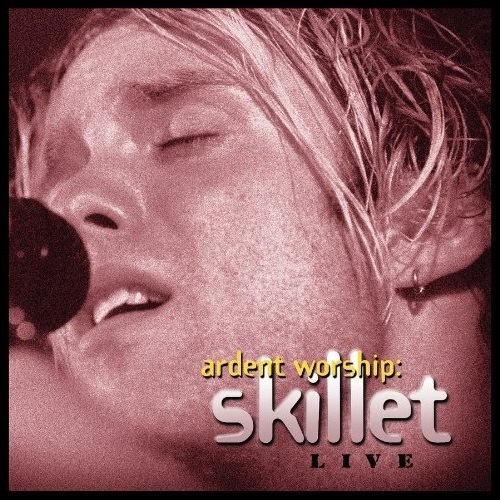 Kenosha, Wisconsin based national recording artist Skillet released their fourth album Ardent Worship in 2000. 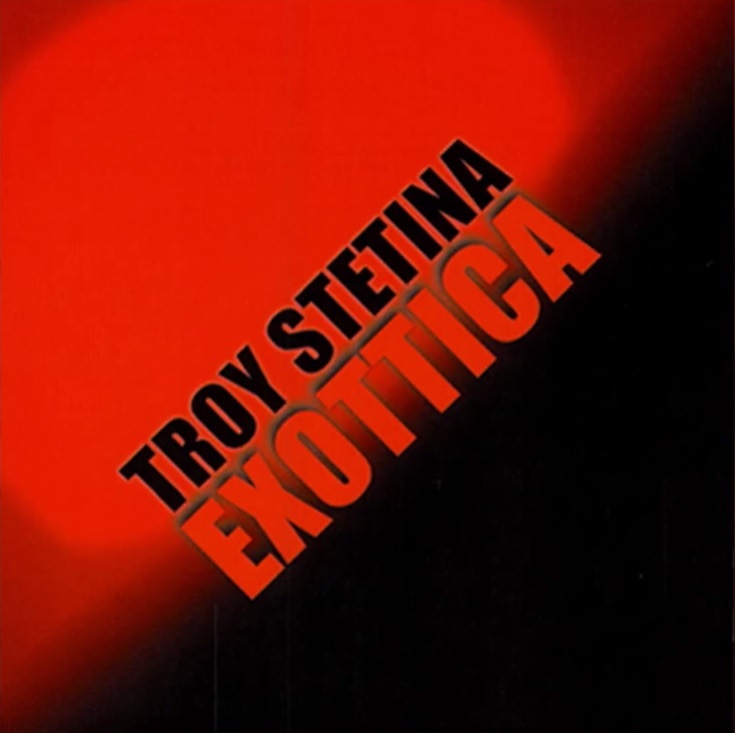 A lot of you love the guitar playing of Troy Stetina, the Minister of Music at Crimson Way Church in Elm Grove, Wisconsin. 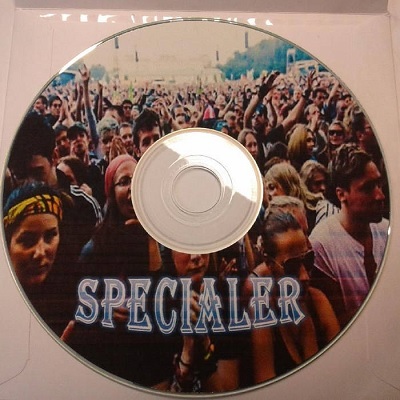 If you're one of those people, you definitely want to check out his instrumental album Exottica. 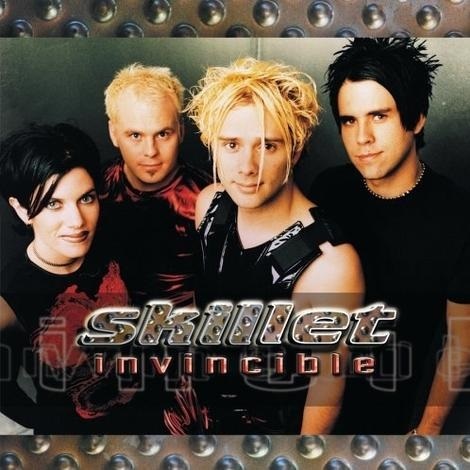 Kenosha, Wisconsin based national recording artist Skillet released their third album Invincible in 2000. Congratulations to the 2000 Wisconsin Area Music Industry (WAMI) Awards Christian/Gospel Artist Winner the Divine Redeemer Church Praise Band! Other nominees included Long Way Round, Marquette University Gospel Band, Masonic Wonders and Queens of Harmony. Milwaukee's Masonic Wonders "Wake Up Call" CD was published on Charm School Records in 1999. Congratulations to the 1999 Wisconsin Area Music Industry (WAMI) Awards Gospel Group/Artist Winner the Masonic Wonders! Other nominees included Eavaugn High, Edifying Luckett Echo and Long Way Round. 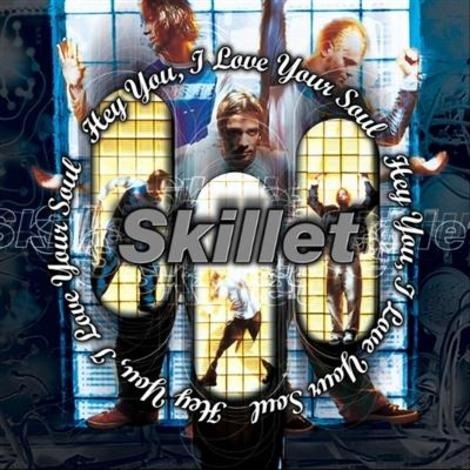 Kenosha, Wisconsin based national recording artist Skillet released their second album Hey You, I Love Your Soul in 1998. Congratulations to the 1998 Wisconsin Area Music Industry (WAMI) Awards Gospel Group/Artist Winner Masonic Wonders! Other nominees honored at the awards show held at the Rave in Milwaukee included the Latimore Brothers, Cicely Childs, Marquette University Choir and Unity in the Community. 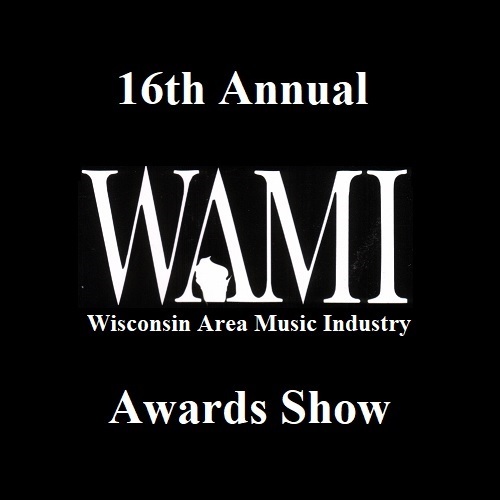 Congratulations to the 1997 Wisconsin Area Music Industry (WAMI) Awards Gospel Group or Artist of the Year nominees: Latimore Brothers, Marquette University Choir, Masonic Wonders, Unity in the Community and the Wisconsin Youth Choir! If you know who won, please contact us! 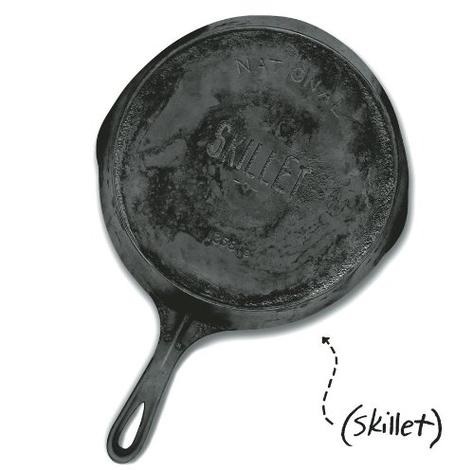 Kenosha, Wisconsin based national recording artist Skillet released their self-titled debut album Skillet in 1996. 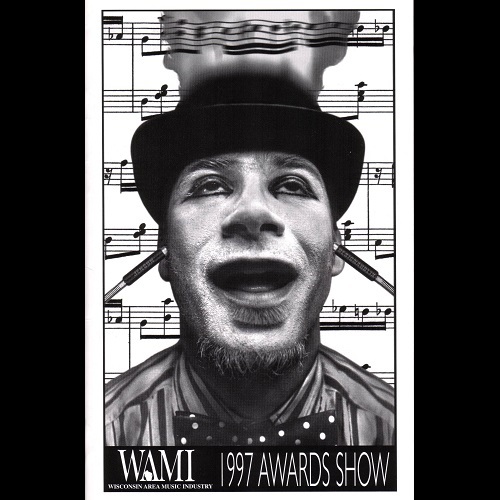 Congratulations to the 1996 Wisconsin Area Music Industry (WAMI) Awards Gospel Group or Artist of the Year nominees: Generations in Jazz, Latimore Brothers, Marquette University Gospel Choir, Masonic Wonders and Unity in the Community! If you know who won, please contact us! 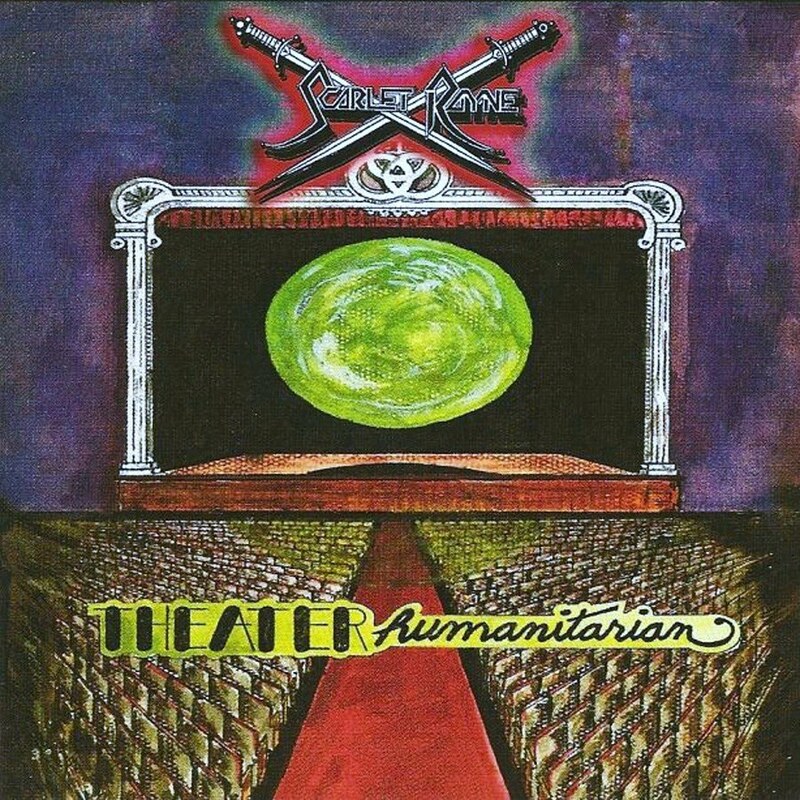 Theater Humanitarian is the first full-length album recorded by Milwaukee's classic Christian power metal band Scarlet Rayne. 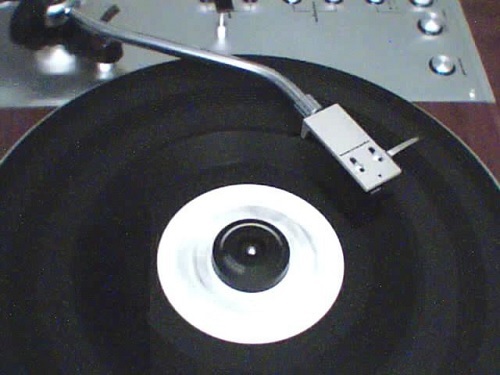 Milwaukee's Masonic Wonders released "I Call Him" on on a 7-inch 45 rpm record that had the song "The Storm Is Passing Over" on the B side. 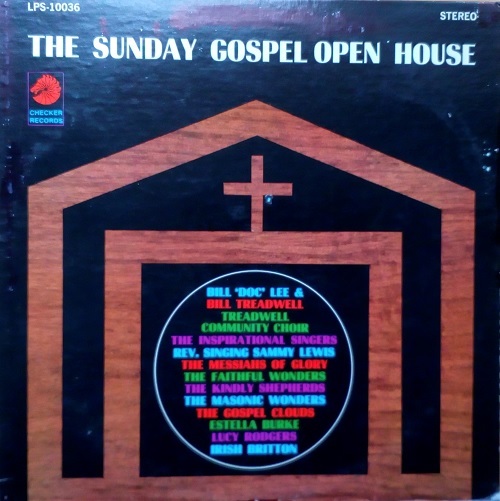 The Masonic Wonders out of Milwaukee, Wisconsin were featured on the 1968 compilation album The Sunday Gospel Open House. 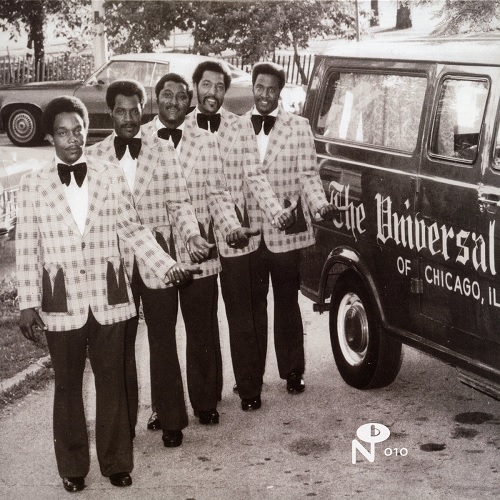 Way back in 1967, Milwaukee's Masonic Wonders released their first single! 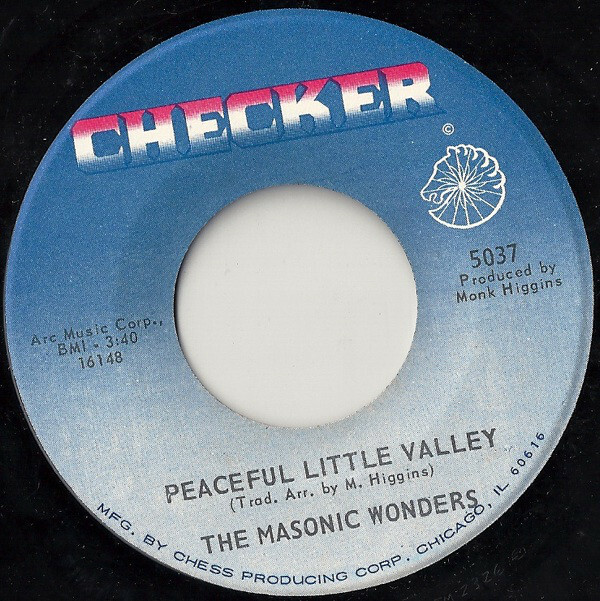 It was a beautiful 7-inch 45 rpm record by Checker that had the song "Peaceful Little Valley" on one side and "Just To Behold His Face" on other side. Milwaukee's Masonic Wonders first album was named "Higher in the Lord." 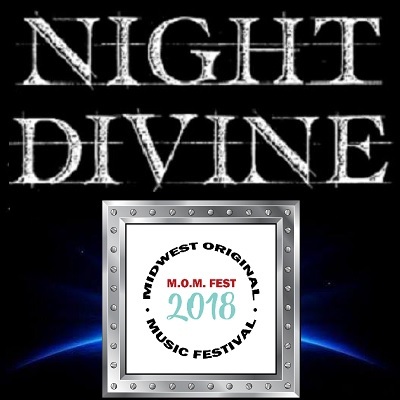 The Night Divine Newsvine connects you decades of history from Christian artists in Southeastern Wisconsin.